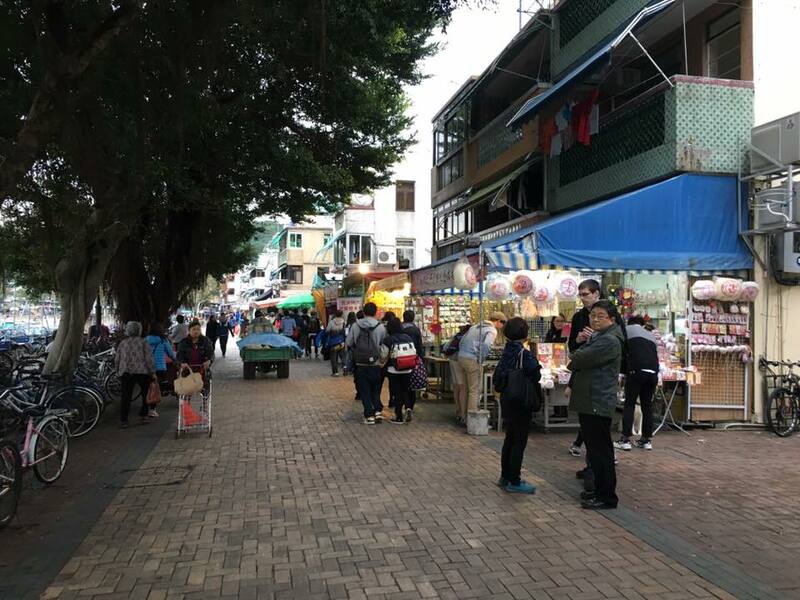 after an excellent late roast goose & congee lunch at fu kee congee 富记粥品, followed by equally enjoyable dessert at hoe kee dessert 浩记甜品馆, we walked back along fa yuen street 花园街. 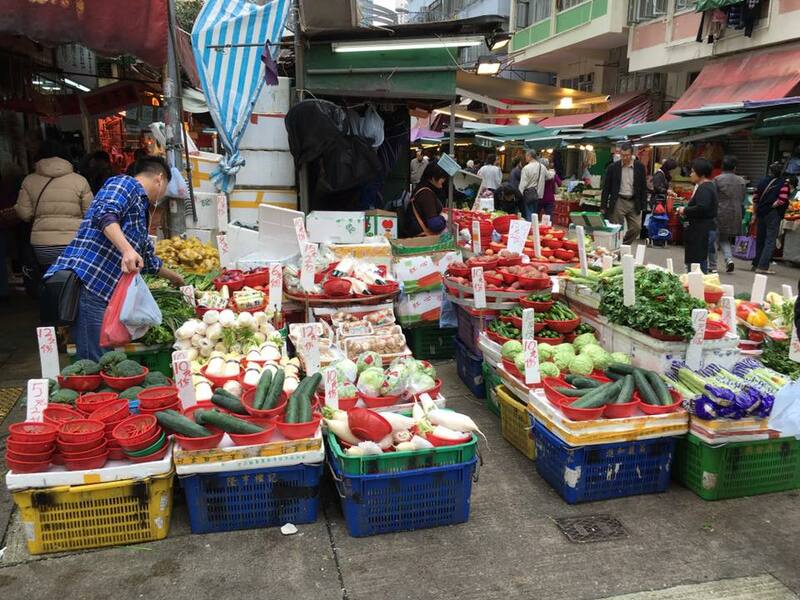 & saw the fa yuen street market 花园街街市. 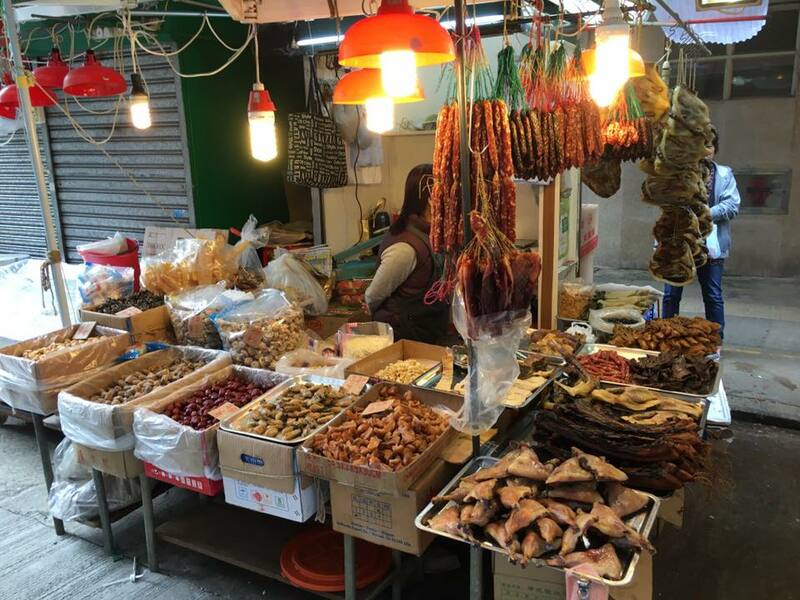 the dry goods stalls & stalls selling braised duck, chicken, pigeon, roast meats & char siew were at one end. 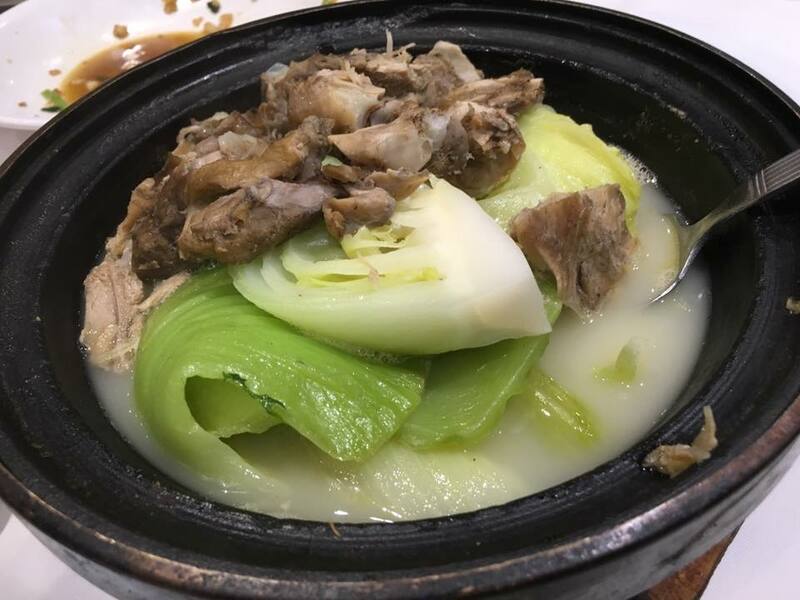 we were quite attracted to the char siew (but later poor experiences made me decide never to take char siew & siew yoke in hong kong) & also the braised meats, but we were mindful that we were going for late dinner afterwards & should not overload ourselves & spoiled the appetite. a friend wanted to buy pork & liver sausage. there were many stalls selling that, but he did not know the prices nor had confidence in the stalls. 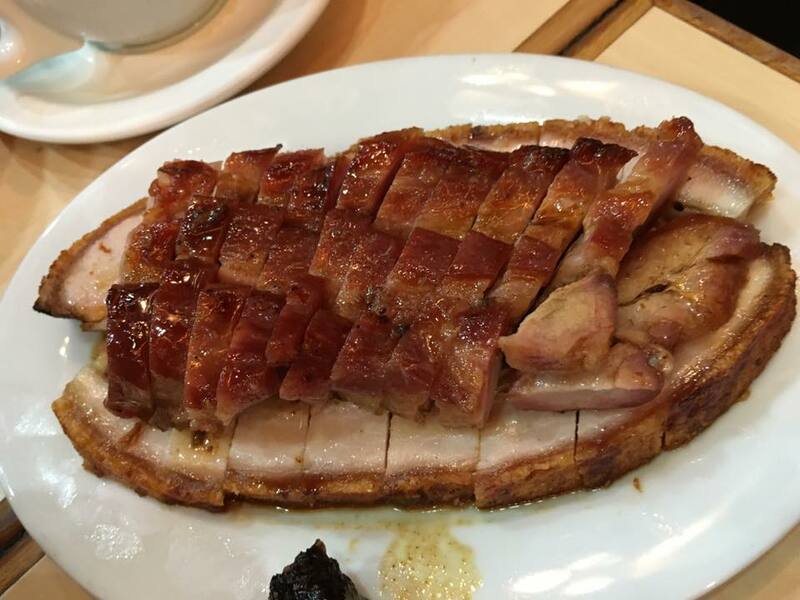 i later brought him to 楼上 at lippo sun plaza level 5 (a dry goods retail chain) where he bought lots of pork & liver sausage 肝肠腊肠. 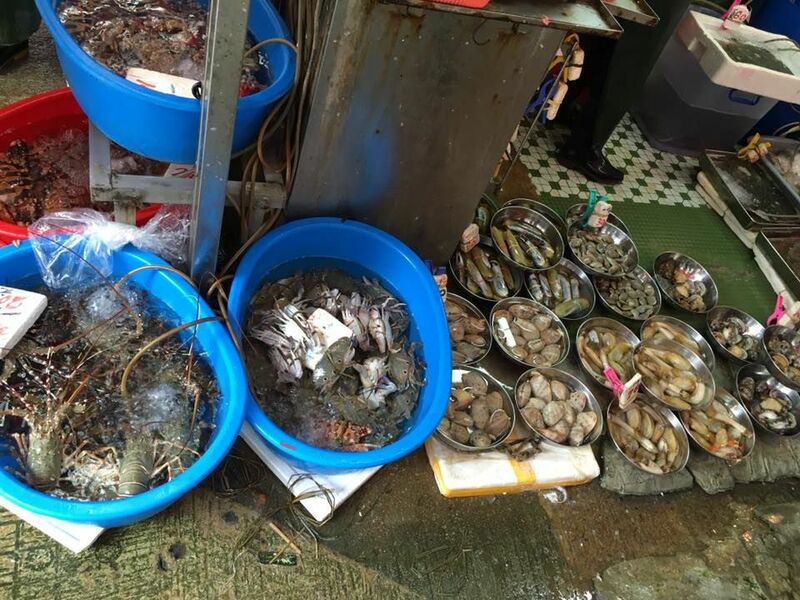 & in the middle there were the wet market stalls selling live fish & seafood (top photo & above). on 12.1.2016, we were around looking for dessert shops. 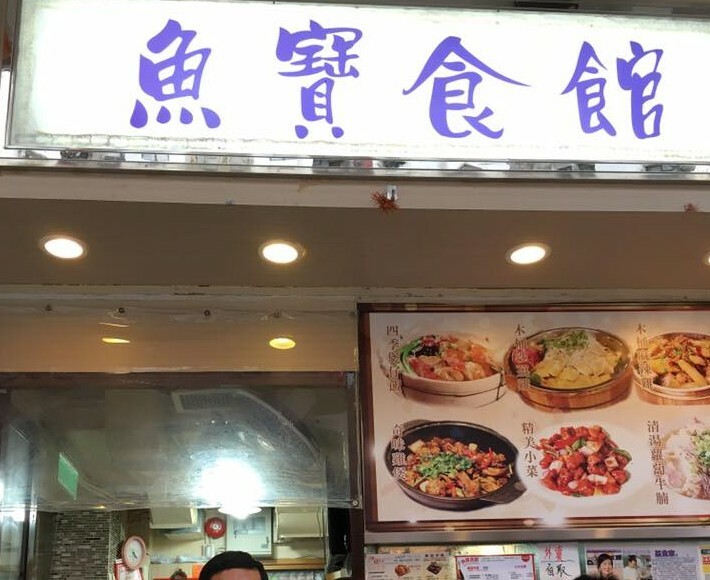 hoe kee dessert 浩记甜品馆 was closed 2 days in the row. 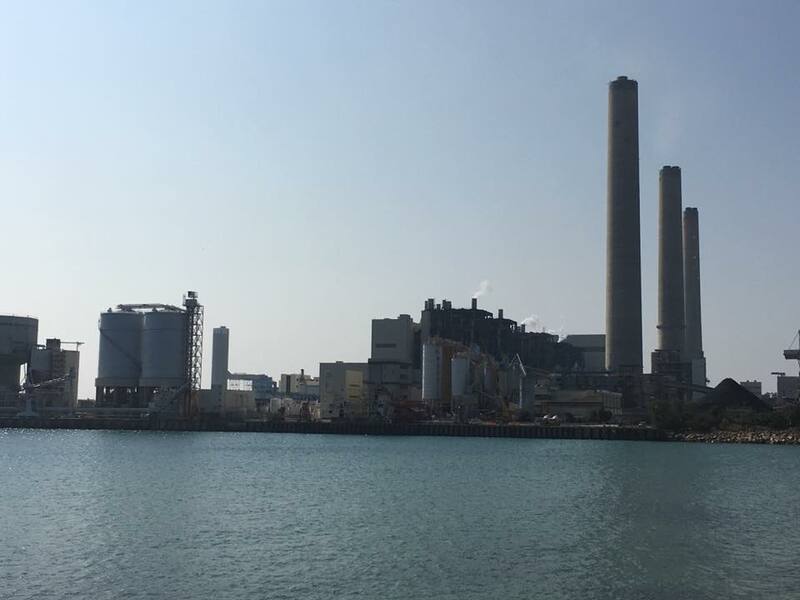 we were not interested in the guilingao龟苓膏like hoitintong 海天堂 etc. 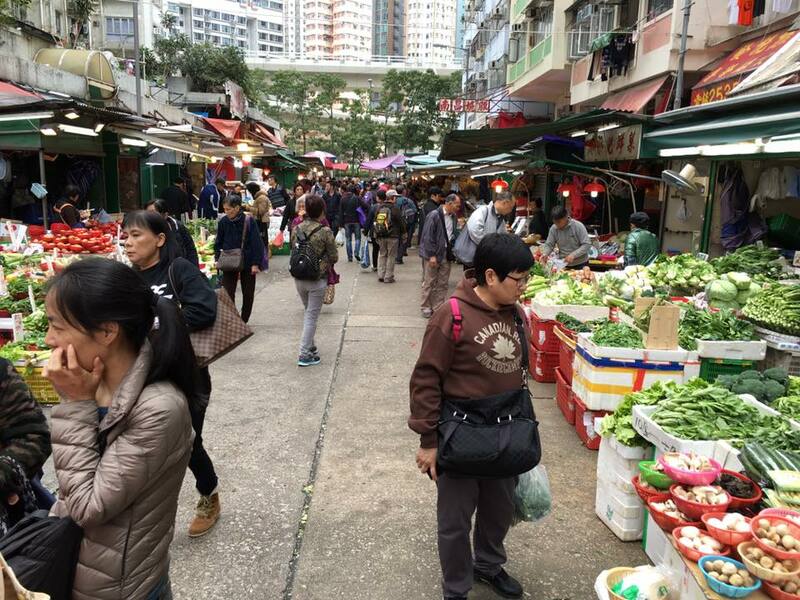 we saw that fa yuen street market 花园街街市 had levels 2 & 2 cooked food stalls. thinking they were like singapore hawker/food centres, we happily went up. but actually their cooked food centre houses daipaitongs 大排档. there were like 6 daipaitongs 大排档 selling the zi char dishes, not a bad idea, just that we were wanting desserts. 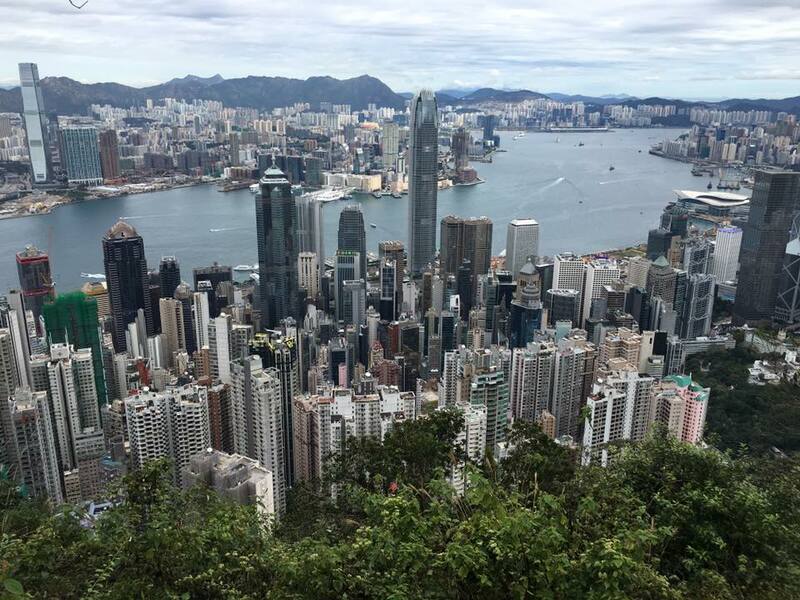 for this hong kong trip 10-14.1.2016, we looked at hotels in tsimshatsui but they were expensive. 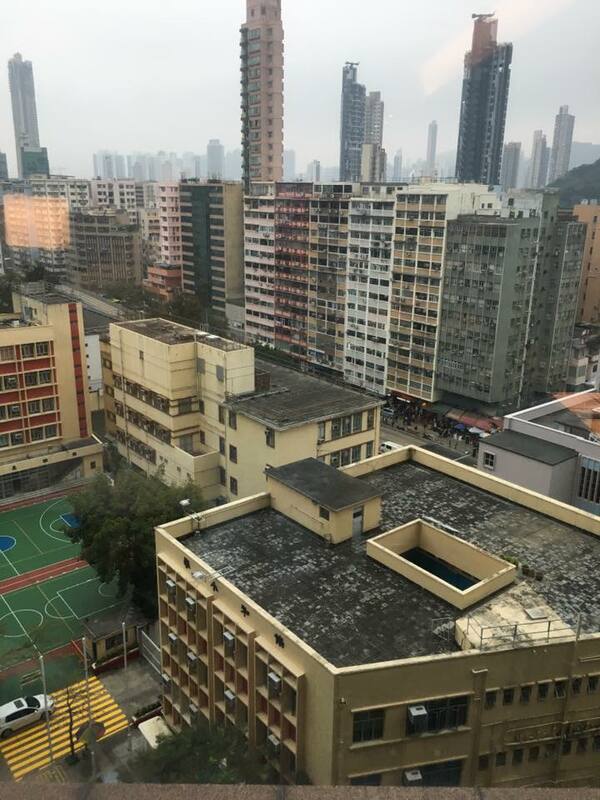 the one i stayed often when traveling with wife was kowloon hotel, next to peninsula. this time it was expensive though, & really the rooms were small & it’s 4 stars. so were other hotels at tsimshatsui, small & expensive. the last time i traveled with sister, we stayed at royal park at shatin. it was excellent 5 star hotel, & it was just HK$754+/night. 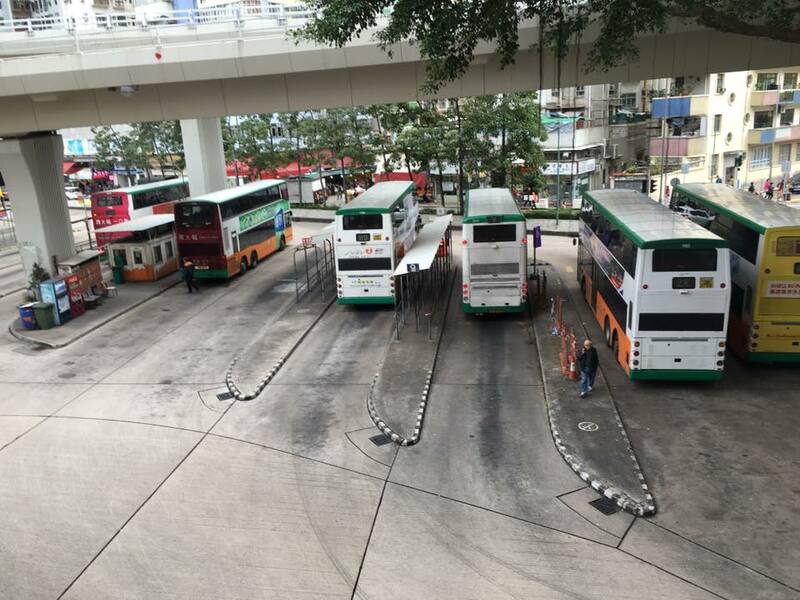 but it was a little less convenient traveling tsimshatsui & hong kong island etc. 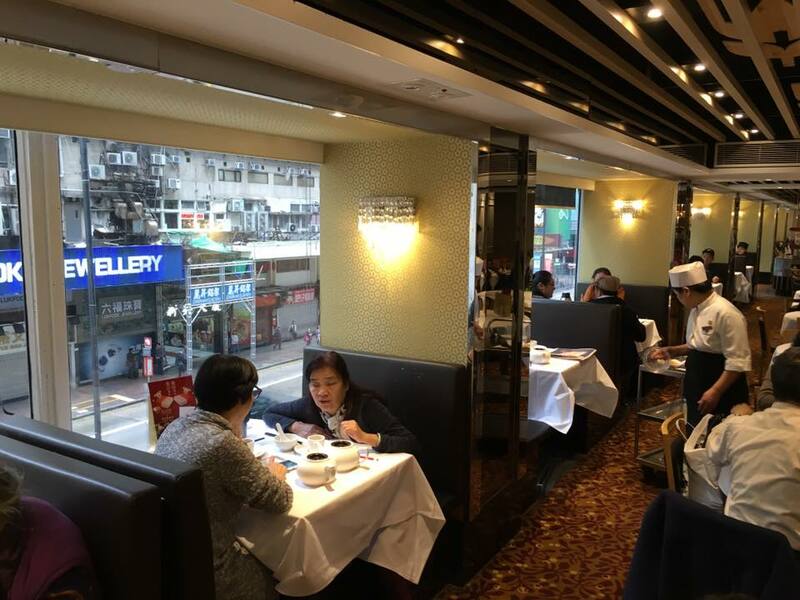 this time, after considering various options we decided on royal plaza at mongkok east, at HK$1260+/night. one friend traveling with us had his family of 4 with him & they had a tsuishatsui airbnb apartment for 1 week. 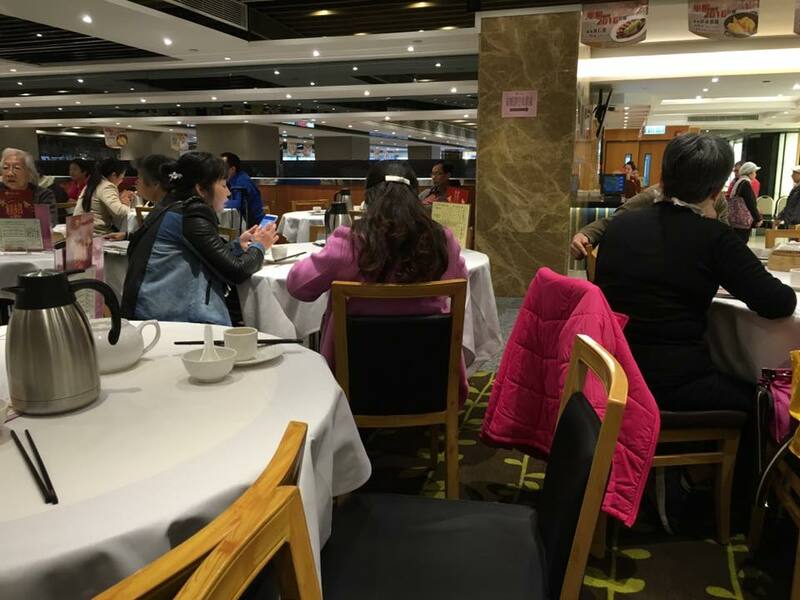 we decided not to stay at tsimshatsui but at least staying at royal plaza, it was easier to co-ordinate & meet. 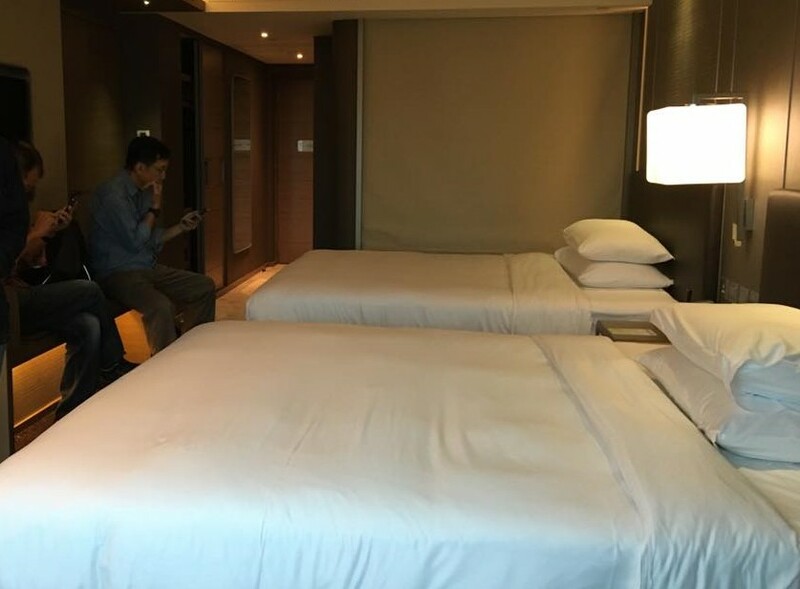 5 stars, room is huge 33m2, 2 queenbeds, very comfortable. 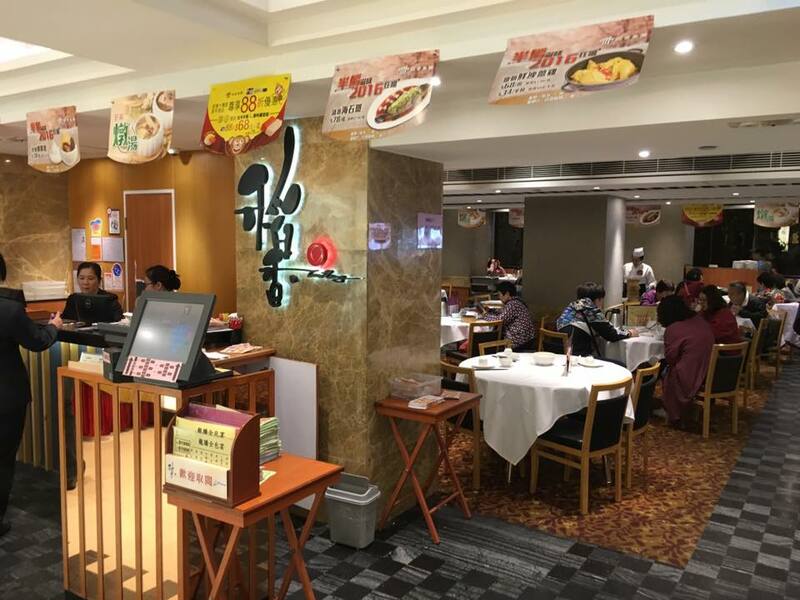 royal plaza located right at mongkok east mtr station on the east rail line, and is connected by covered walkway to mongkok mtr station on tseun wan line, and in between there is street markets, and many nice eating places. 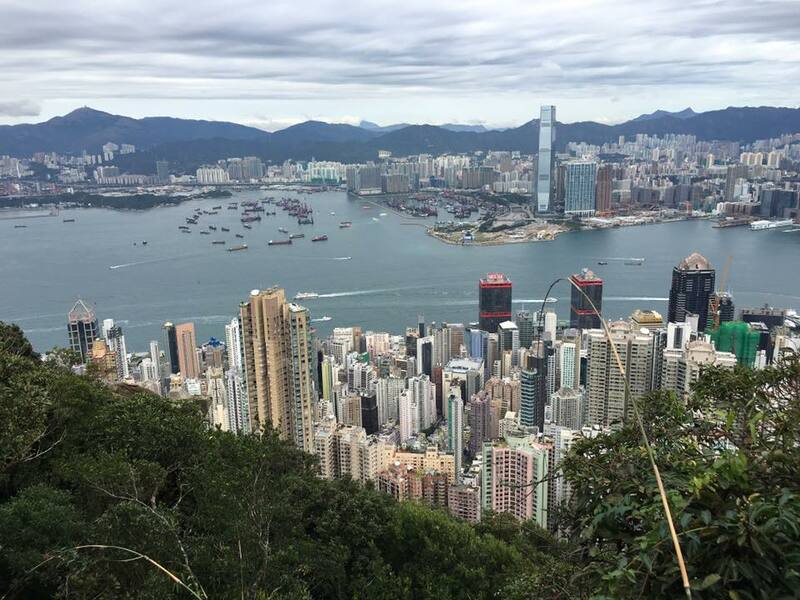 & since this time we were going mainly to tsimshatsui, central, central pier & dragon’s back, the mongkok location was quite perfect for our purpose. there were 6 of us so getting to royal plaza by taxi was quite fine, 2 taxis of 3pax, costing about HK$260, not much different from taking airport express. 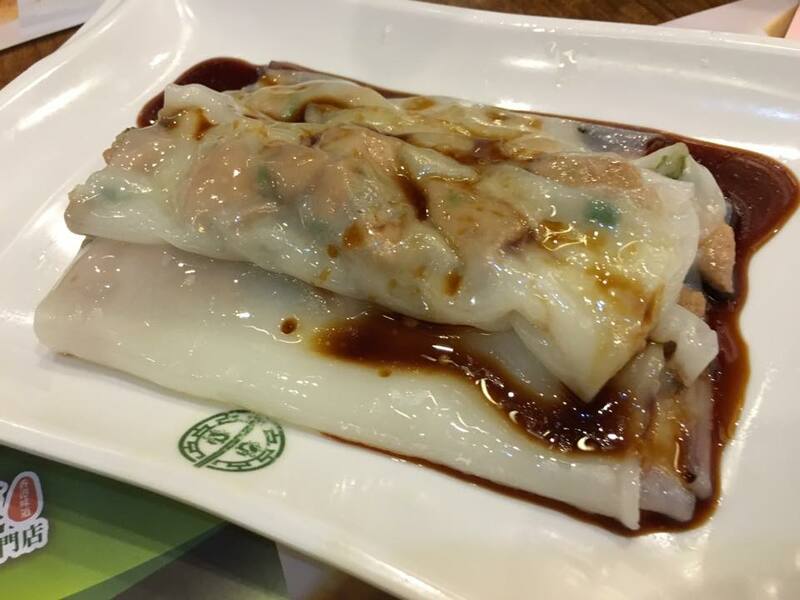 must say that though royal plaza is located alongside sun hung kai property’s MOKO Mall, we did not bother to look around the mall itself. 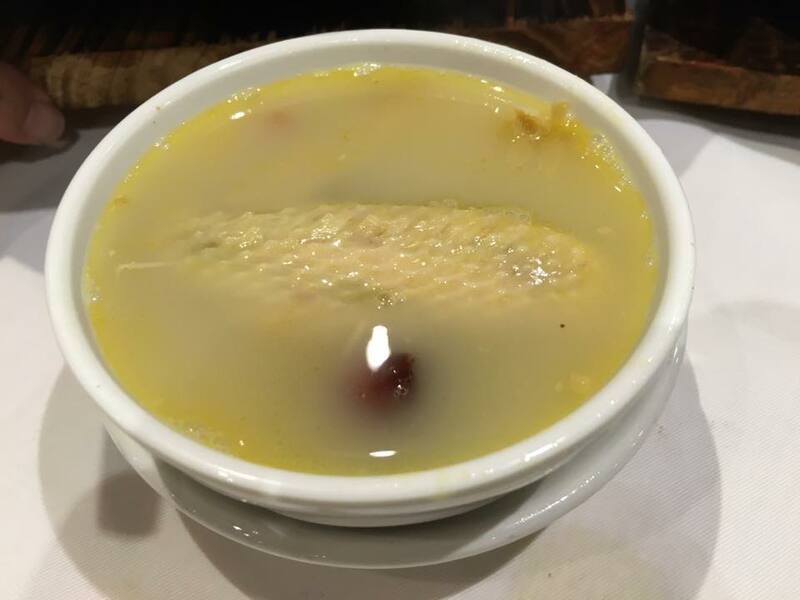 we arrived on a sunday 10.1.2016. after checking in, we went to look for fu kee congee 富记粥品 at fa yuen street 花园街. 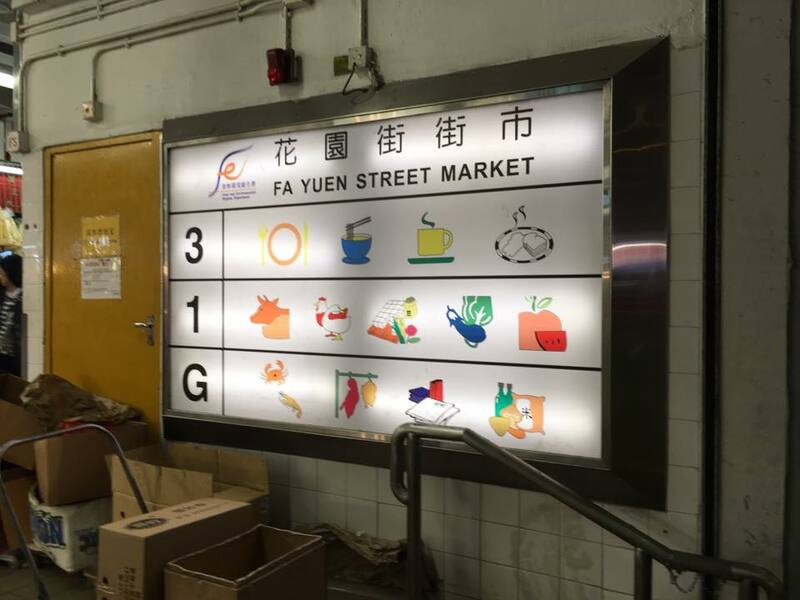 it was quite easy to look for fa yuen street 花园街, though the first time, we were quite lost trying just to get out of MOKO mall. 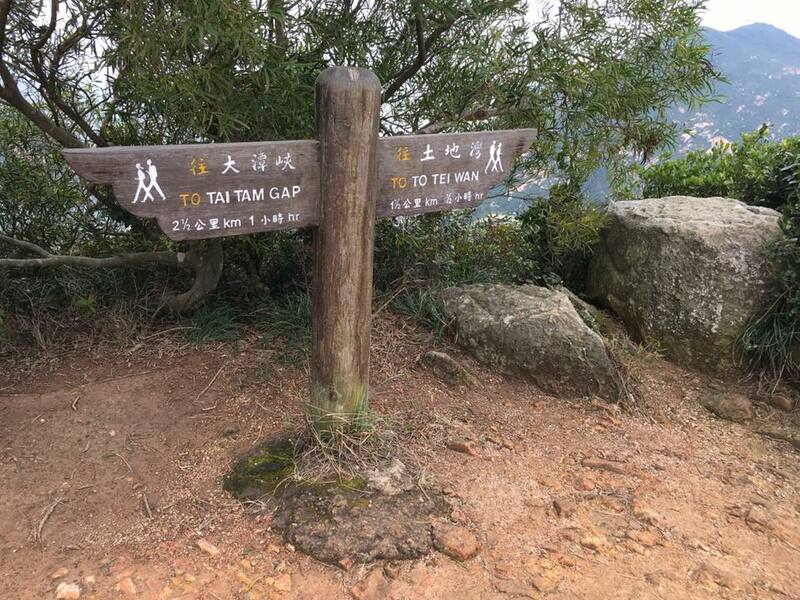 once we saw the direction signs, everything was quite straightforward. 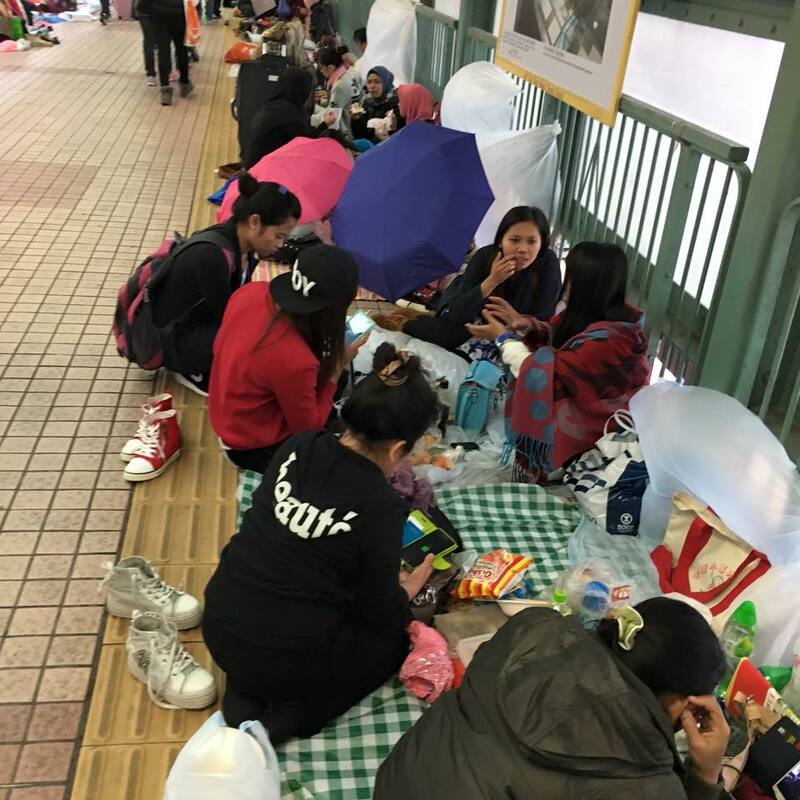 as it was a sunday, the covered walkways to mongkok mtr station & fa yuen street 花园街 enroute was filled with indo maids. 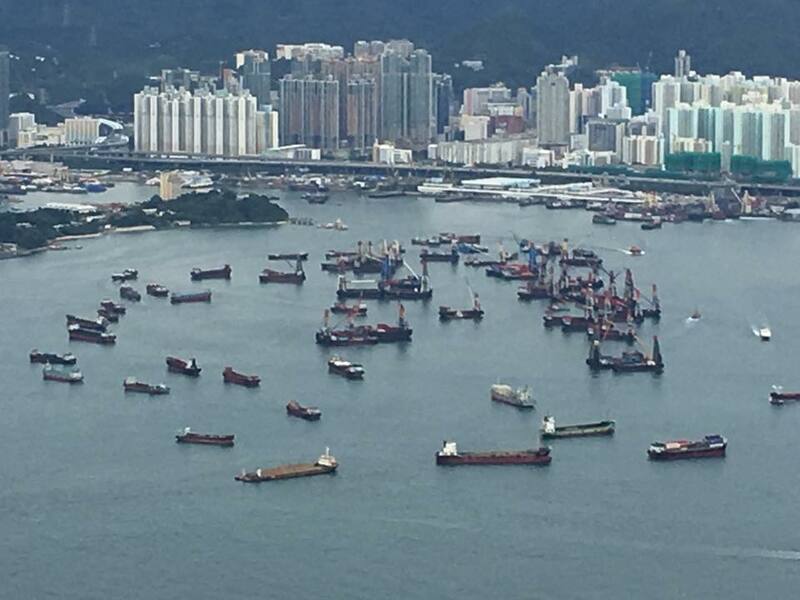 i guess in the same way as filipino maids filled up kowloon park. anyway people do need a place to gather & socialise. 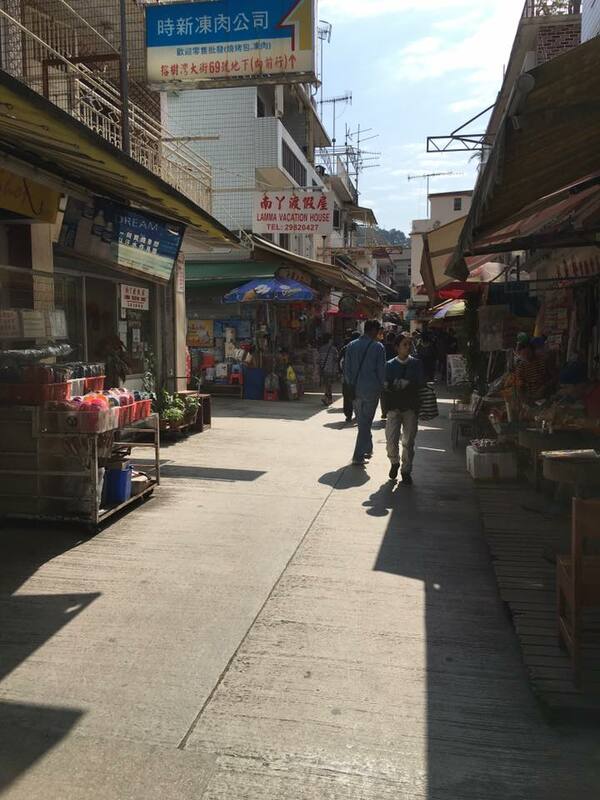 after our excellent dinner at fu kee congee 富记粥品, we walked around fa yuen street 花园街 & neighbouring streets. 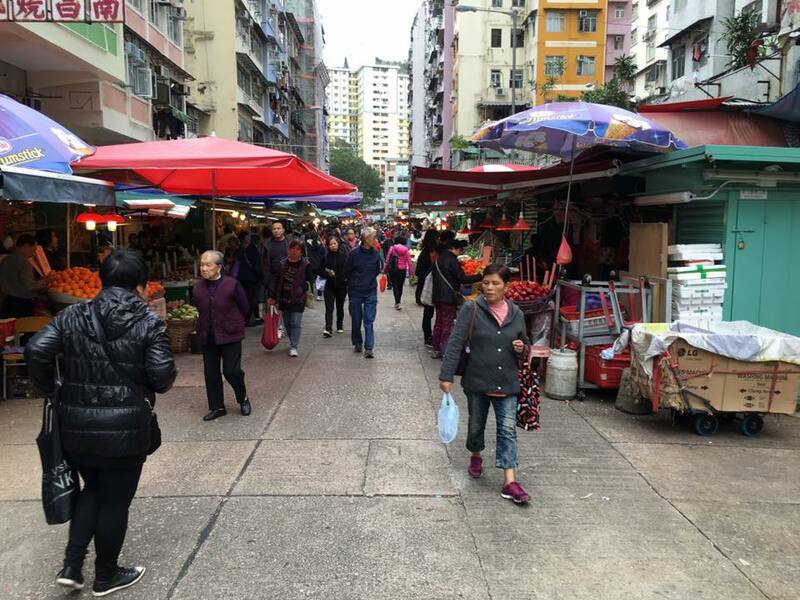 first we past the fa yuen street market 花园街街市. the we walked round the street night market. 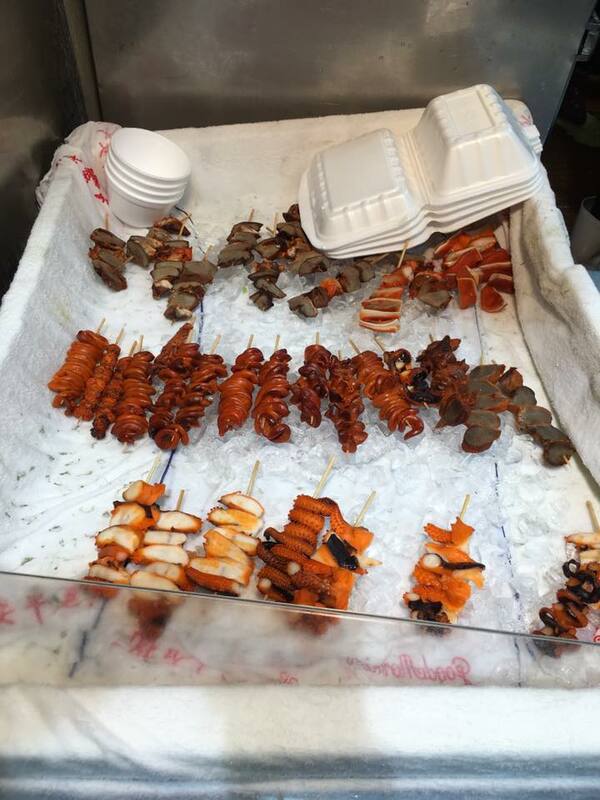 we stopped by one of many skewer stalls. 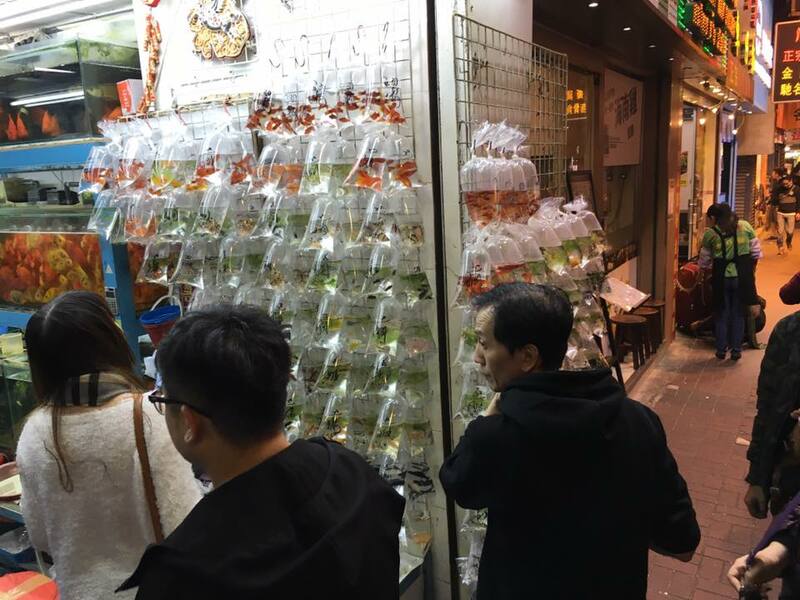 they have the instant ready-packed way of selling guppies & other ornamental fishes. maybe they do that in singapore too these days? not sure. we liked the royal plaza location. 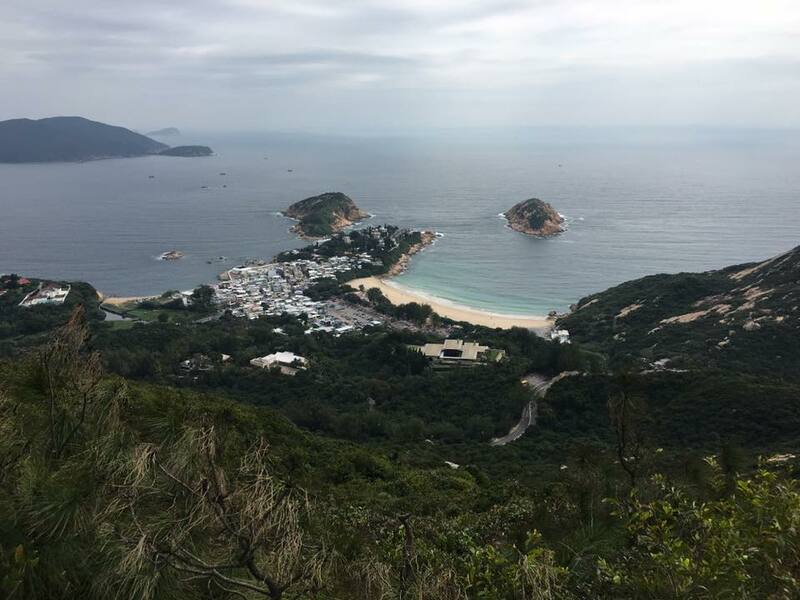 i think i will stay there again my next visit to hong kong, of course subject to price, other options & the convenient base to visit the places we want to go. friend of mine has a nose for all good deals. she told me before about the free i-sim card & reminded me again for my hong kong trip..
so i duely told my friends, and 4 of us downloaded the i-sim app from app stores. i-sim reservation was straight forward. collection was also convenient. 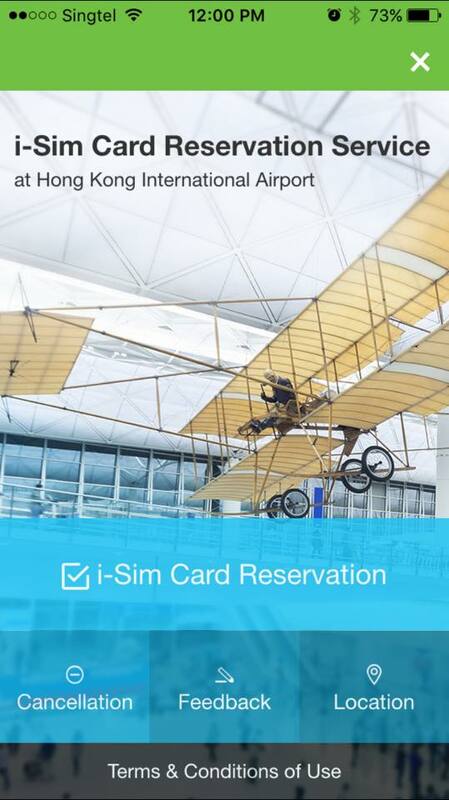 an email followed with a map showing i-sim card collection counter A08 at hong kong airport terminal 1 5/F. & according to my friend, she collected from hung hom station location (also provided in the i-sim app above) w/o making a reservation. 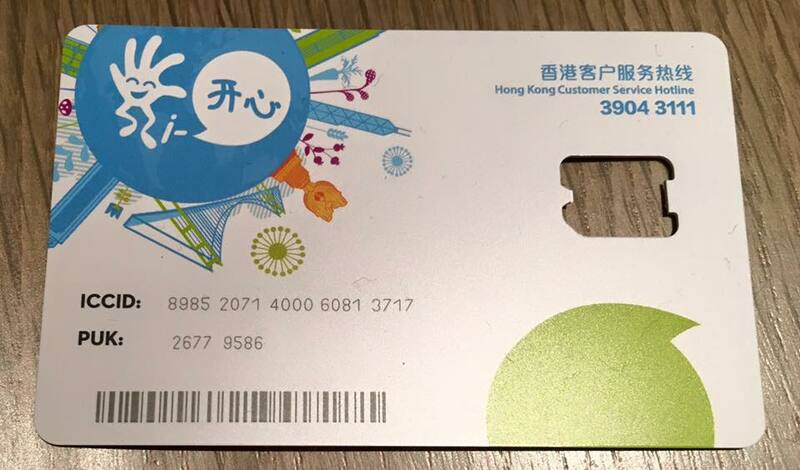 thanks to my friends, this was one of the most useful “free” thing to have in hong kong. 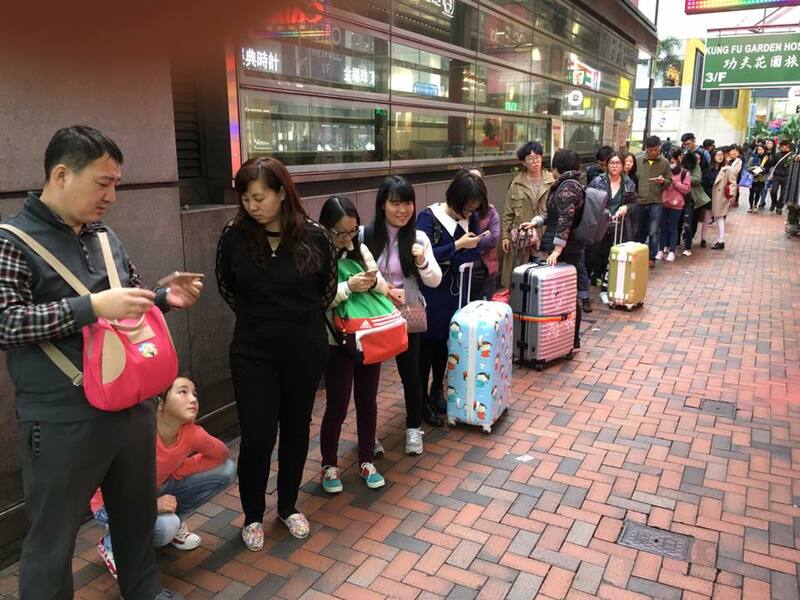 we had free 3G data & free calls in HK & Macau. 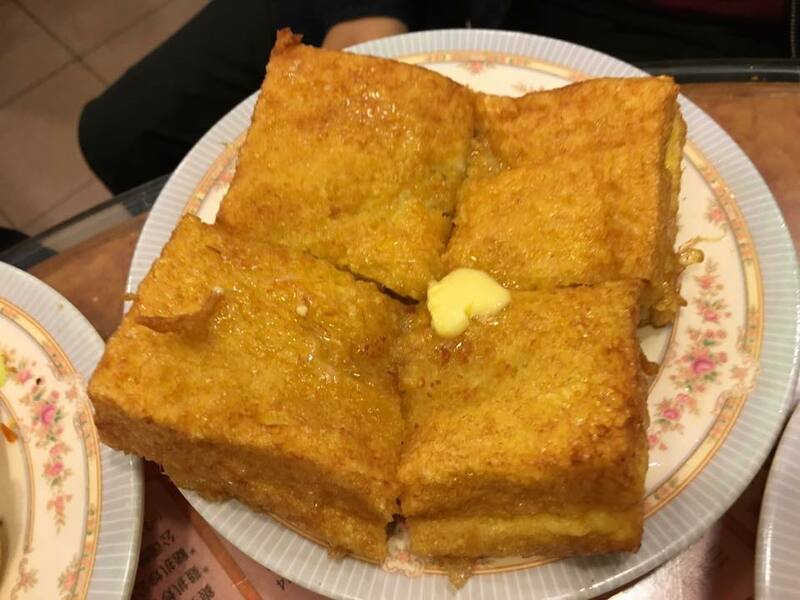 so we could search info on the net on 3G easily while traveling, use google maps to get us to new daipaidongs & places we wanted to explore, search for jenny’s bakery & 楼上grocery/dry goods chain while on the move. there was just one hitch..there was only 160Mb of data..
actually it felt like 16Mb rather than 160Mb. 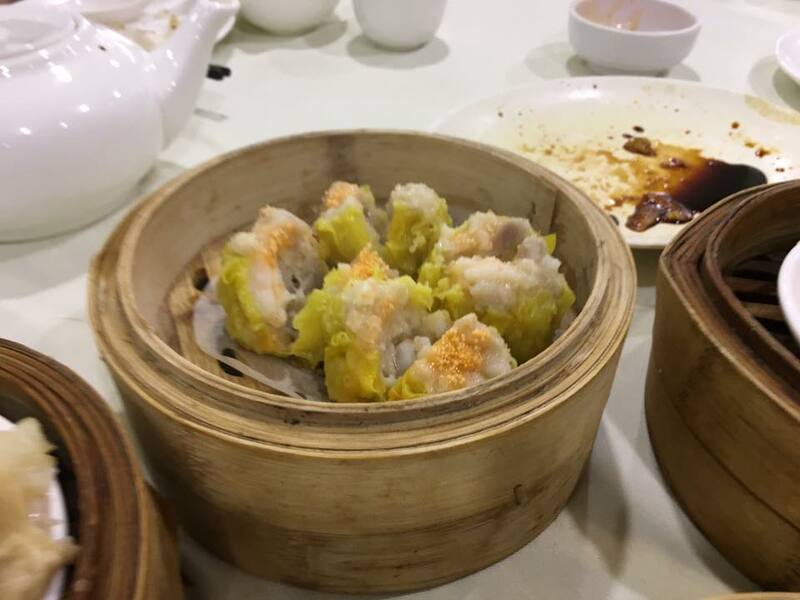 one friend was joking the time was just right for another at one dimsum 一点心(we had earlier wanted to try one dimsum but it only open at 11am). 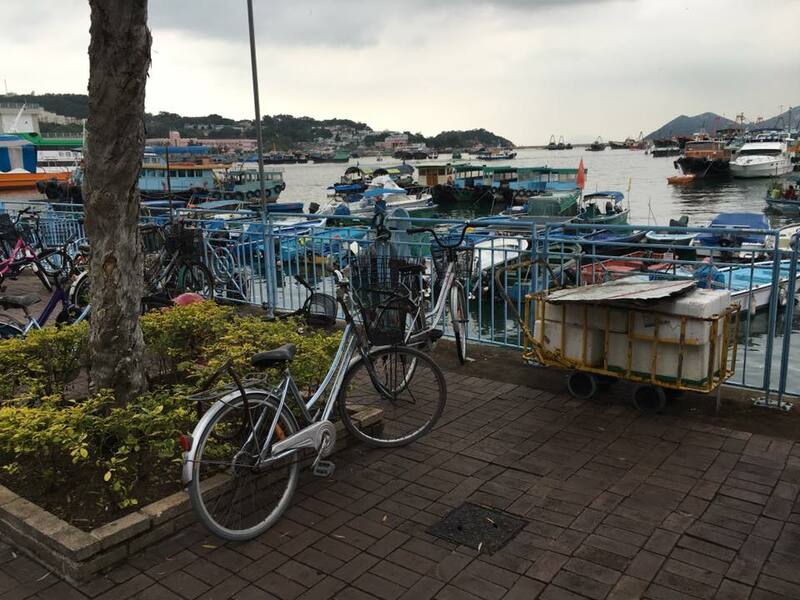 so after breakfast we got to central, walked over to central ferry pier no. 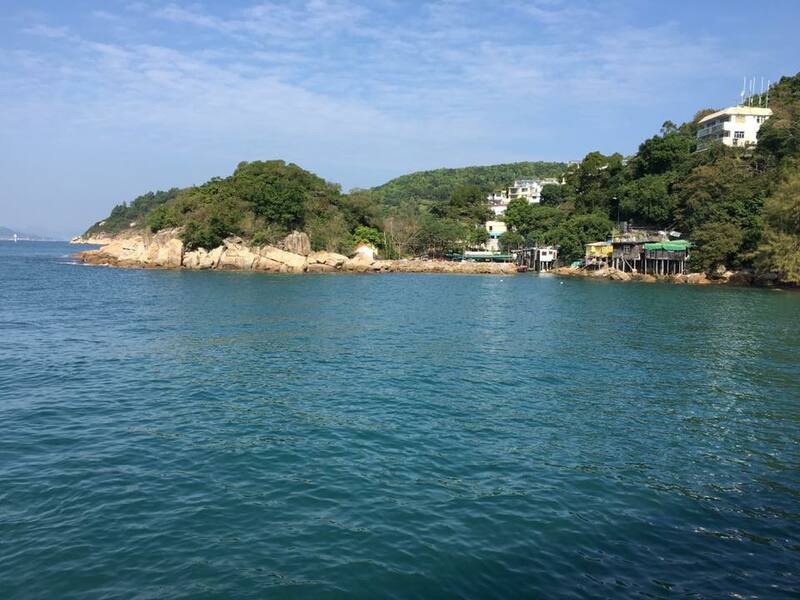 4 & took the ferry to yung shue wan pier 榕树湾码头 on lamma island南丫岛. 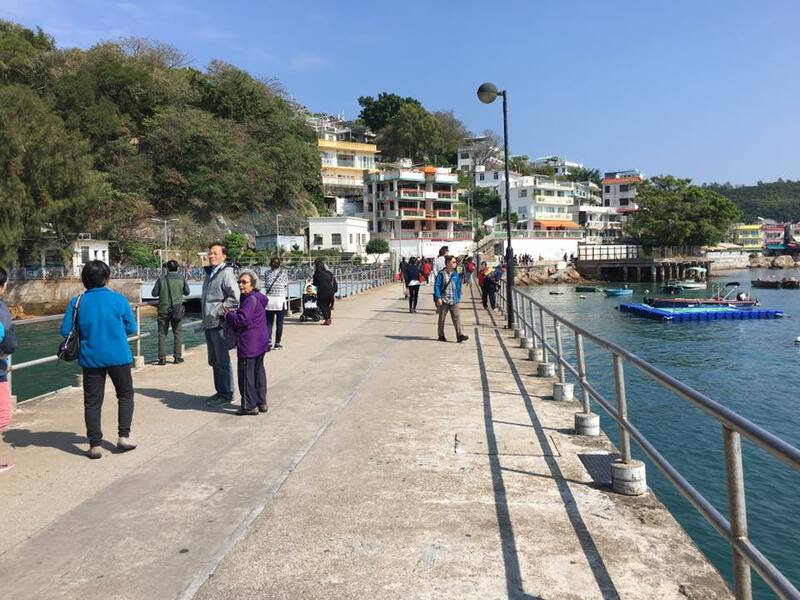 i took some photos at yung shue wan pier 榕树湾码头. 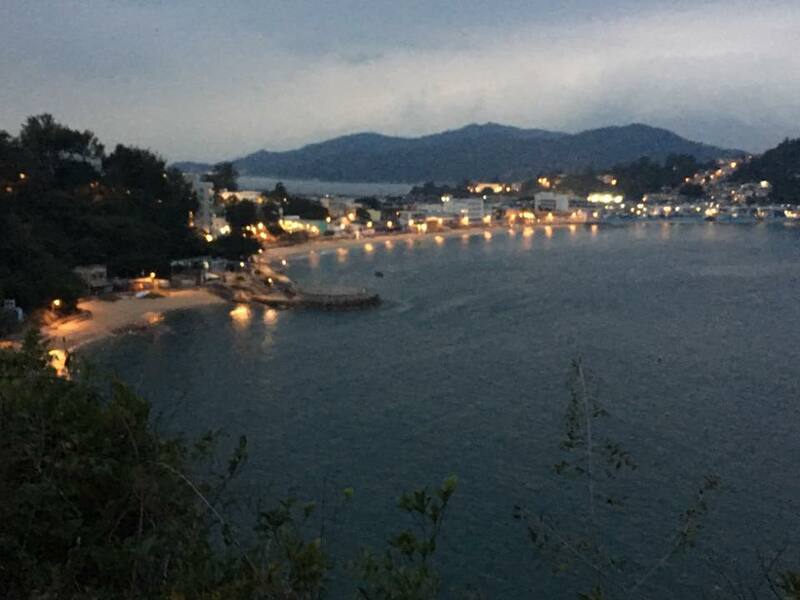 a view of the pier & a nice view of the coastline. streets with the old buildings. 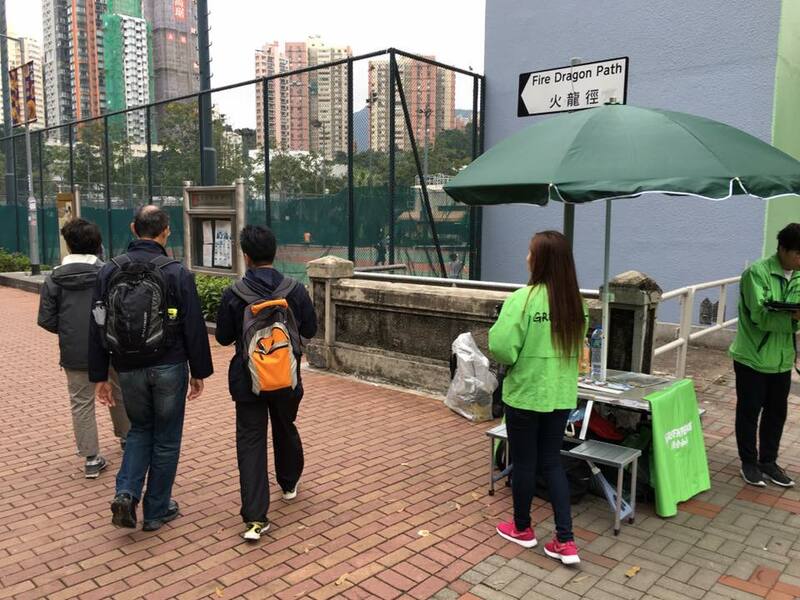 we walked in the direction of sukkuwan & found choi kee 蔡记车仔面. 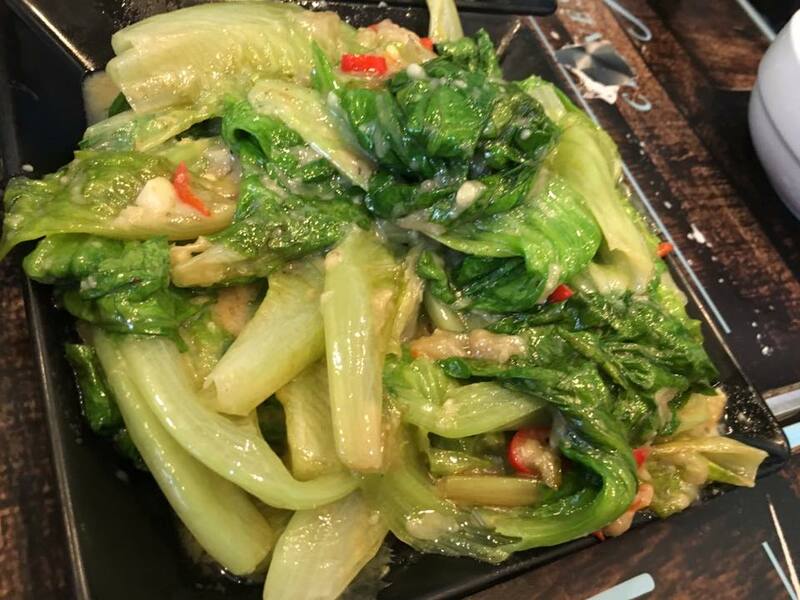 i ate at choi kee 蔡记车仔面 the last time also when i came with my sister on 4.6.2015.
the HK$38 for 4 items choi kee 蔡记车仔面 was good value & nice too. 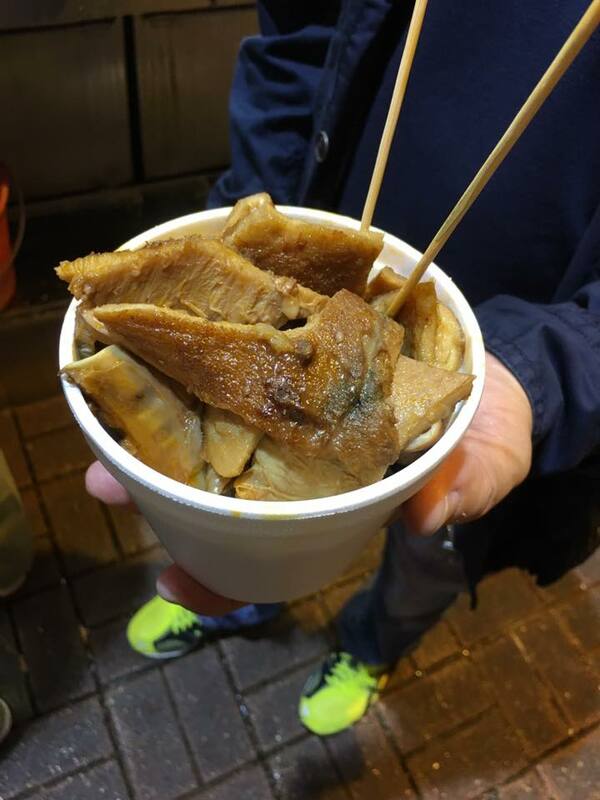 we ordered 2 bowls & picked 4 items like beef briskets, beef stomach牛百叶, and big intestines. 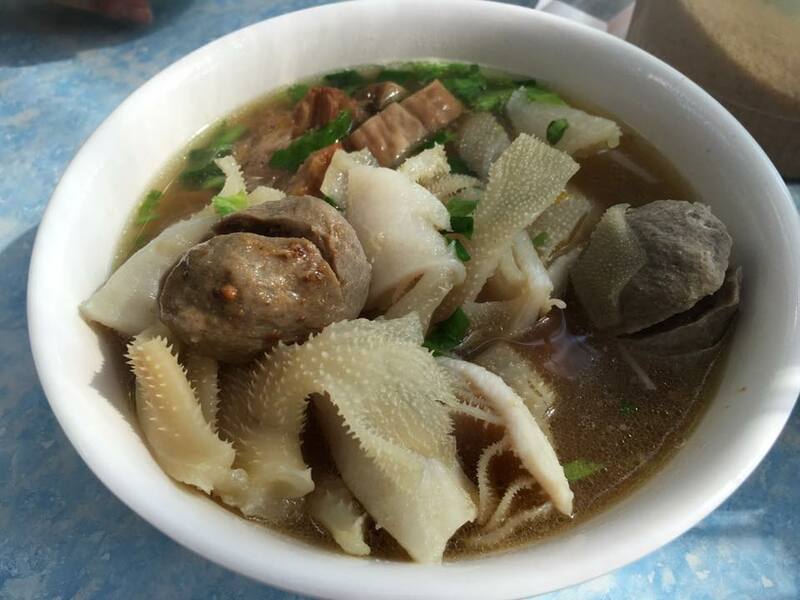 1 bowl had beef balls & the other had cuttlefish to make up the 4th item. they were just doing pot stickers锅贴. they looked good so we ordered. this was good! 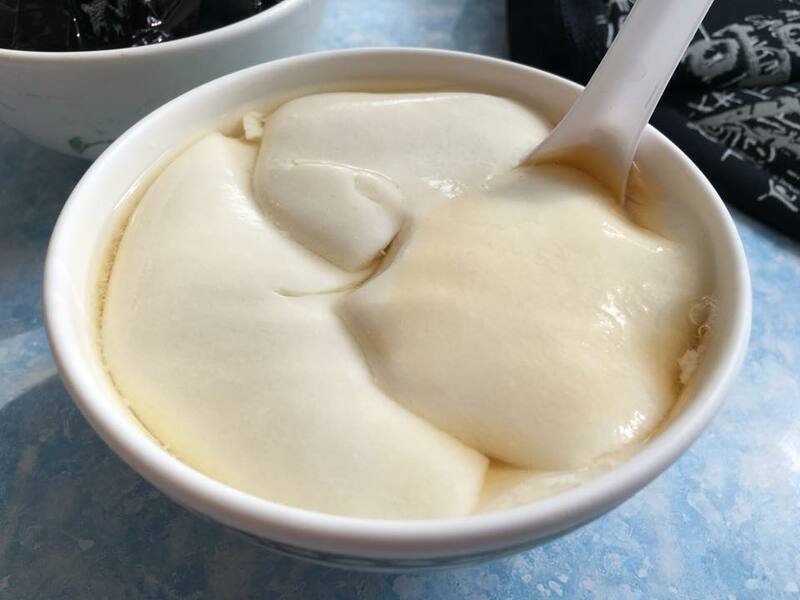 we also had the ginger tau huay 姜汁豆花..
& this time we had the cheng chow 凉粉 too, just ordinary nothing like the hoe kee dessert 浩记甜品馆. 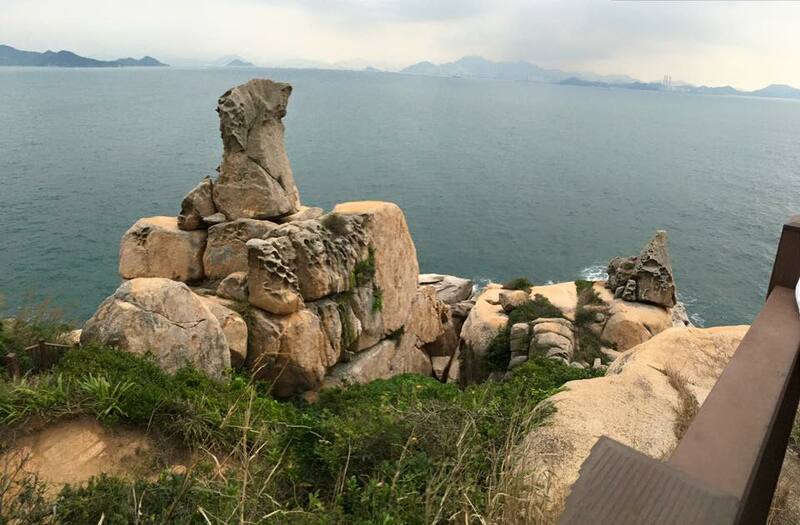 we decided to relax & did not want to take the 2hr hike to sukkuwan today. 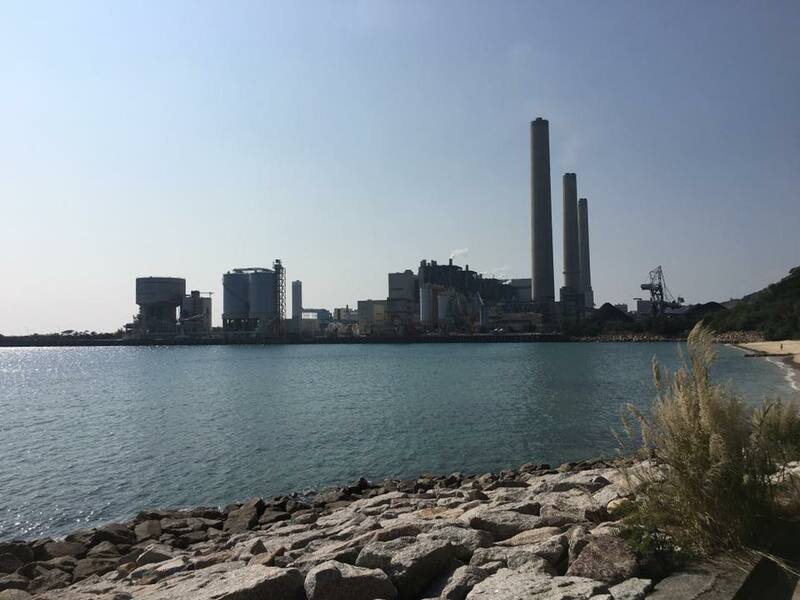 so we walked just a little further to the part of the coast where we had a good view of the lamma power station南丫岛发电厂. 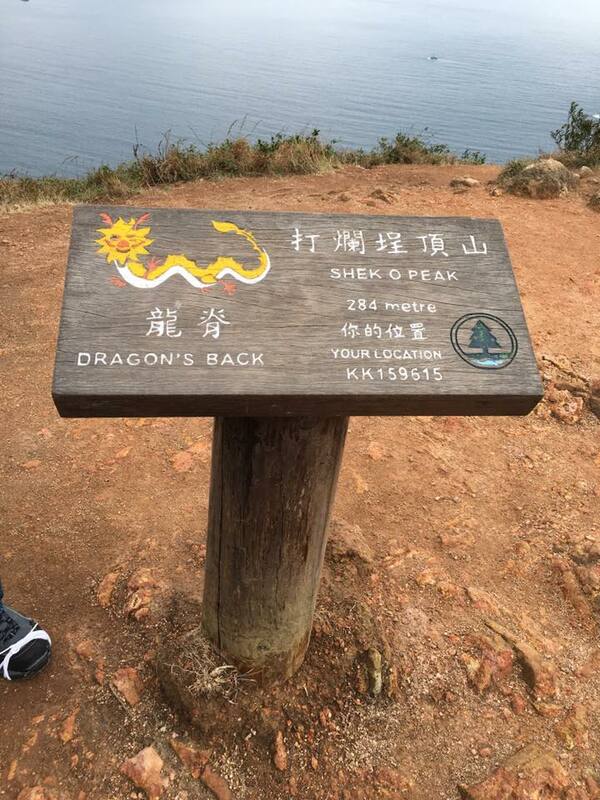 last time i did dragon’s back hike was on 11.3.2013. it was rather hot then! today weather was quite perfect. it had threatened with a shower the first evening of our arrival in hong kong. that continued on the morning the next day 11.1.2016, but it was fine weather thereafter. 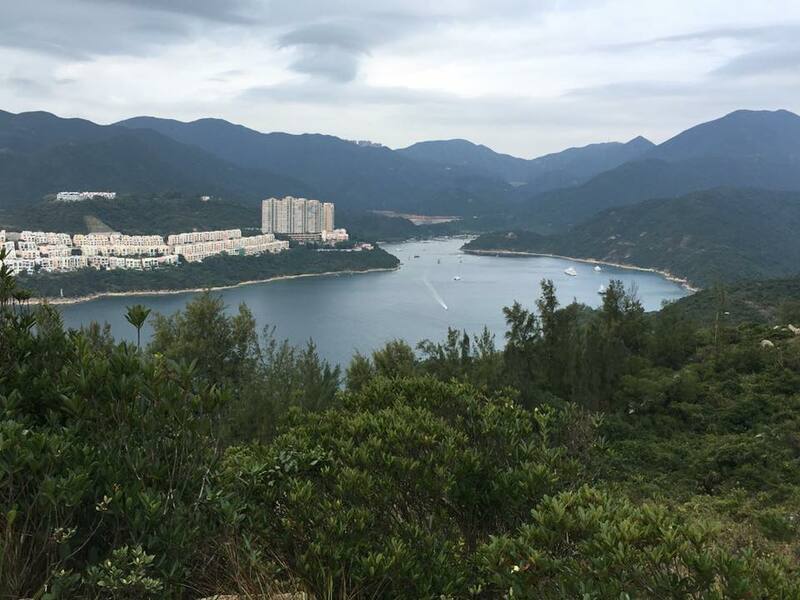 did the peak circle walk at noon time instead, and cool weather allowed us to do that. 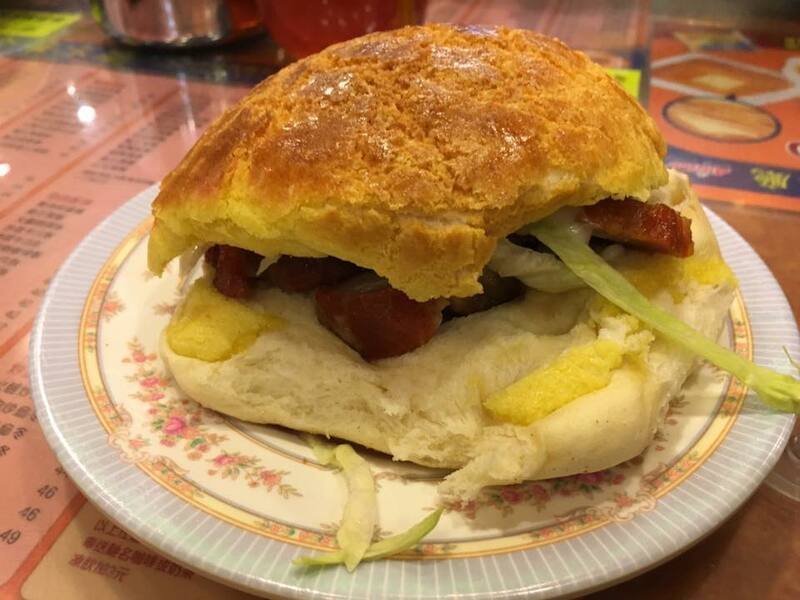 this morning after experiencing the best polo buns 菠萝包?? 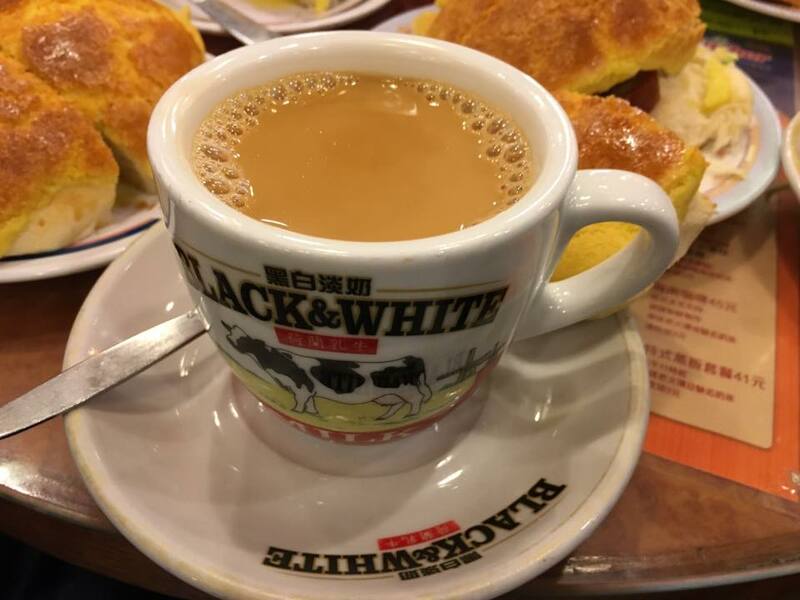 & yun yong 鸳鸯 coffee-tea at kam wah cafe 金华茶餐厅f, we took the mtr to shau kei wan. 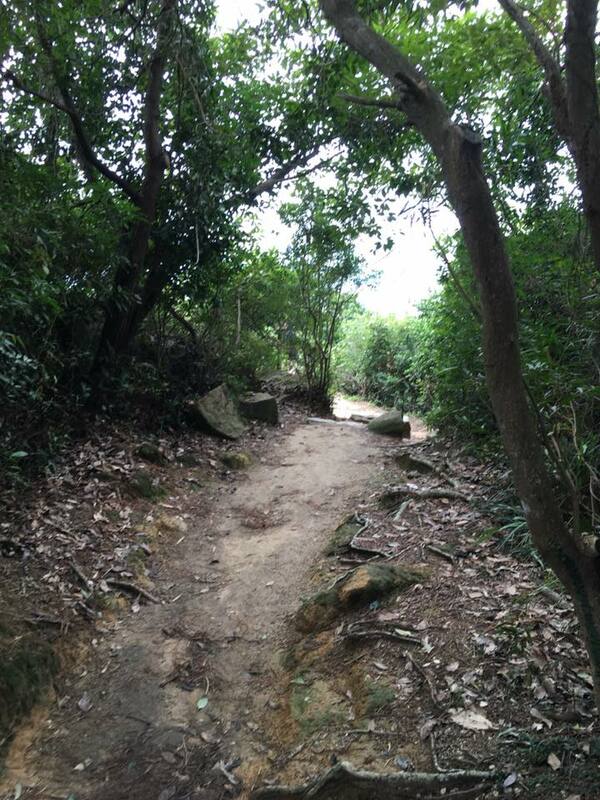 and then boarded the no9 bus to to tei wan 土地湾 trail head to start our hike. 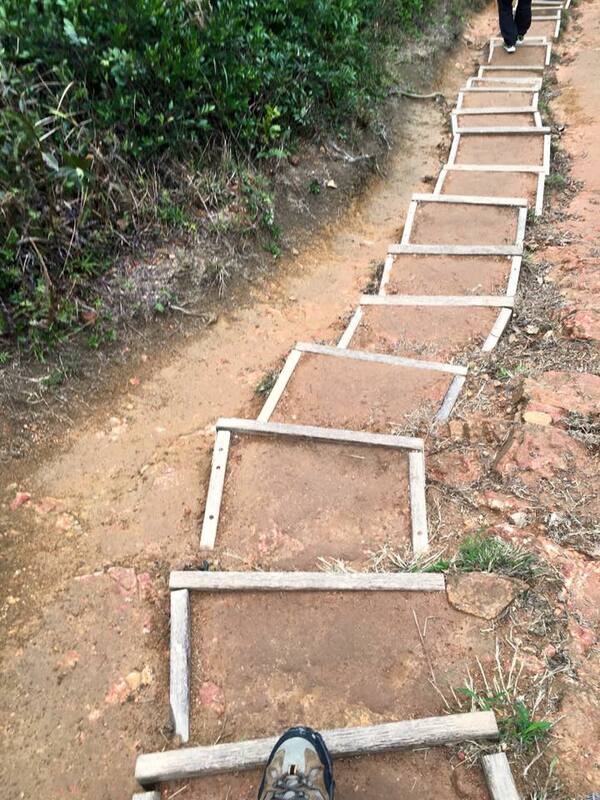 some steps in case when it’s wet & slippery. looking back we can see stanley. 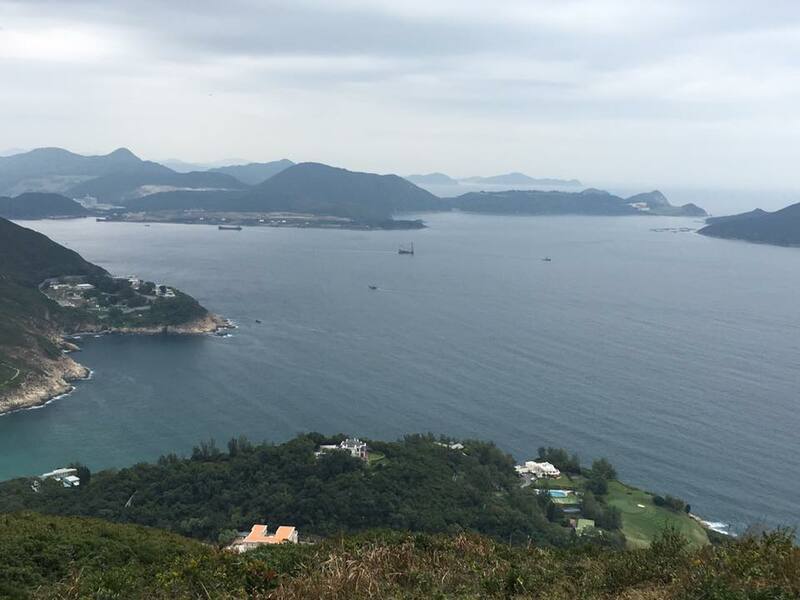 and higher up, the stanley peninsula. 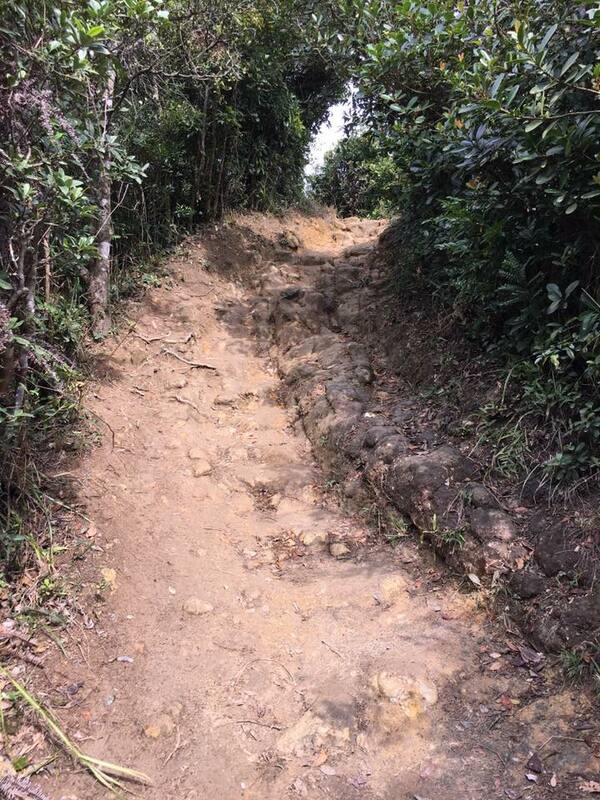 it was not too steep. 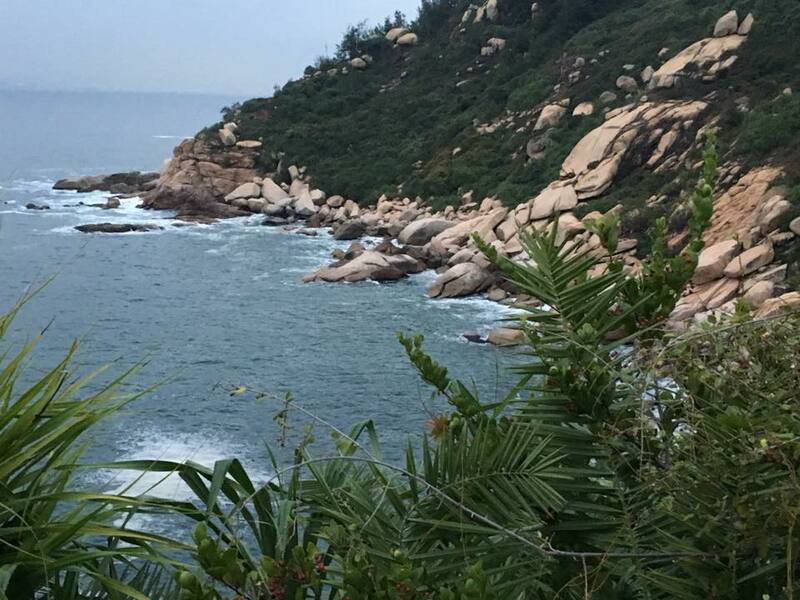 nature, fresh air & nice surroundings! 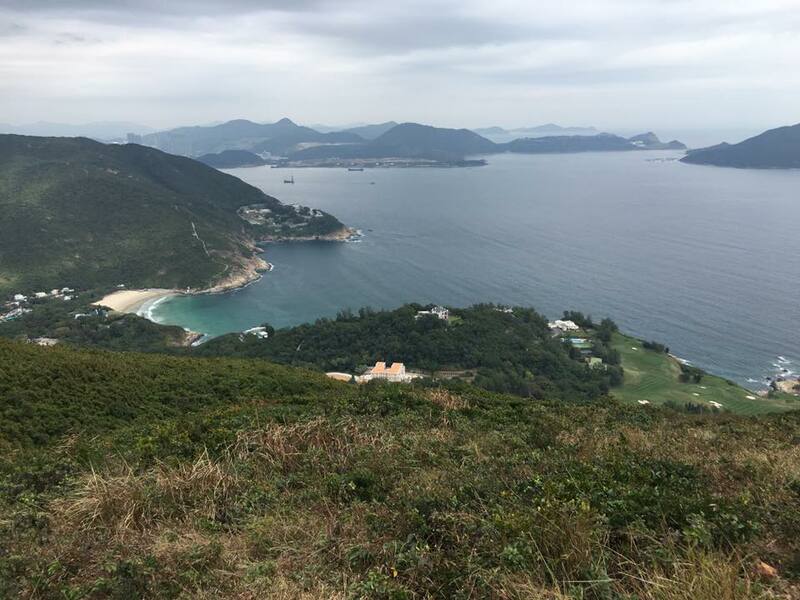 & a great view of shek-O & the sea. 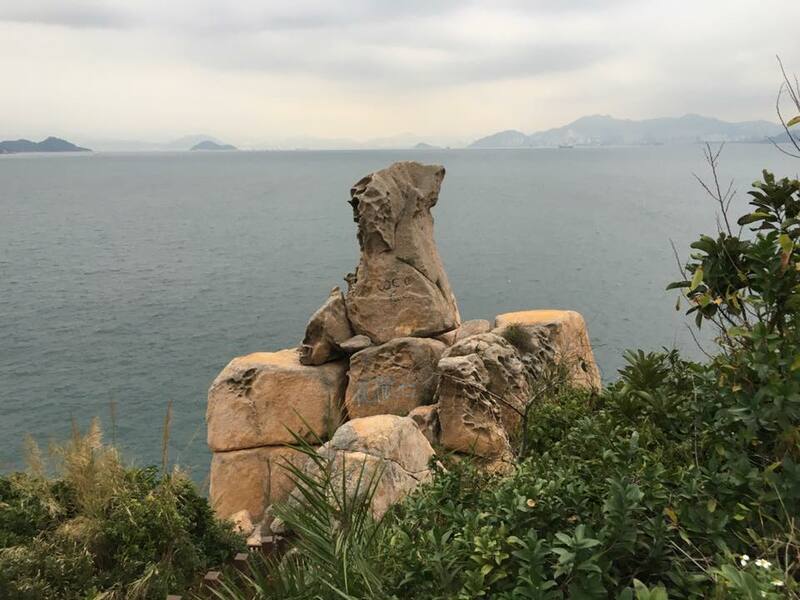 & that should be tung lung chau island 东龙洲…. 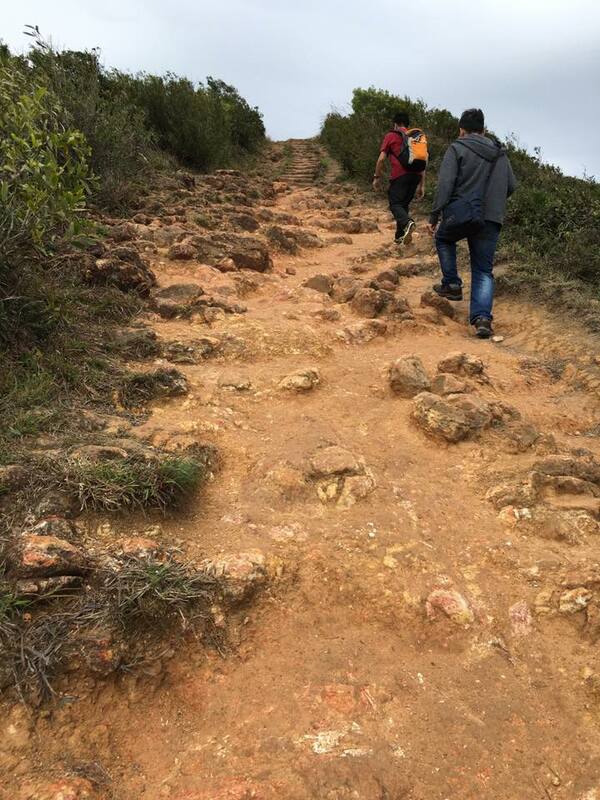 the view up to the summit. 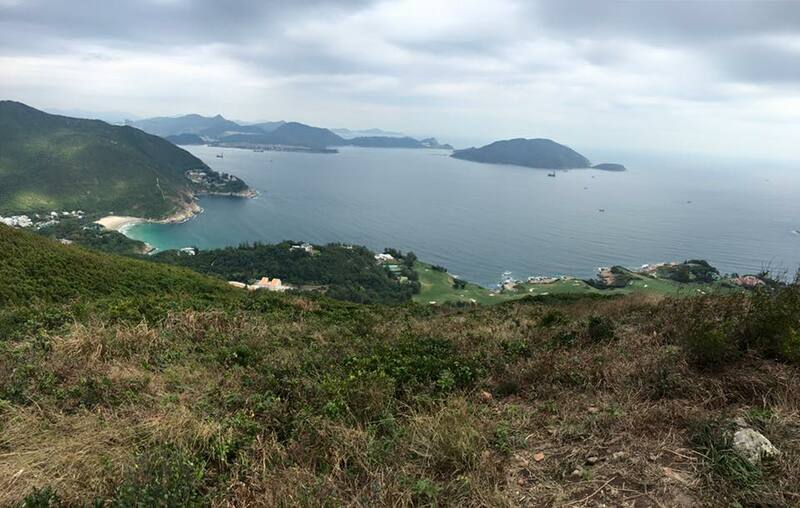 that’s why it’s called dragon’s back..
the invisible divide….mountain bike & walkers..
looking at tai long wan 大浪湾. 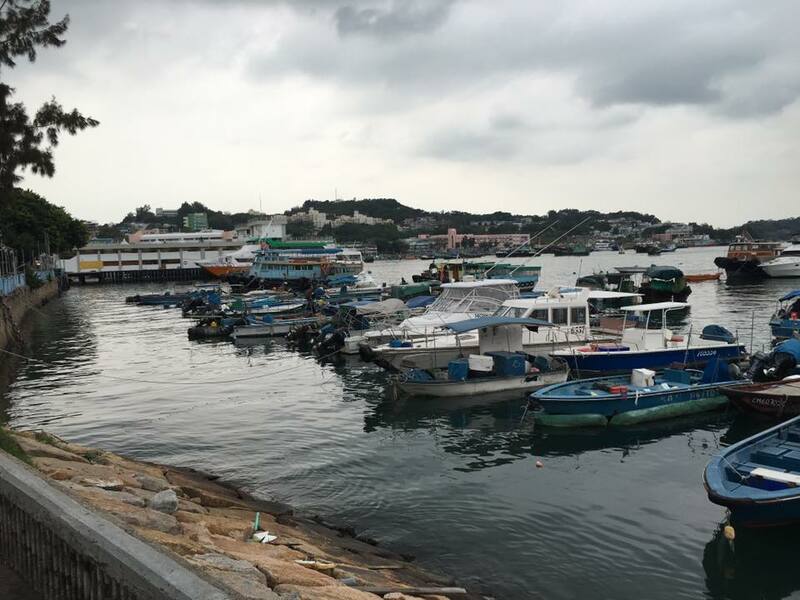 tung lung chau island 东龙洲 & new territories 新界. that top of the world feeling? not really la..
still, what a magnificient view! looks real nice isn’t it, when you simply crop the photo…like water colour painting..
it was an invigorating & enjoyable walk. the cool weather w/o rain played an important part…weather singapore does not have! 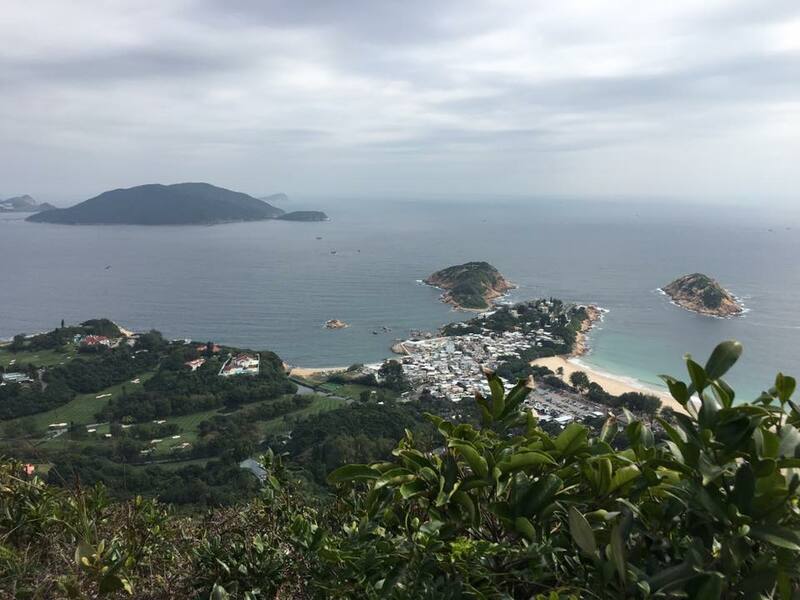 it was past lunch & we did not want to go further to tai long wan 大浪湾 or shek O village, so we exited the trail at cape collision road junction with shek O road & took the no 9 bus back to shau kei wan. 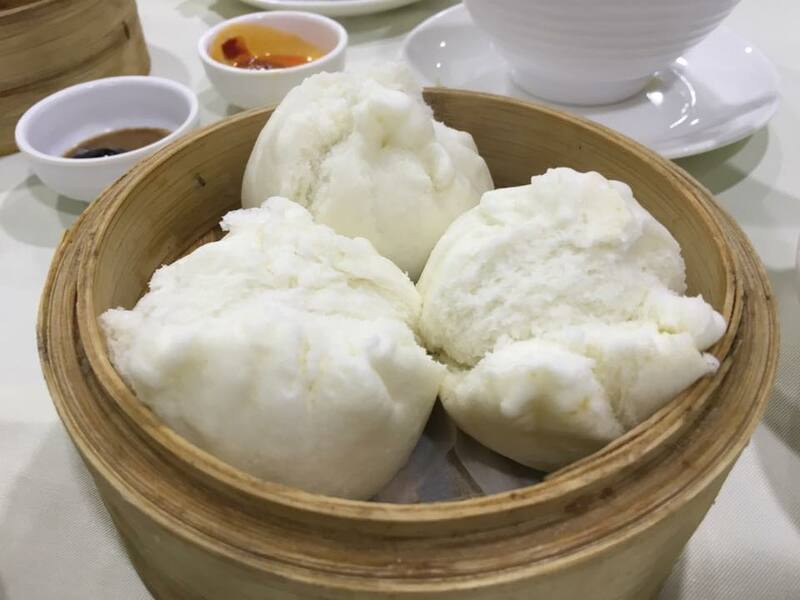 weather was good to us except for rain on the first evening & second morning (so we had a leisurely dimsum breakfast at tao heung mongkok 稻香旺角). 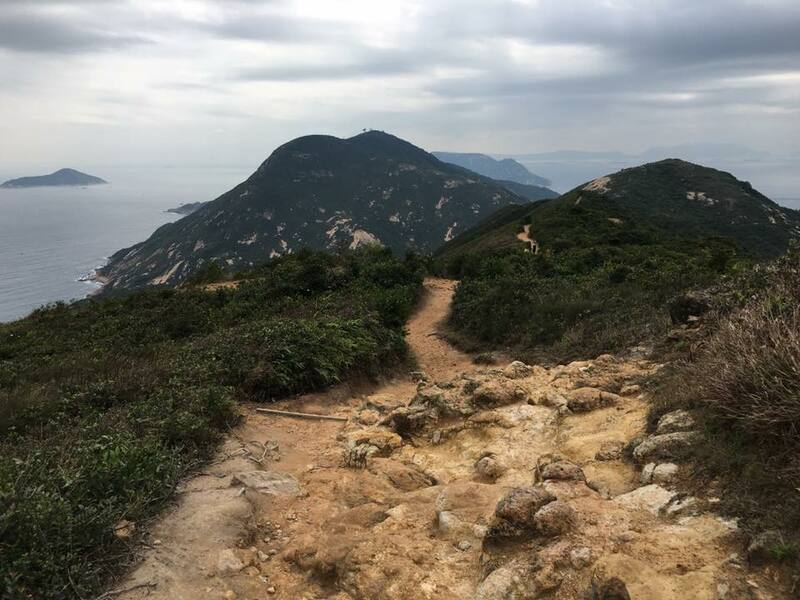 great hikes & walks at cheung chau, dragon’s back, peak circle walk & lamma island, and we had excellent food at daipaidongs and the tao heung group restaurants, a fairer price restaurant chain. 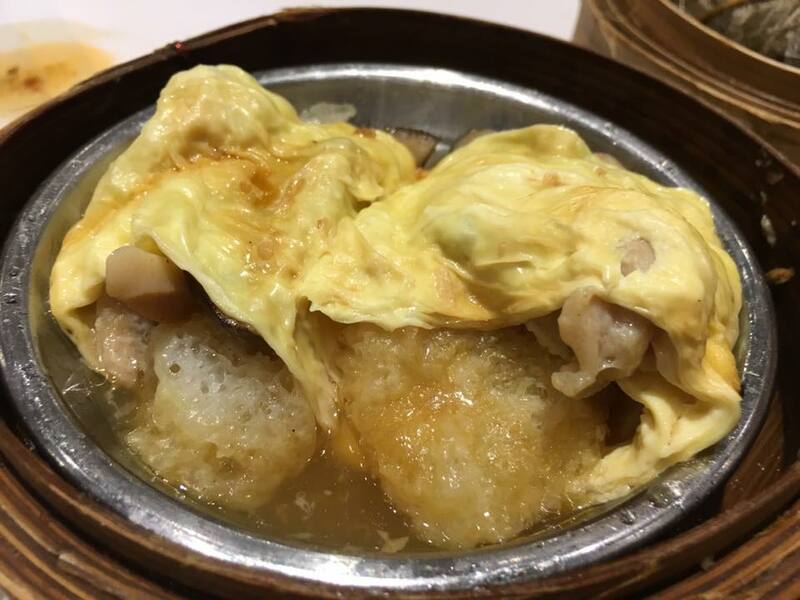 our only bad & forgettable meal was when we kena waylaid into the wrong tai yun 泰源?? (we think). 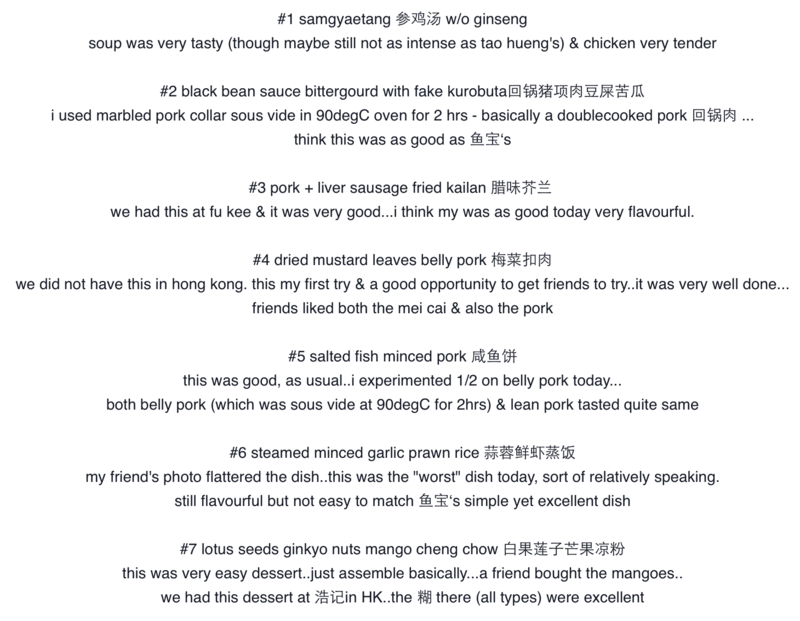 so, coming back, naturally i went about recreating several great dishes we had in hong kong (see above menu). & here they are (above photo..the rice came later, not in photo). 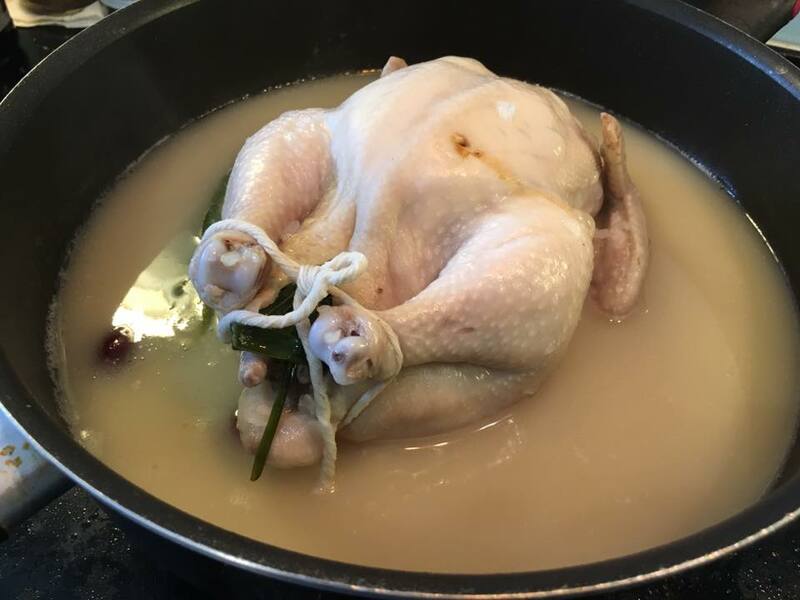 i stuffed the chicken with 3 tbsp glutinous rice (soaked in water for 1 hr according to one internet samgyaetang recipe), 3 cloves garlic & 3 dried red dates, sliced ginger, 2 spring onions. 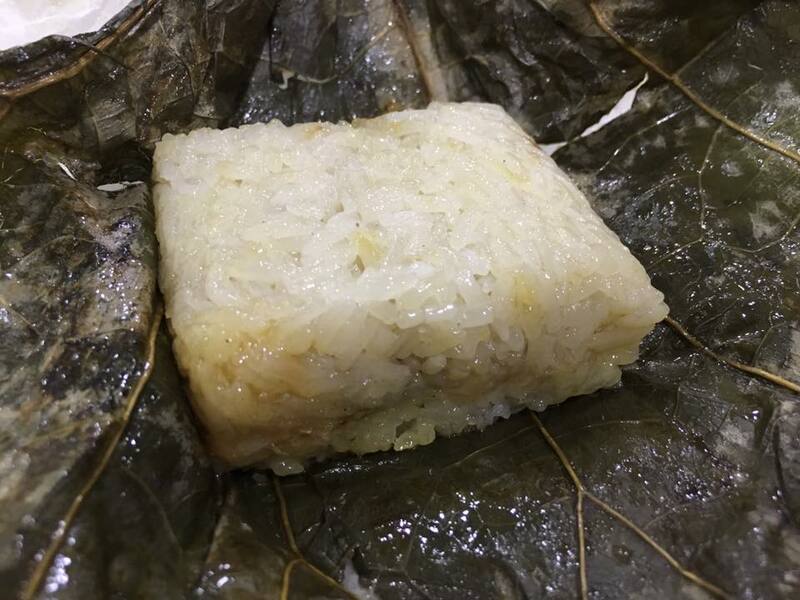 seems that the glutinous rice in the recipe was too little, would have been better with more so texture of soup will be better. will try 1/2 cup next time. 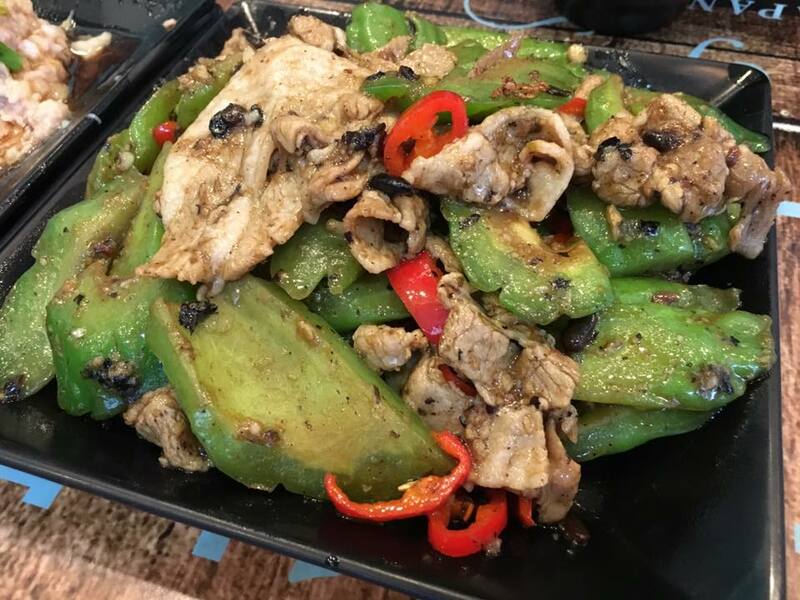 we had black bean sauce bittergourd with kurobuta at the accidental find yue bo 鱼宝食馆. i used a cheap marbled pork collar to fake the kurobuta. 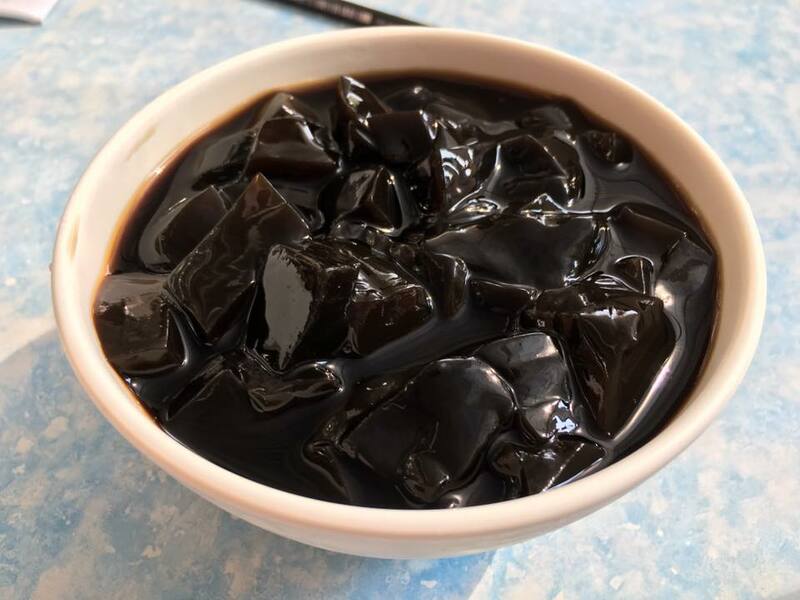 i put it in 90degC oven for 2 hrs to convert the tough connective tissues to flavourful gelatine, then added it to the black beans bittergourd dish like a double-cooked pork 回锅肉. my friends liked this dish very much. firstly the bittergourd had the special flavour but not bitter as i brined it with sugar the day before & the black beans & slow braise made it very tender & tasty, and the pork collar was excellent, flavourful & tender. 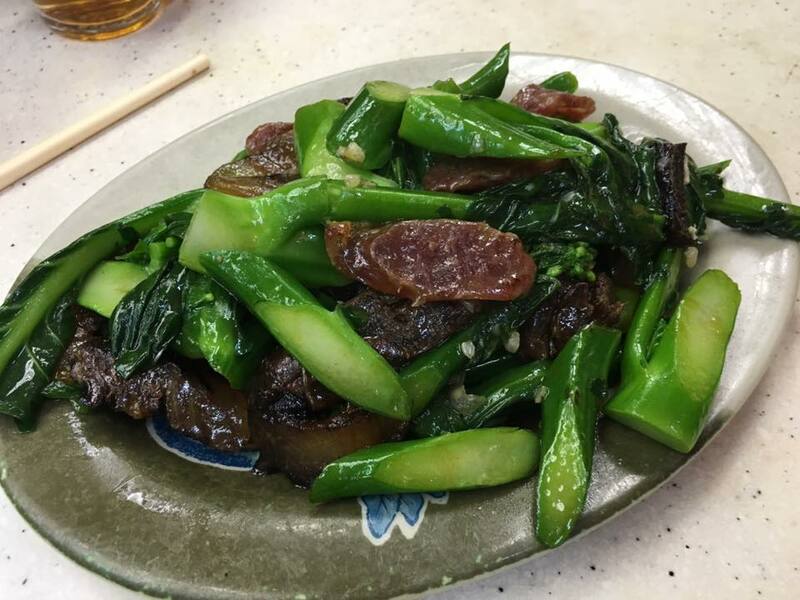 i had the pork + liver sausage fried kailan 腊味芥兰 for the first time at fu kee 富记粥品. 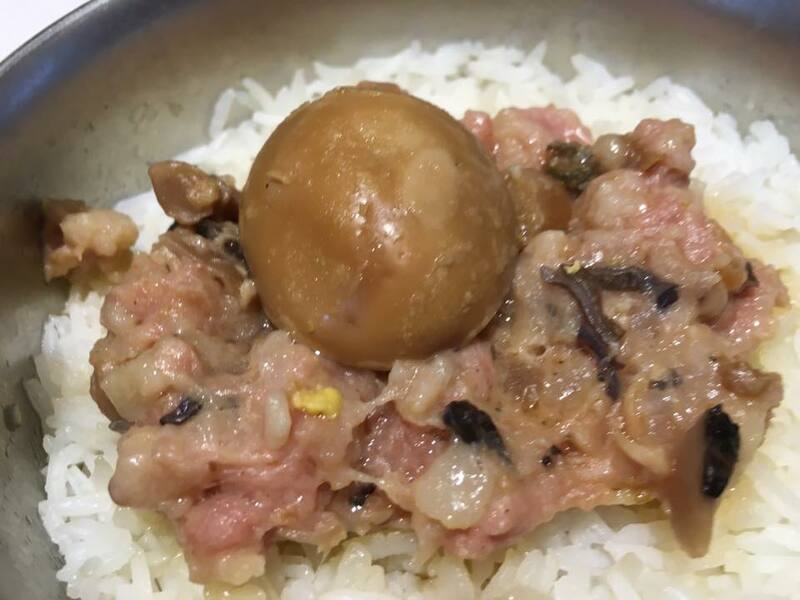 so i decided to buy some fairly good pork & liver sausage, steamed them & then fried & added chicken stock to bring out the 腊味 flavours then added the kailand stems & leaves & later oyster sauce & corflour the usual way. 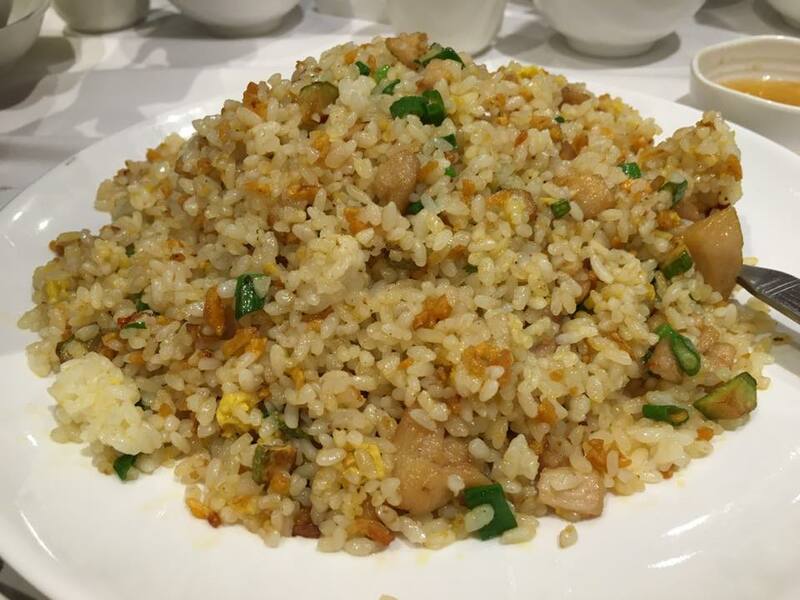 i think my version was as good today maybe better than fu kee 富记粥品’s 腊味芥兰, very flavourful indeed. i placed the belly pork in a 90degC oven for 2 hrs (together with my pork collar to save electricity), instead of boiling it in water for 35mins according to the recipe. 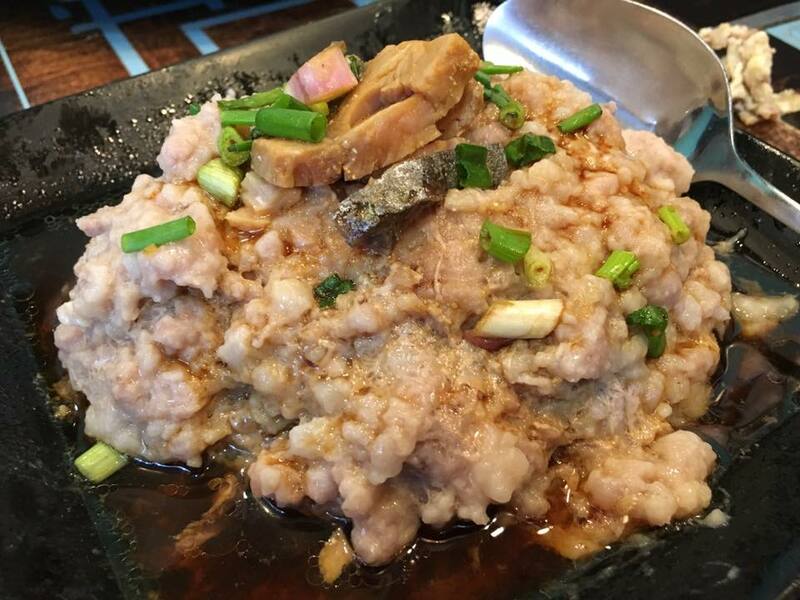 salted fish minced pork 咸鱼饼 was another great dish we had at yue bo 鱼宝食馆. 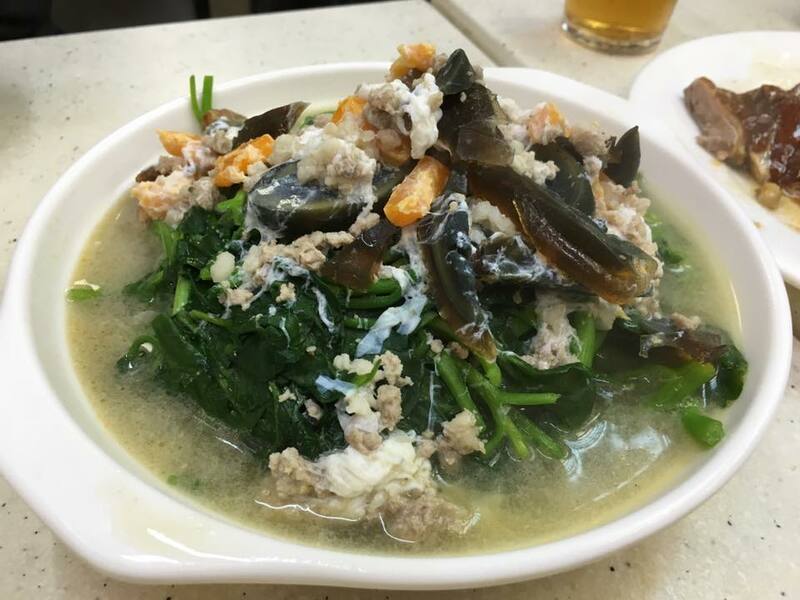 the salted fish minced pork 咸鱼饼 was good, as usual. this one though i had some difficulty getting it right! 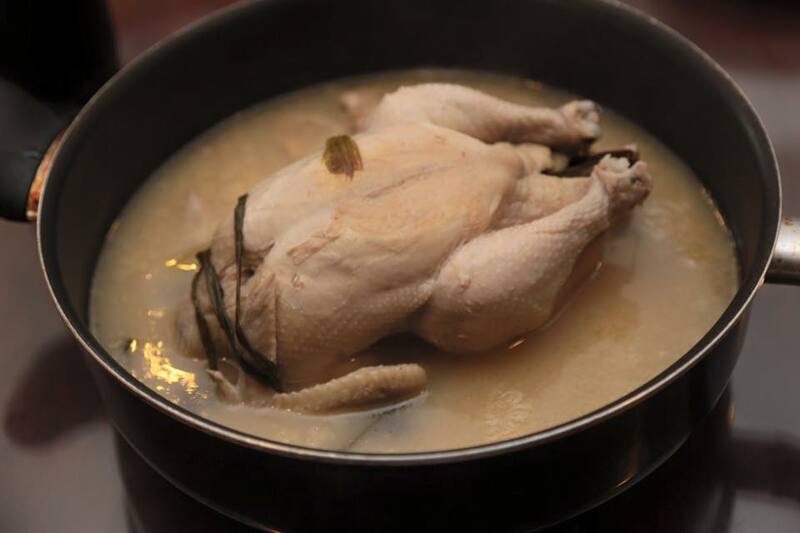 i used chicken stock to cook the rice in the rice cooker. then i added some soy sauce mix (similar to those used for fun cheong & also for adding to rice) & added to the cooked rice. & i had lots of minced garlic. & we also had wonderful dessert at Hoe Kee dessert 浩记甜品馆. 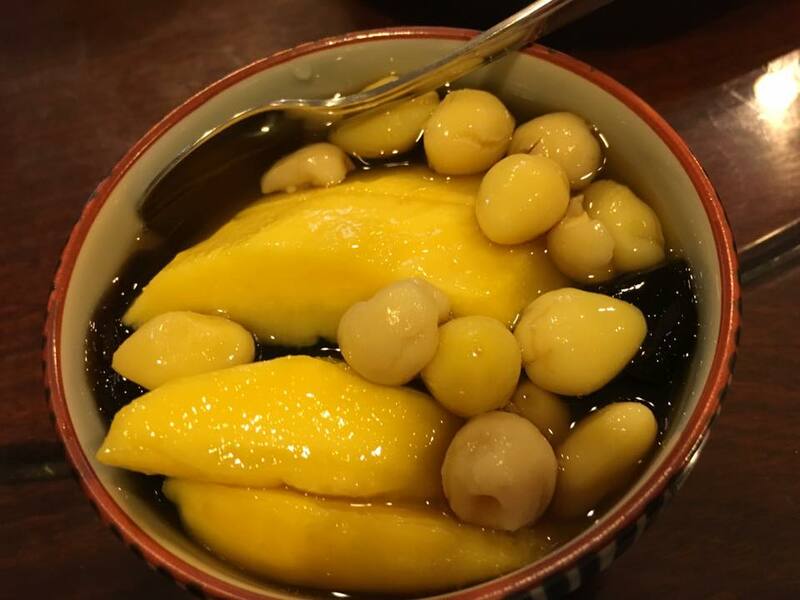 but lotus seeds mango cheng chow 莲子芒果凉粉is something i can do. i cooked 1 packet of lotus seeds 莲子 & 1 packet of ginkyo nuts白果 with 4 tbsp brown sugar & reduced. 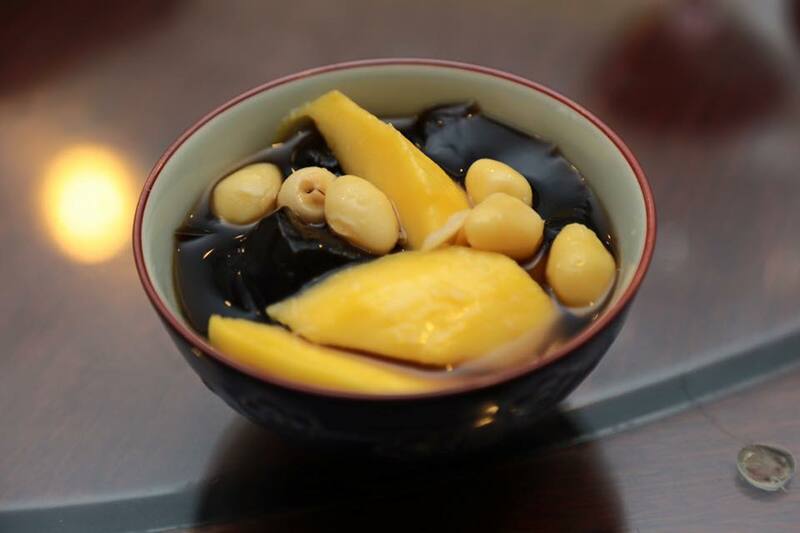 i let it lightly boiled for 1.5hrs to 2hrs, a friend brought the mangoes, so it was just an assembly of the 莲子白果 on the mangoes & cheng chow 凉粉. 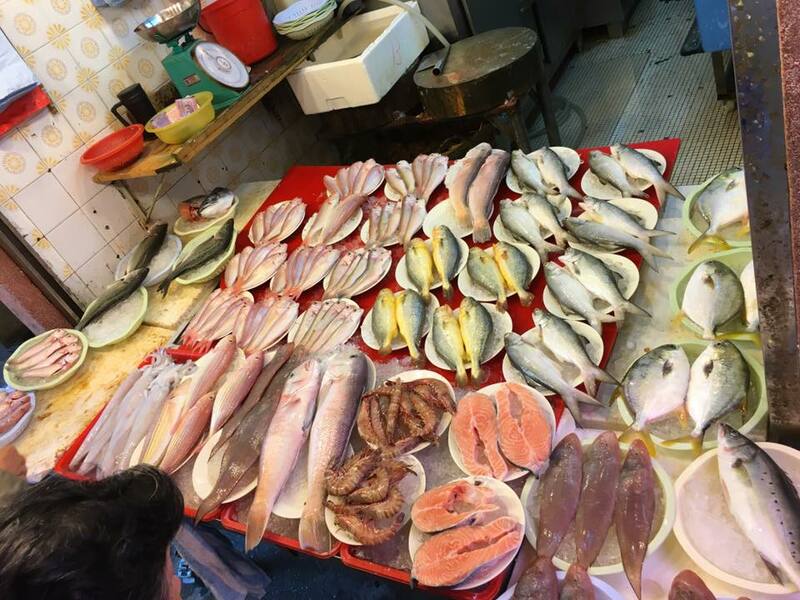 lunch was a display of all the food we liked & enjoyed while in hong kong (except the 梅菜扣肉 dish). 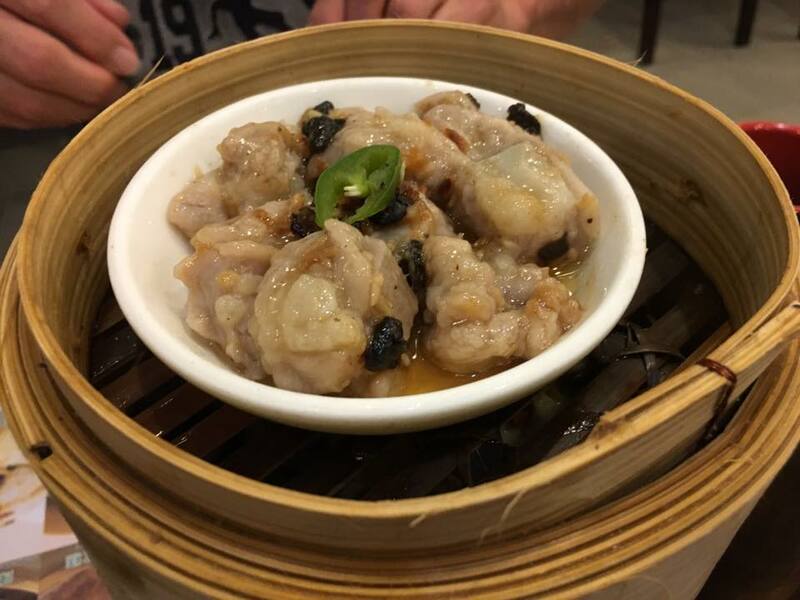 it was wonderful to be able to relish the fun food moments in hong kong. 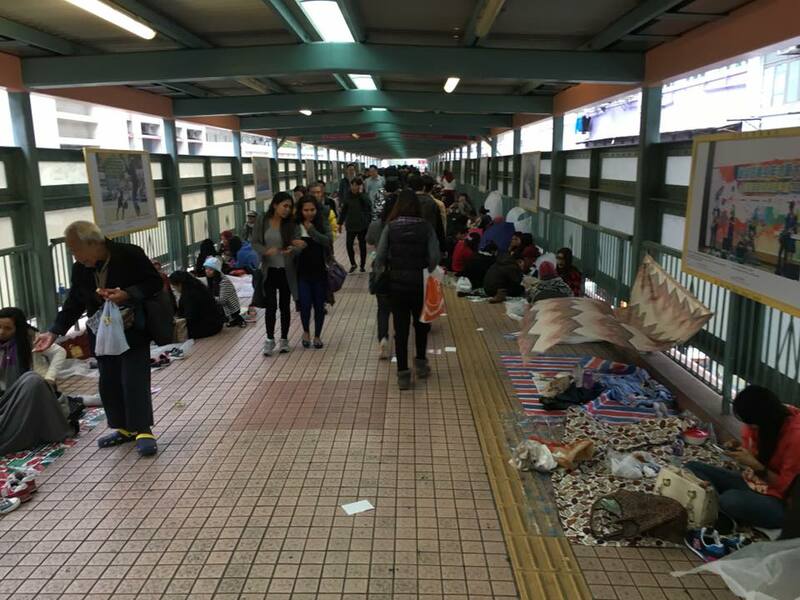 the next morning (day of departure on 14.1.2016) we went back to tao heung mongkok 稻香旺角. 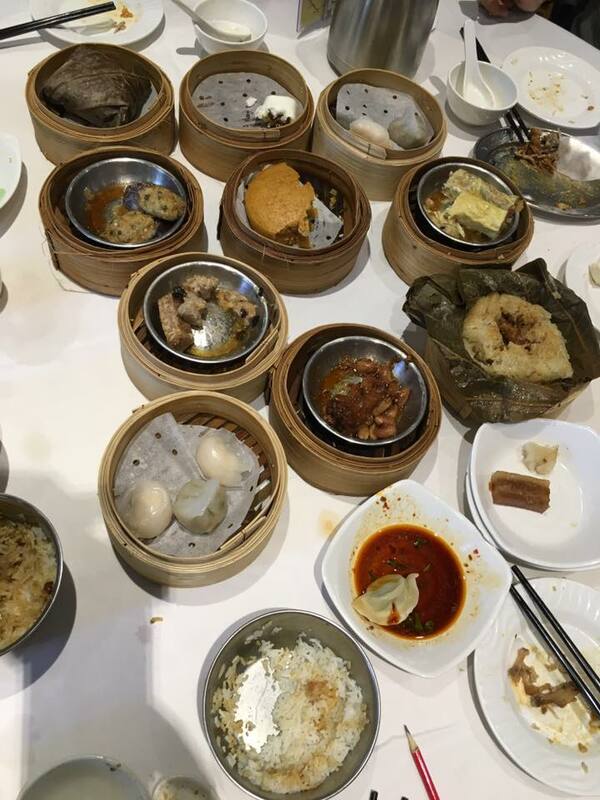 this was where we had our HK$380 for 6pax dimsum feast on 11.1.2016! something i don’t order in singapore. here we had it everytime. 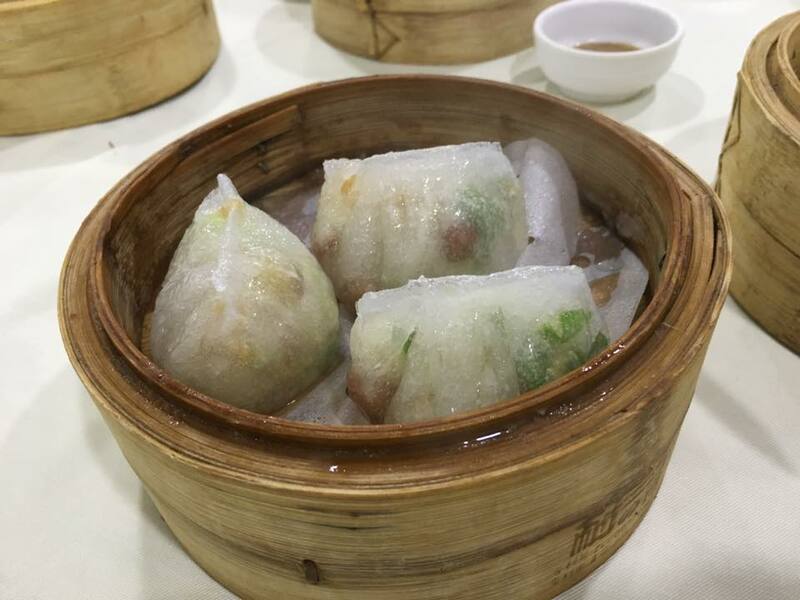 it was nice like all the other dimsum places we went to. 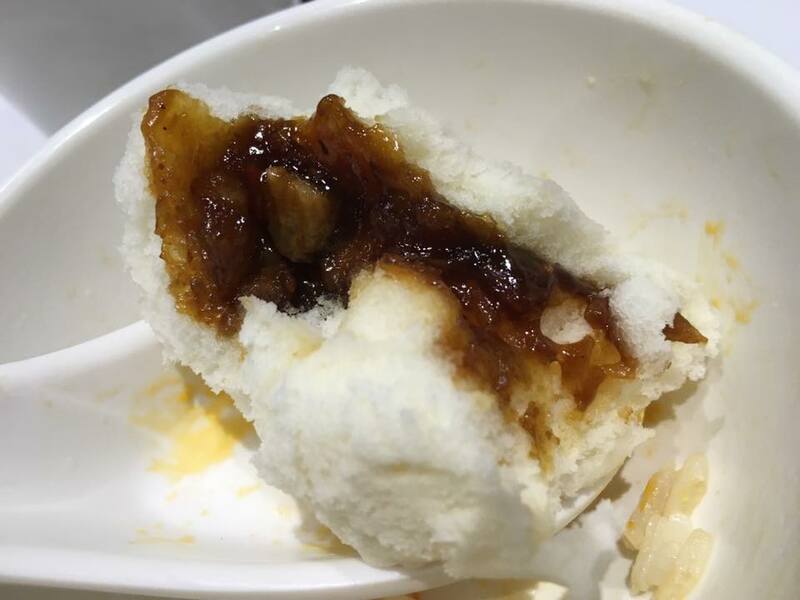 of course tim ho wan’s crispy skin char siew pao was special. 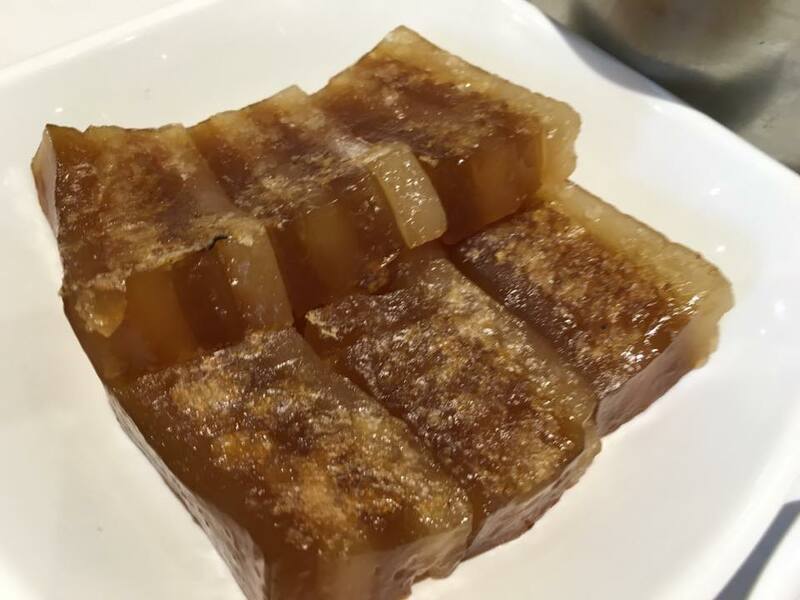 & cannot forget har gao won 虾饺皇 at tao heung. 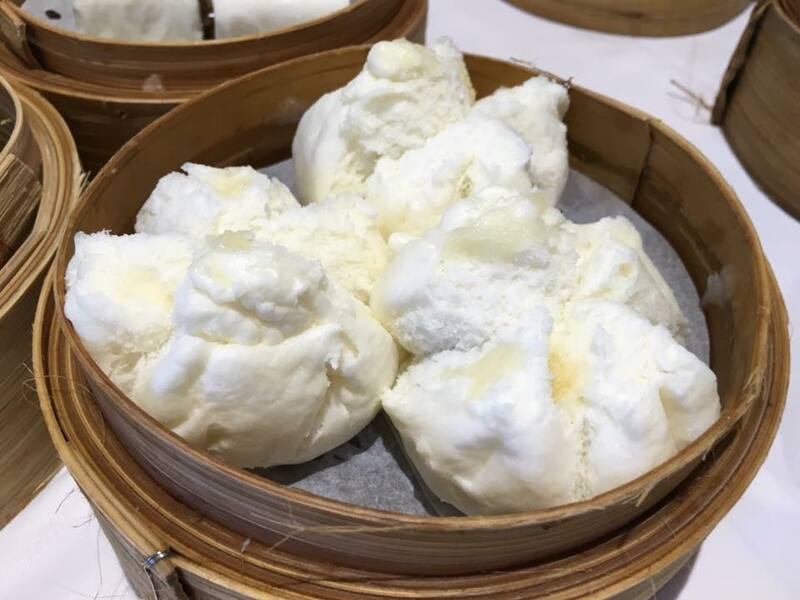 after trying out tim ho wan shamshuipo & also fu seng 富城火鍋海鮮酒家, you can see from the photos that the ones here at tao heung is best! 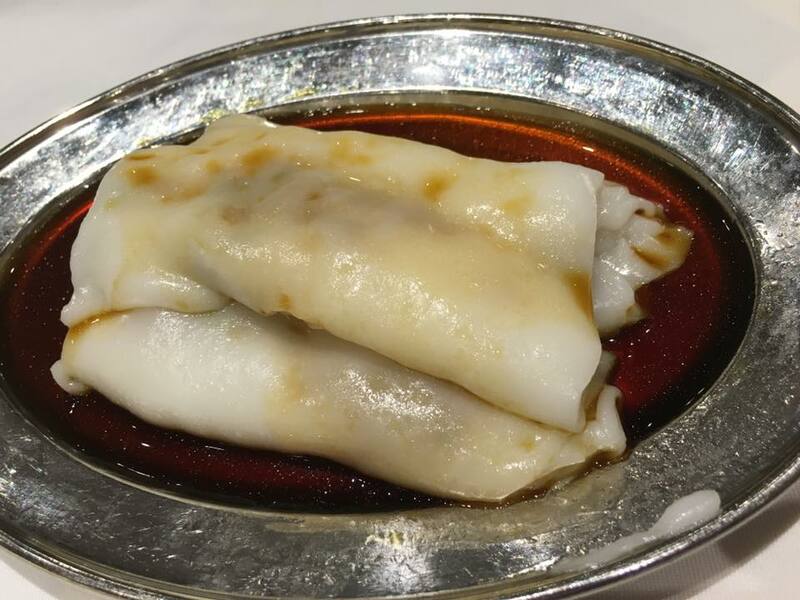 char siew fun cheong seemed not as good as the other day. 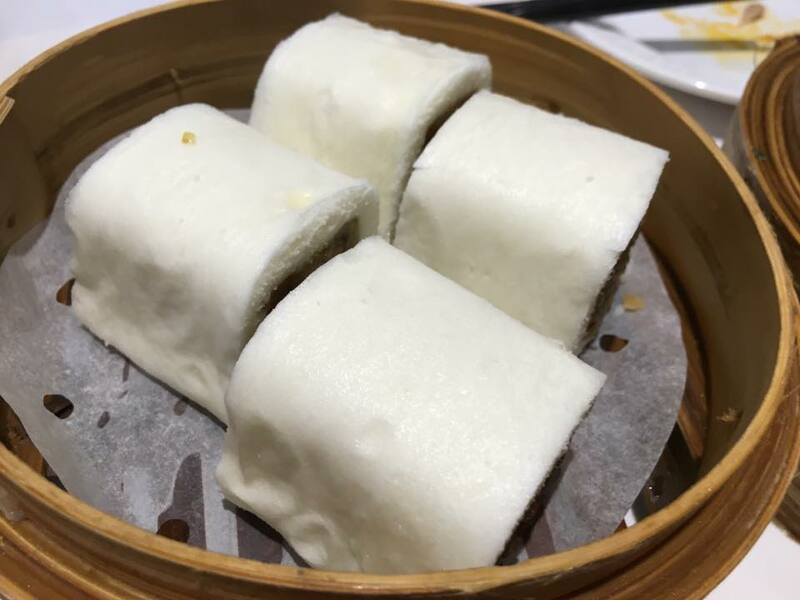 the pork ribs was best at tim ho wan. 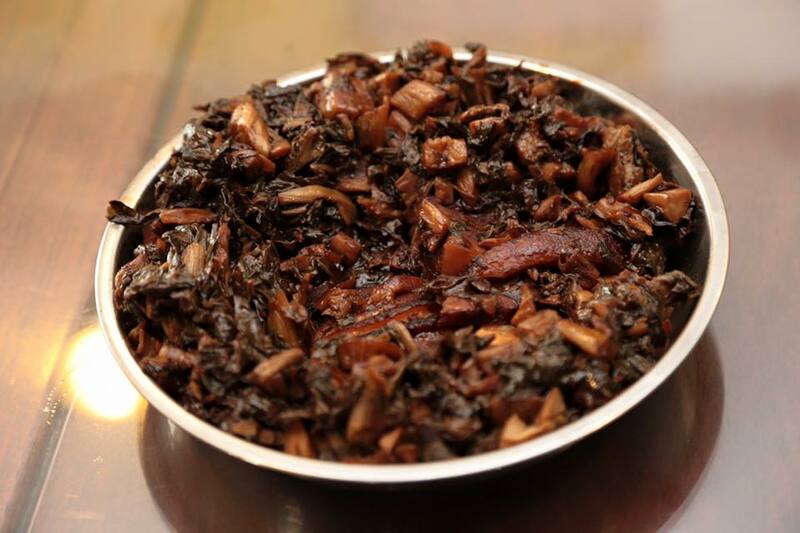 here less meat more yam. steamed chicken feet just as good though, as good as anywhere. 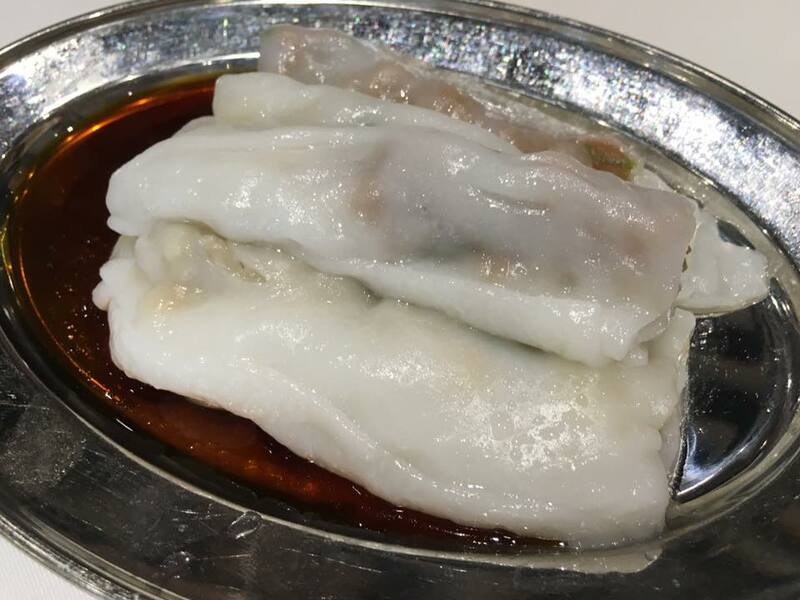 the beancurd skin dimsum pretty ok.
鸡扎 or something like that? 鸡扎 also harder to share. we were down to 4pax. 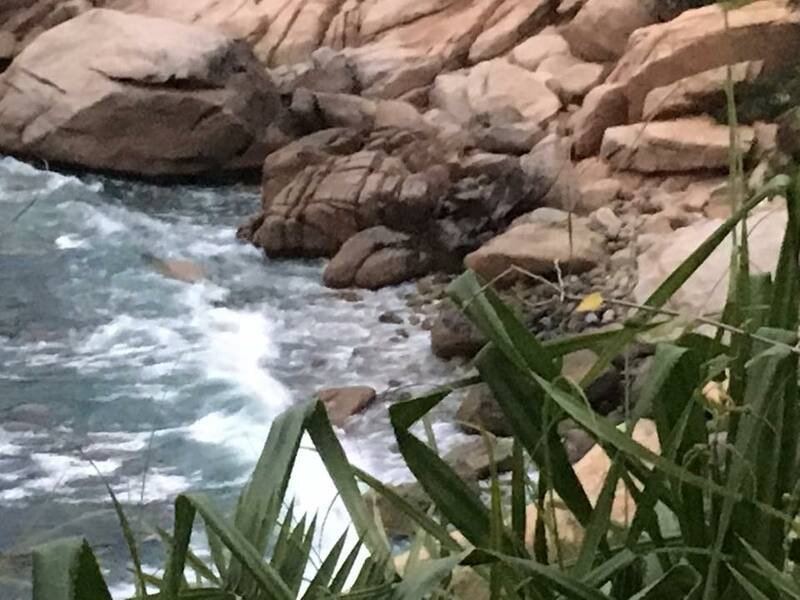 one friend had a later flight by tigerair (we were taking jetstar) so he took the time to go to macau last evening. another friend extended his stay a his family was traveling with him. 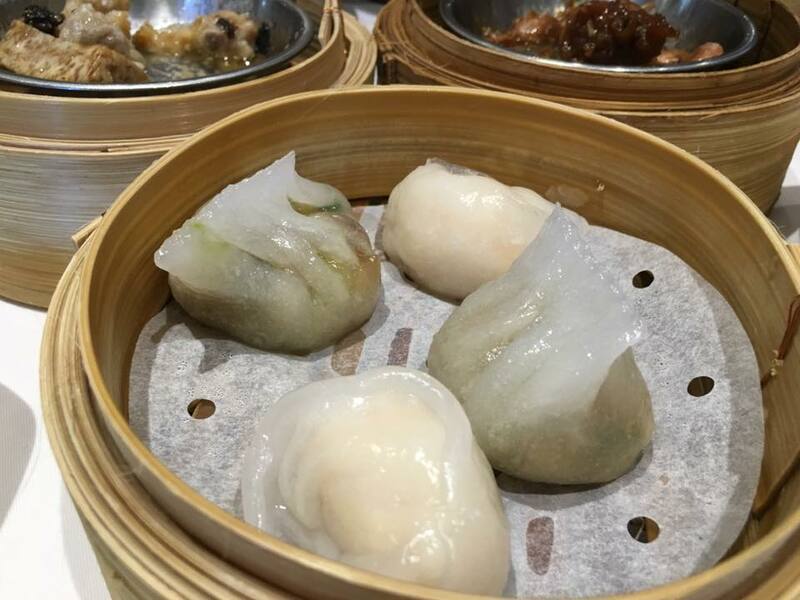 dimsum breakfast was HK$204=S$9.50pax. i guess that’s where singapore cannot match. now we have imperial treasure, crystal jade, canton paradise etc standard about same but would cost like S$20pax. 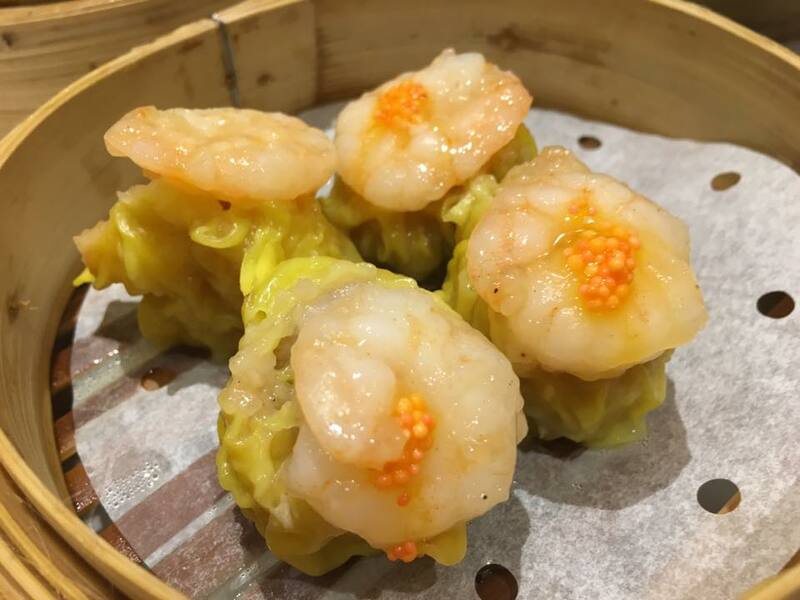 after our late afternoon dimsum sojourn at tim ho wan shamshuipo at 4.3pm, we rested & chatted at the hotel & then went for dinner at tao heung pier 88 mongkok 稻香超级鱼港旺角, making sure we were there before 9pm to enjoy the promotion. 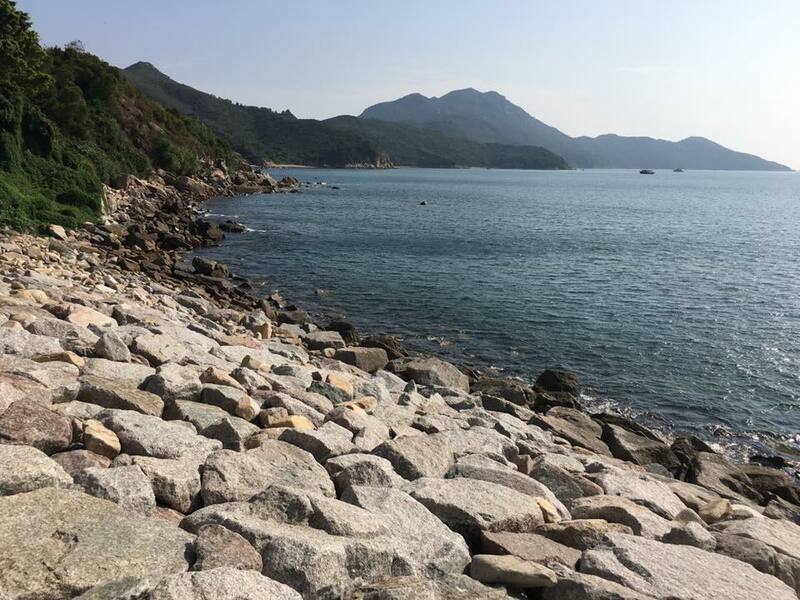 it was planned in a way, that our excursions to lamma island today (& for that matter to dragon’s back, peak circle walk & cheung chau island on previous days) need not be rushed & we could have a leisurely breakfast, do the walks/hikes over the lunch period (the cool weather so accommodating) & then dimsum at timhowan at 5pm at a time when there was zero queue…. everything turned out quite as planned, and leisurely, also as planned…haha! (we liked the desert so much we went back on 11.1.2016 & 12.1.2016 after we had it on 10.1.2016. both days they were closed. so first opportunity on 13.1.2016 we went again). i guess dessert was a good start for dinner! the large restaurant was pretty full. we managed to be seated w/o queueing before 9pm. 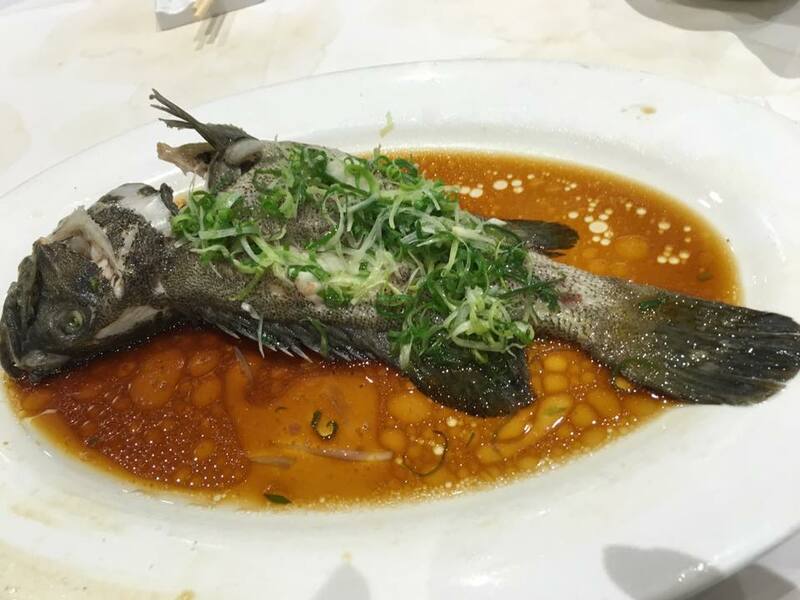 that’s the HK$78 steamed live garoupa. 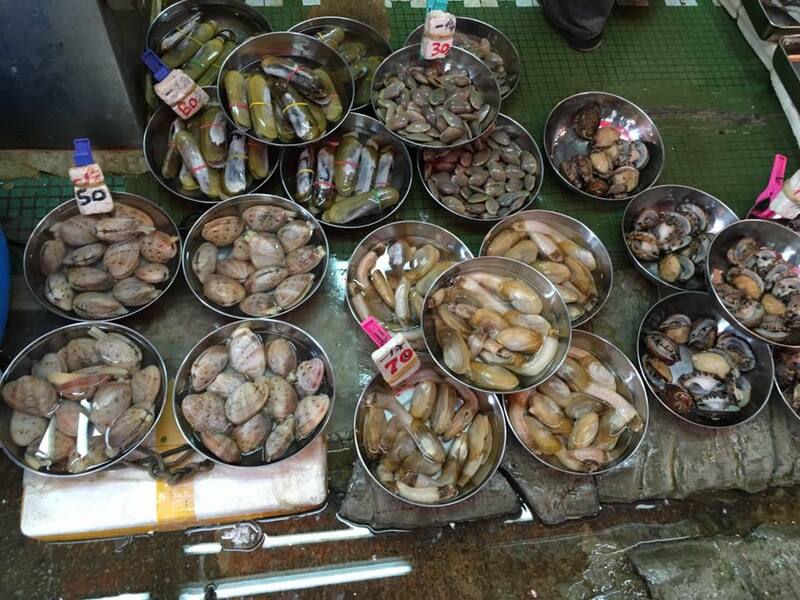 it was a large fish i estimate 800g to 900g. managed to get the other promotion 1/2chicken at HK$34. 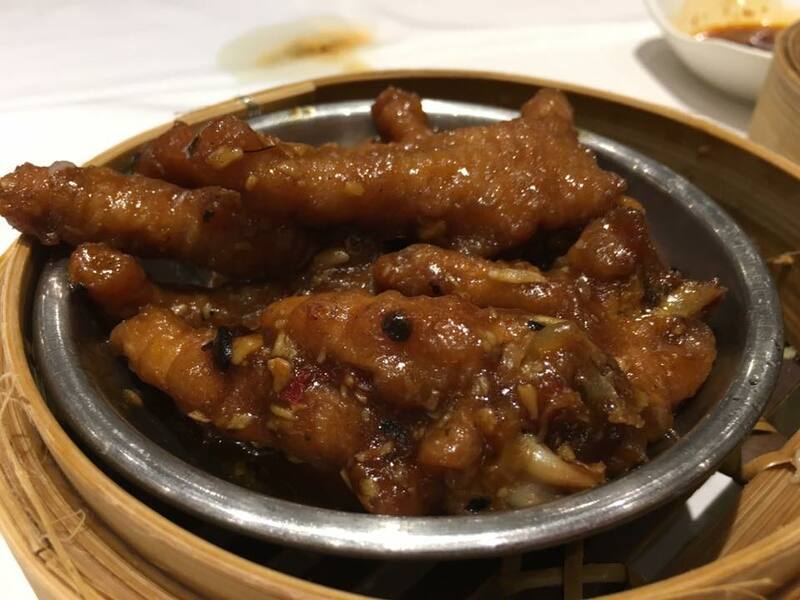 it was passable but not great…not like the ginger sauce chicken at yue bo 鱼宝食馆! 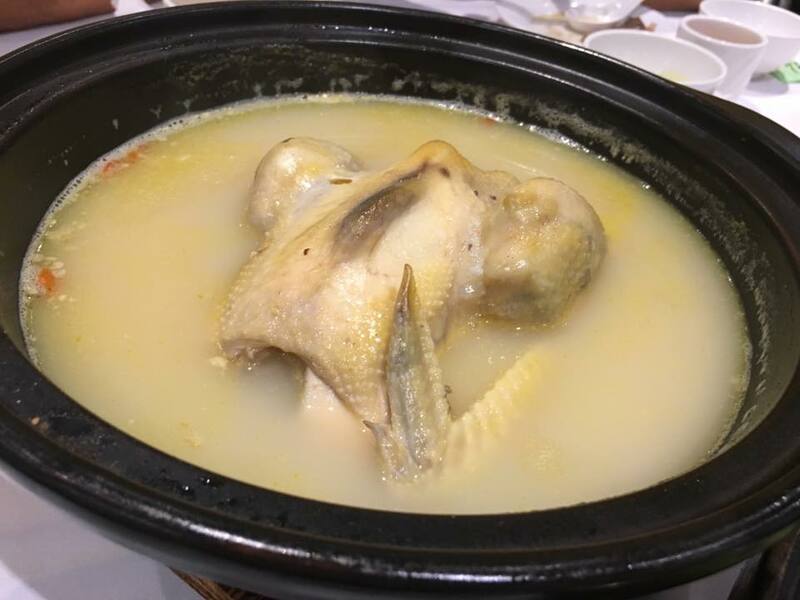 just as well we did not order the HK$68 for a full chicken! 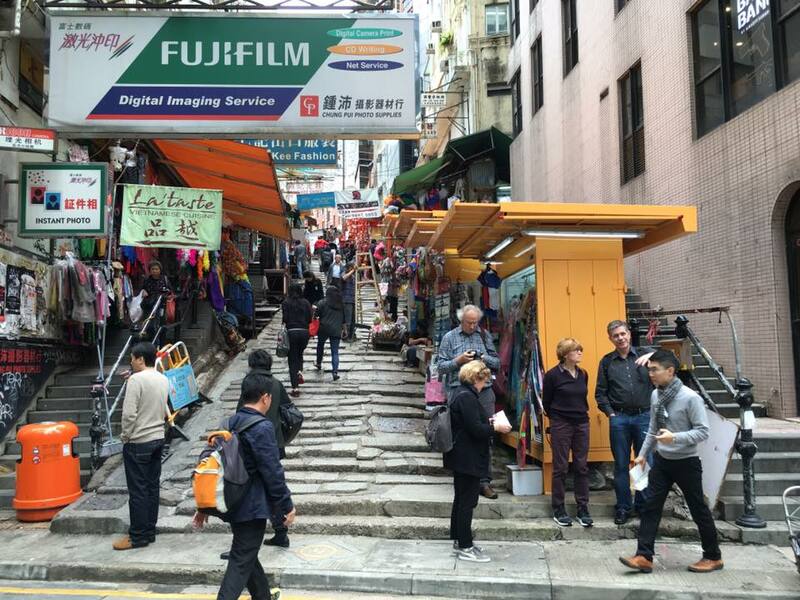 the HK$38 buddha-jum-over-the-wall, another promotion, sold out liao! the proactive quite nice not pushy server got us interested in the seafood. 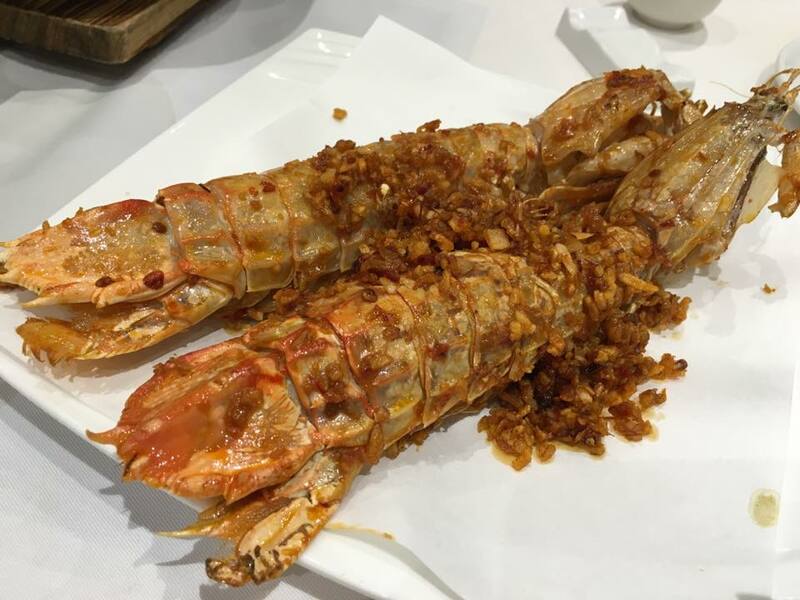 we ordered the praying mantis prawn (2 large ones for HK$198). it was very good, very tasty. and also came with a separate complimentary vegetable soup. 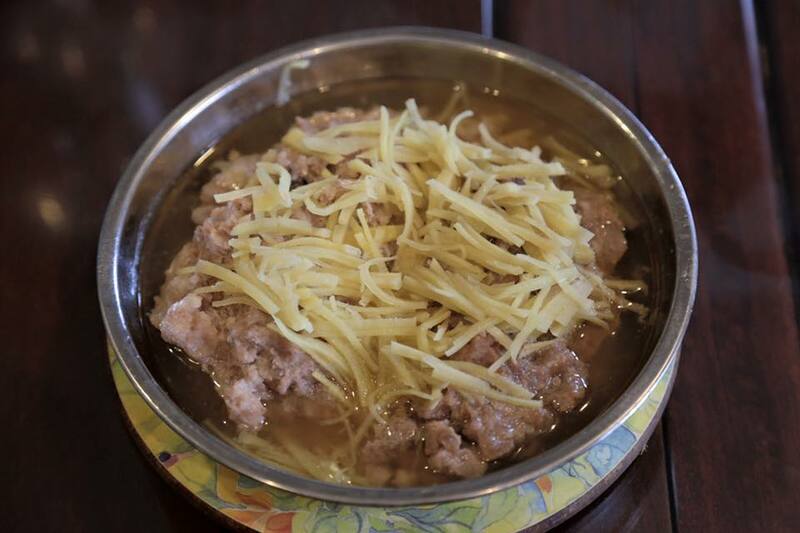 we wanted it baked in superior sauce (上汤焗)。 the server recommended to add cheese. i guessed it was not the cheese gratin preparation. anyhow we gave it a try. 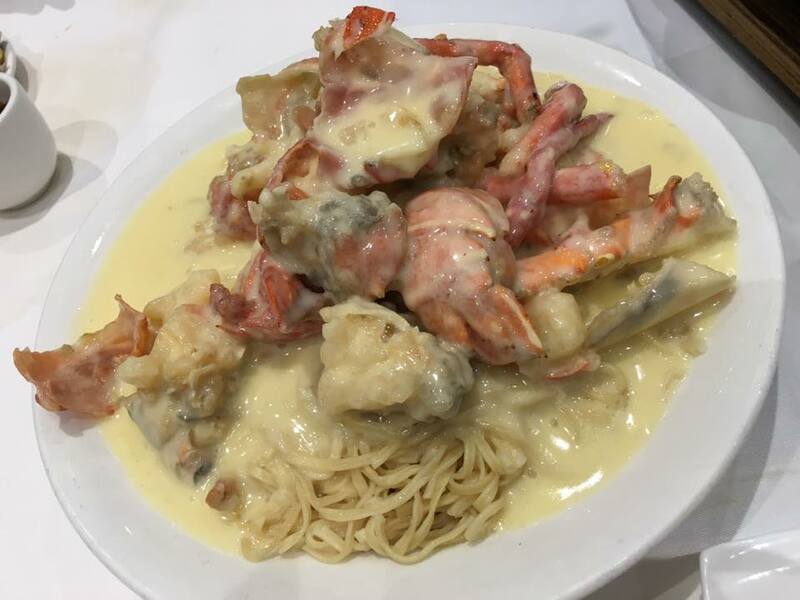 lobster was excellent, the cheese noodles made it feel like western pasta. it was done well & nice dish but not my preferred preparation. 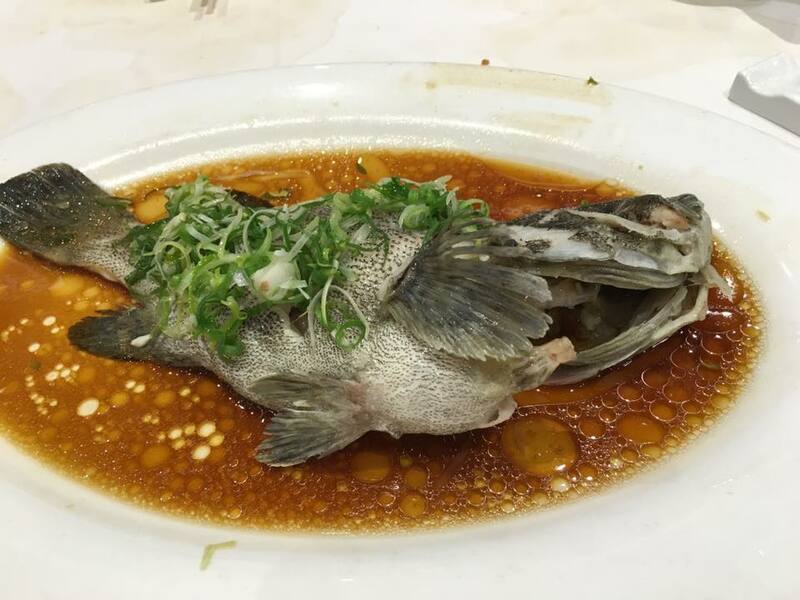 baked in superior sauce (上汤焗) would be better. the lobster also came with a free clams lala dish. this was pretty good though not special. 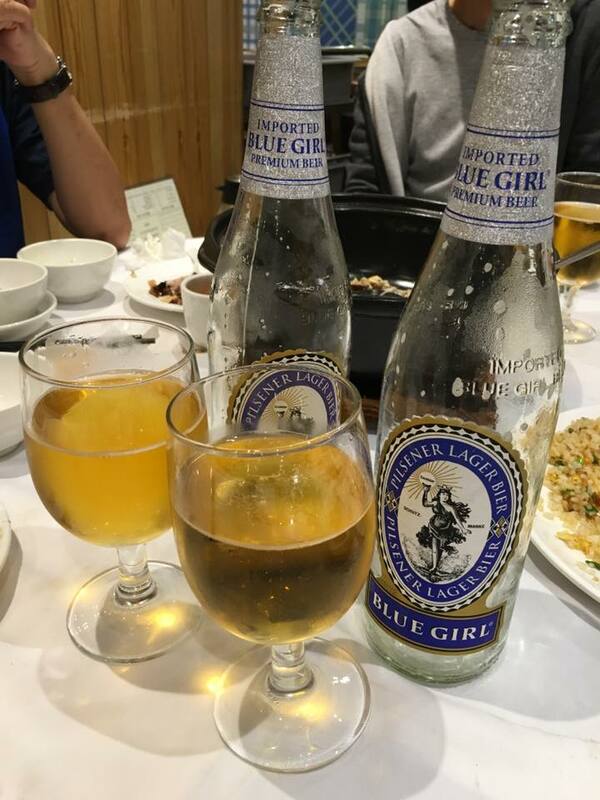 again the guys ordered 2 bottles of blue girl (lam mui) pilsener beer..popular in hong kong. 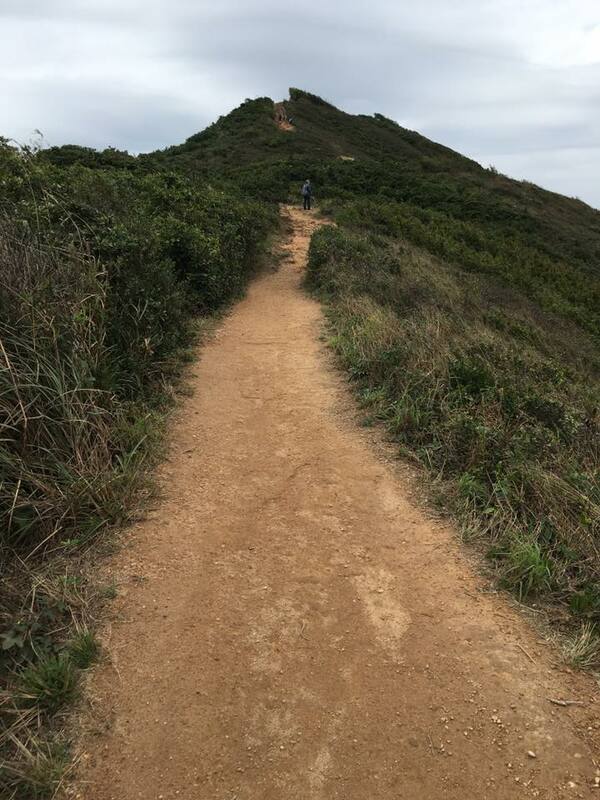 day before we went peak circle walk then yat lok roast goose, then go cheung chau island, then dinner at tao heung tsimshatsui. 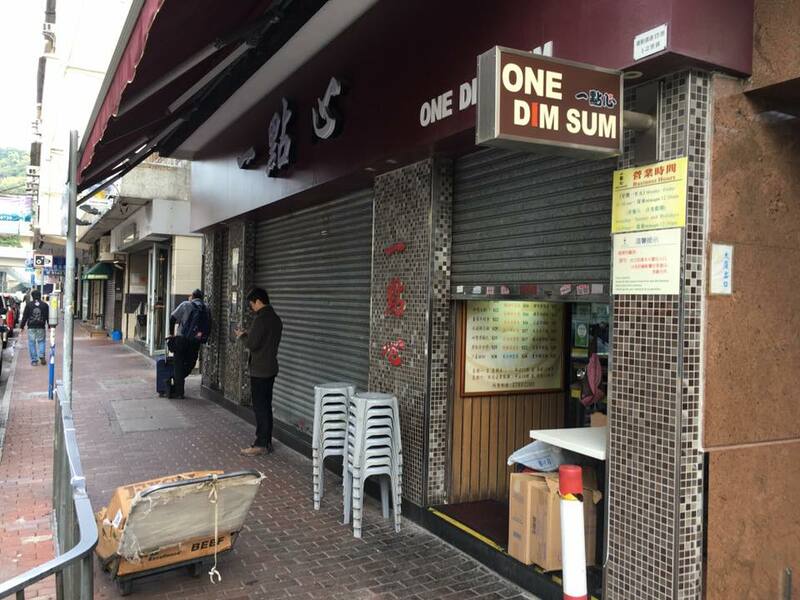 but one dimsum 一点心 only open at 11am! 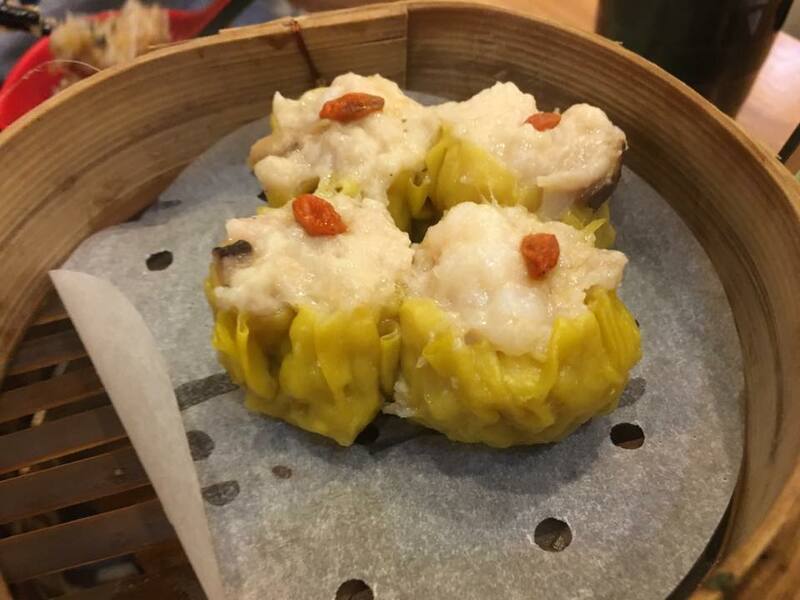 anyway we found a dimsum place along the street (playong field road) just 1 block from one dimsum 一点心. 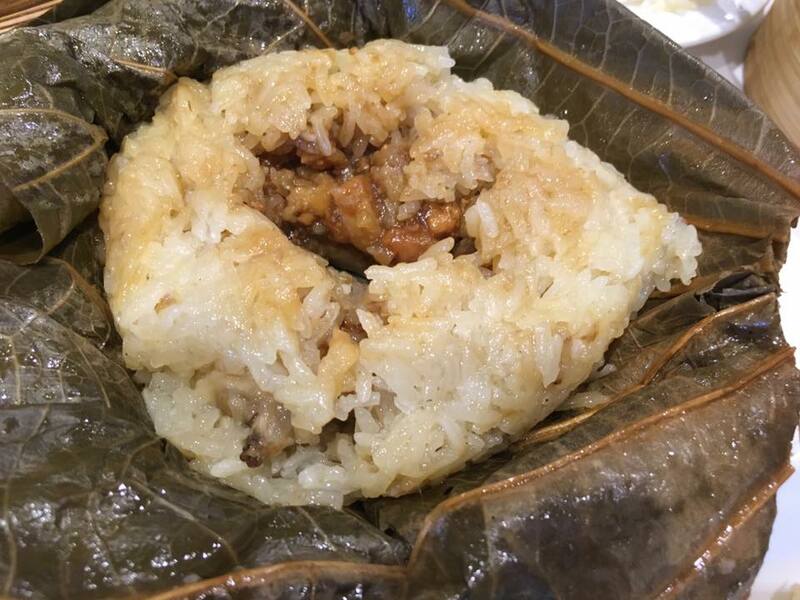 叉烧包char siew pao was good! 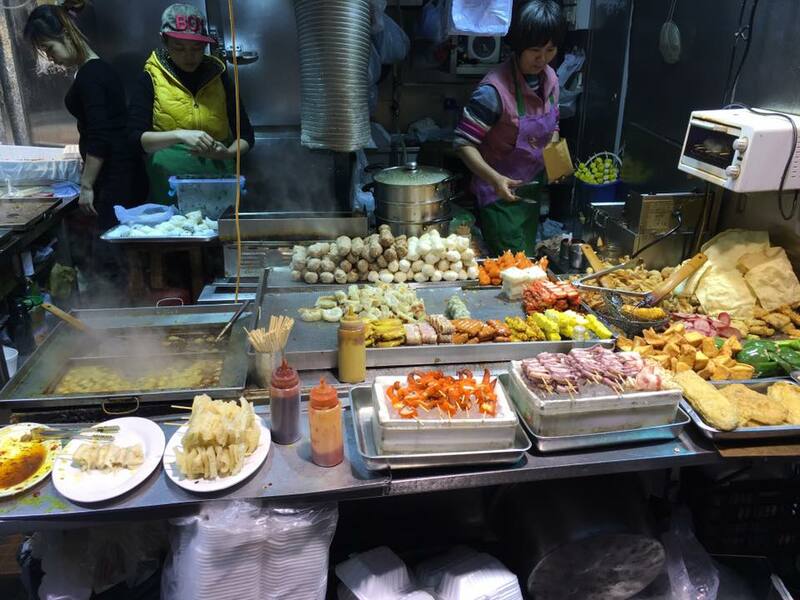 just like tao heung mongkok’s. 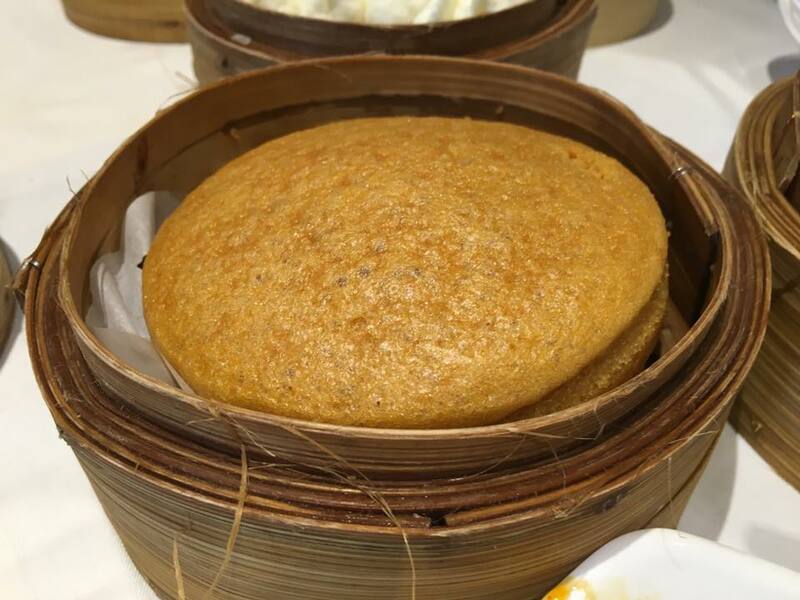 i hardly ever take 叉烧包char siew pao in singapore…i hardly go dimsum anyway. 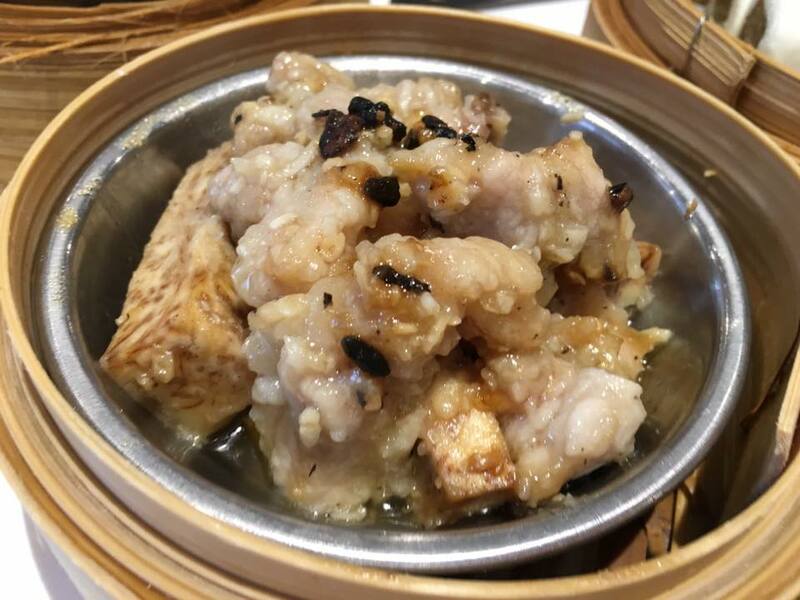 steamed pork ribs were good, but i think timhowan’s steamed pork rib the best. 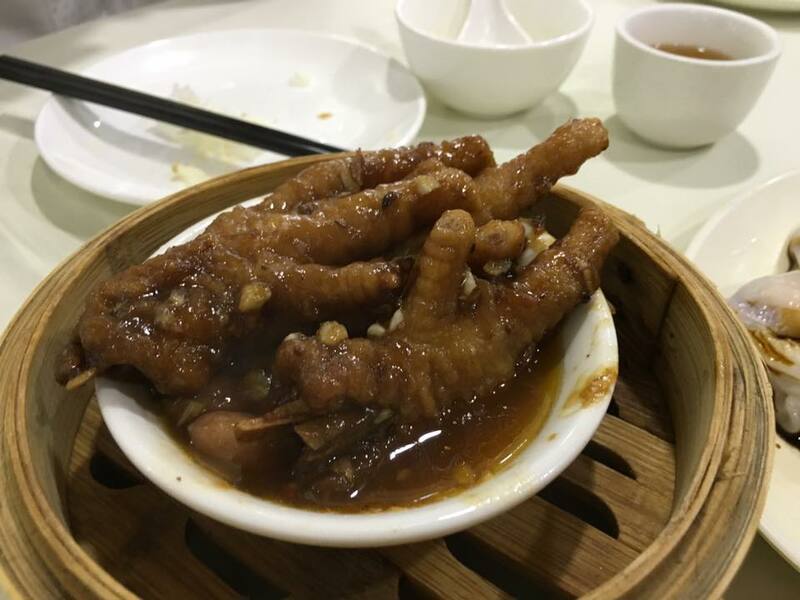 steamed chicken feet a bit less good. 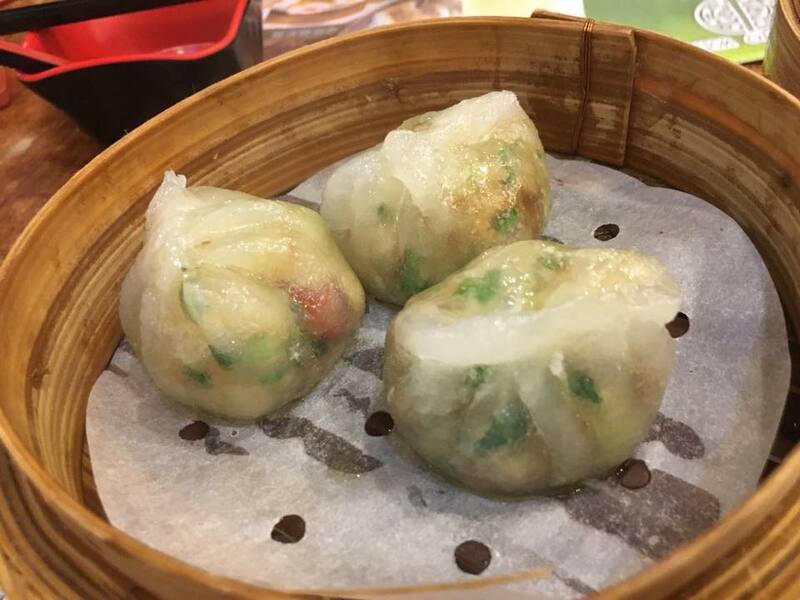 siew mai also. 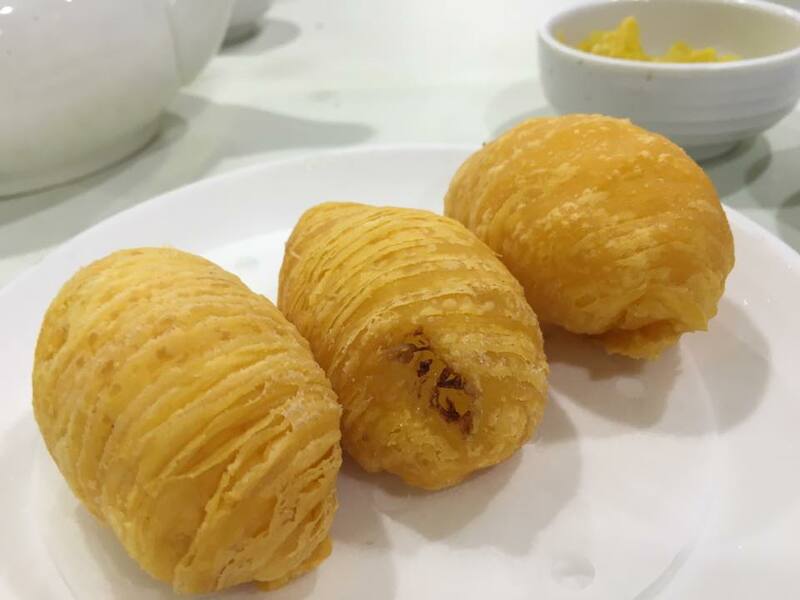 my siew mai king friend never forget to remind us tao heung mongkok’s siew mai won was the best! 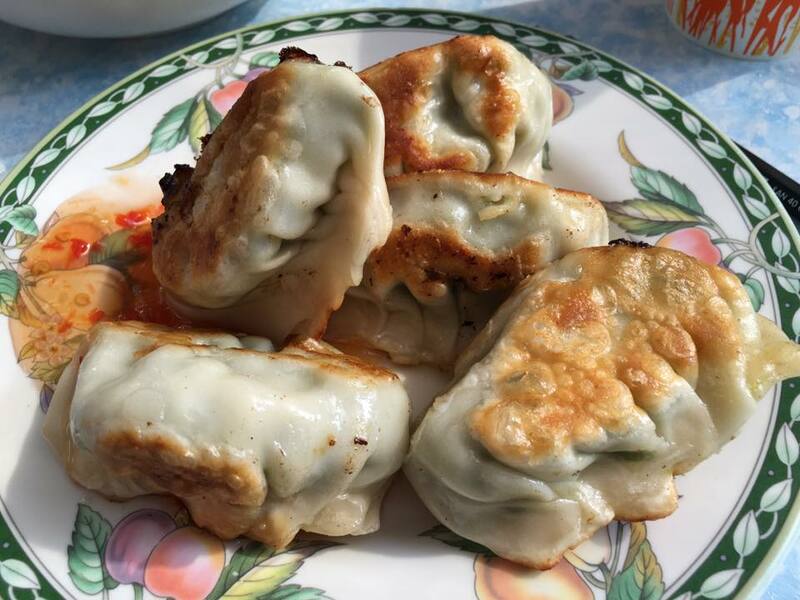 har gao was good, good everywhere anyway. fried carrot cake ok, not so flavourful. 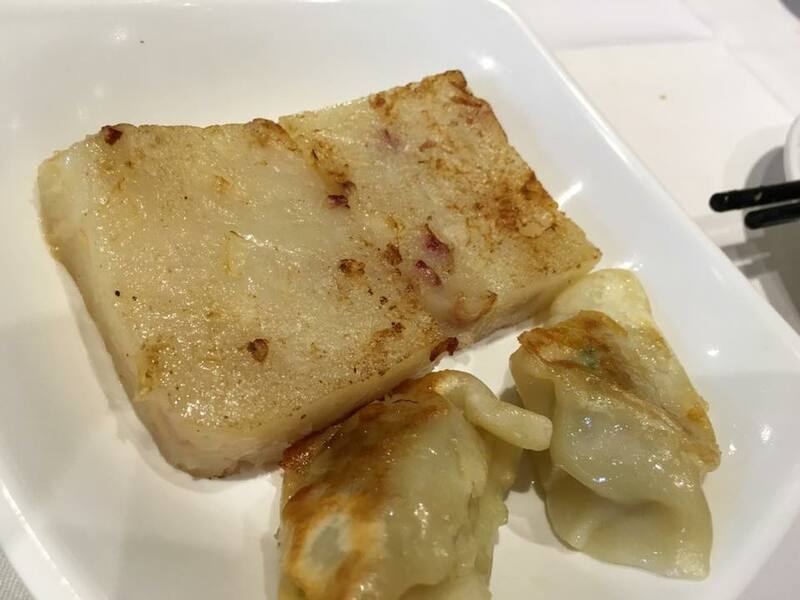 fupeiquin 腐皮卷 was very good, very tasty. 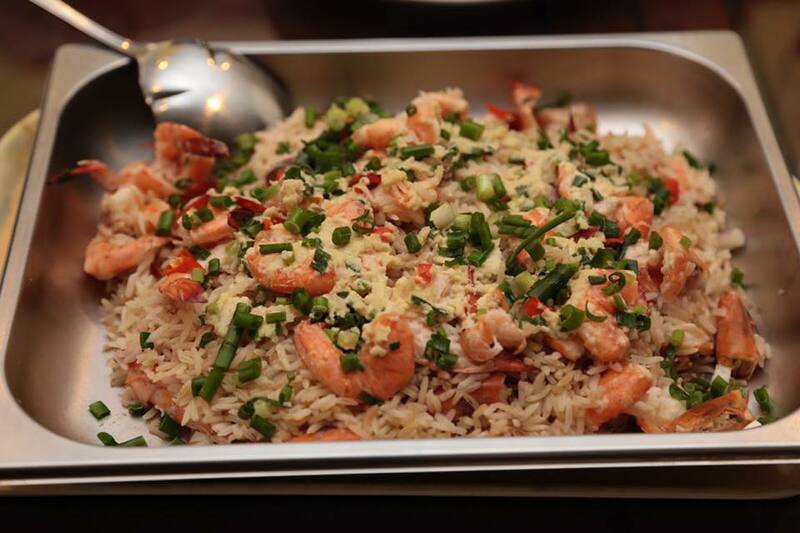 the 4 treasures was good also, but this dish hard to share & cut for 6pax. we got help…a pair of scissors. 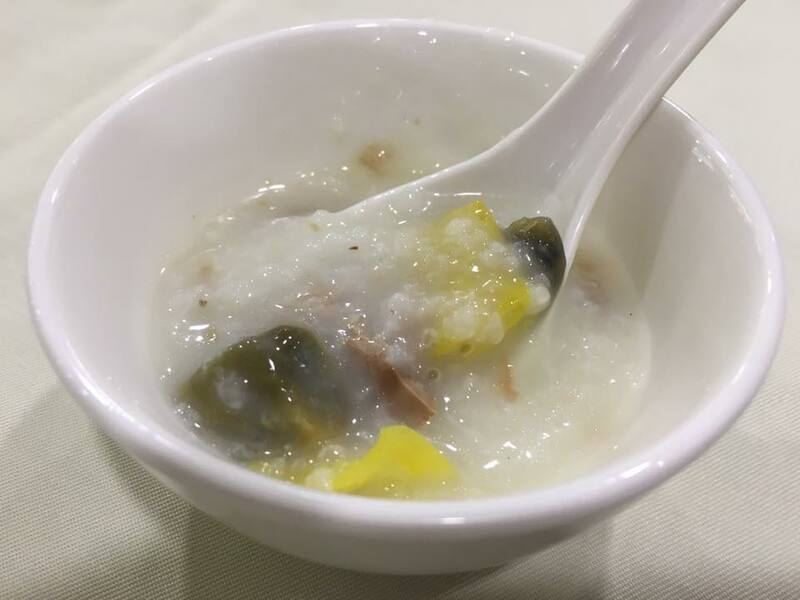 century egg congee 皮蛋瘦肉粥 was good, but not the ffu kee congee 富记粥品’s standard. 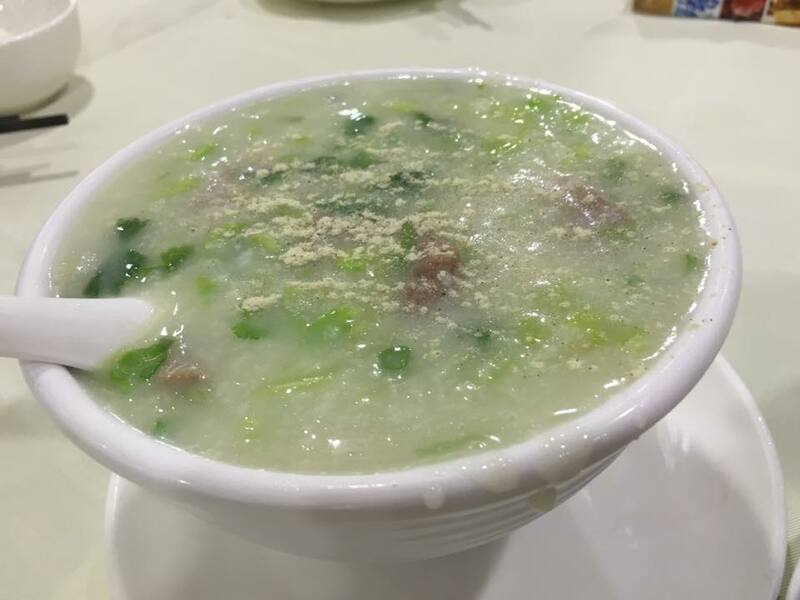 fu kee congee 富记粥品’s was so smooth like xo! 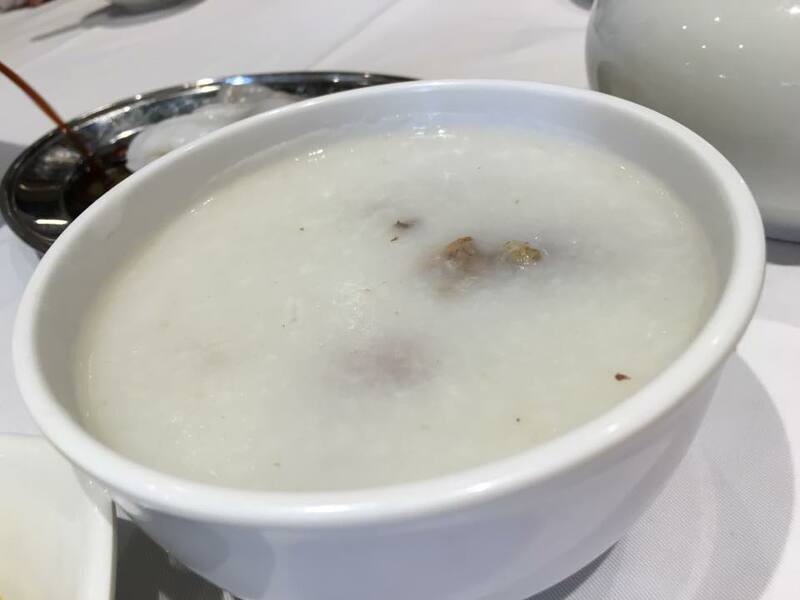 beef congee same, good not special. 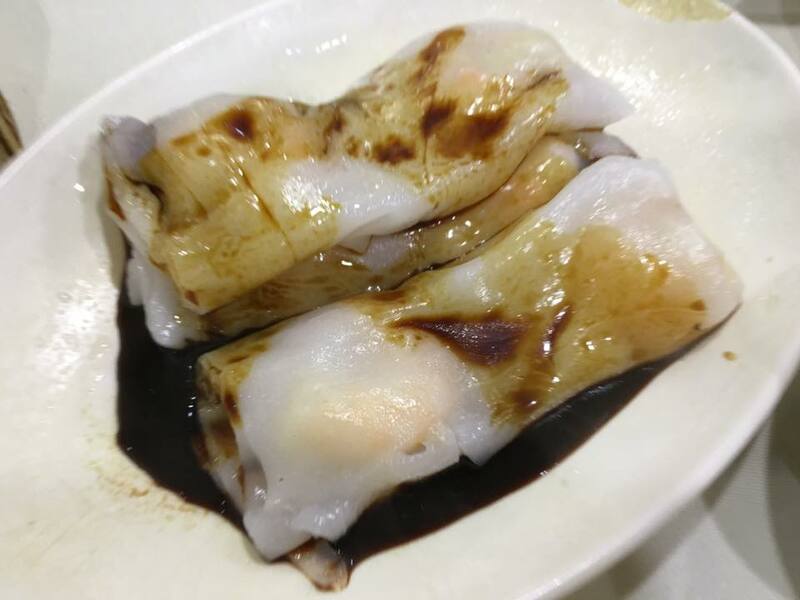 fun cheong ok not so smooth like timhowan. the radish crsip also very good! friend liked it. 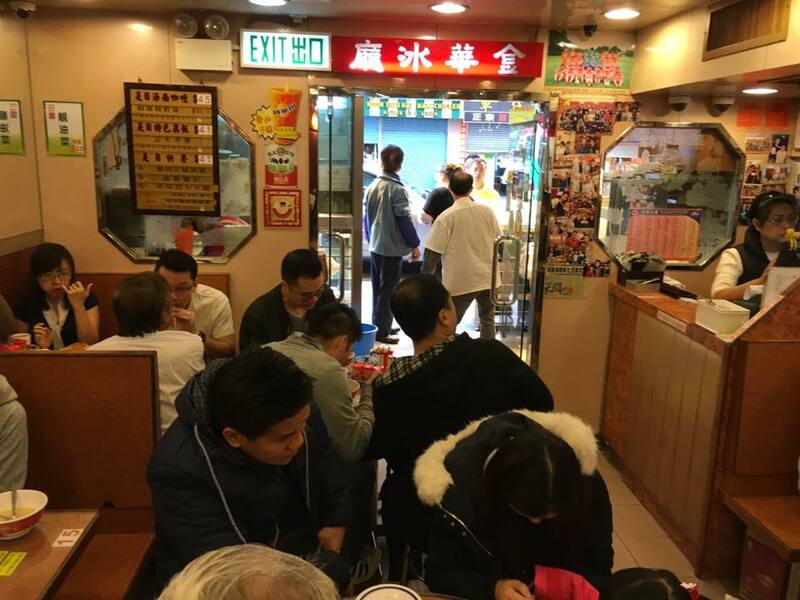 we ate a lot, like at tao heung mongkok, a lot more than at timhowan. 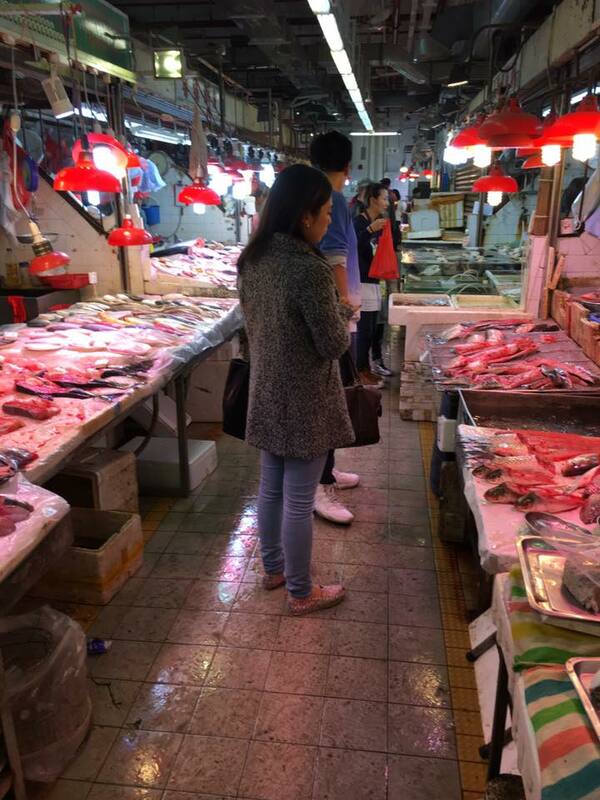 after a satisfying lunch at the accidental find yue bo 鱼宝食馆, we made our way to tsimshatsui to do some “shopping”. first a friend was told on whatsapp about jenny’s cookies so we thought we would grapped some at the stall at tsimshatsui. how silly of us! we found jenny bakery at shop 24, GF, mirador mansion 54-64B nathan road alright, but we were directed to the back street where we were told there was a queue & someone giving out numbers. 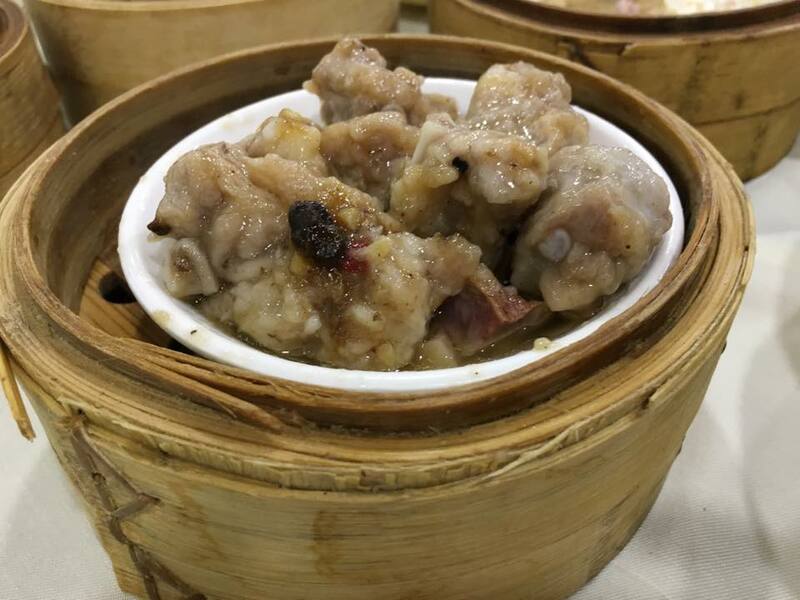 anyway after that we went to look for 楼上, found it quite easily by memory at lippo sun plaza level 5. i bought some mushrooms & dried scallops that wife wanted, and a friend bought lots of liver & sausage 肝肠腊肠. fu kee 富记粥品 where we had excellent roast goose & congee on the first night we arrived in hong kong. it was late but the stall was still crowded. they ran out of roast goose. the server took our order of 1/2 goose but came back to say they could only give us 1/4 goose. 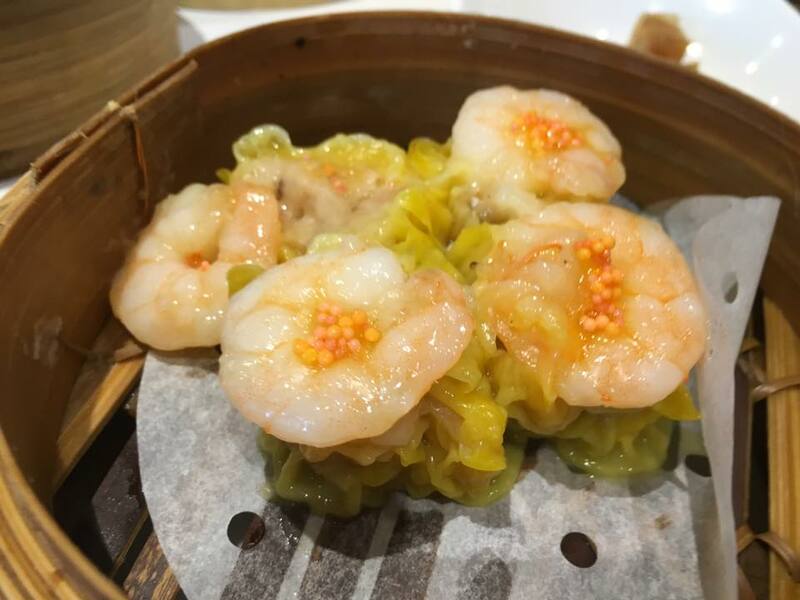 we again had the mixed innards congee及第粥 . 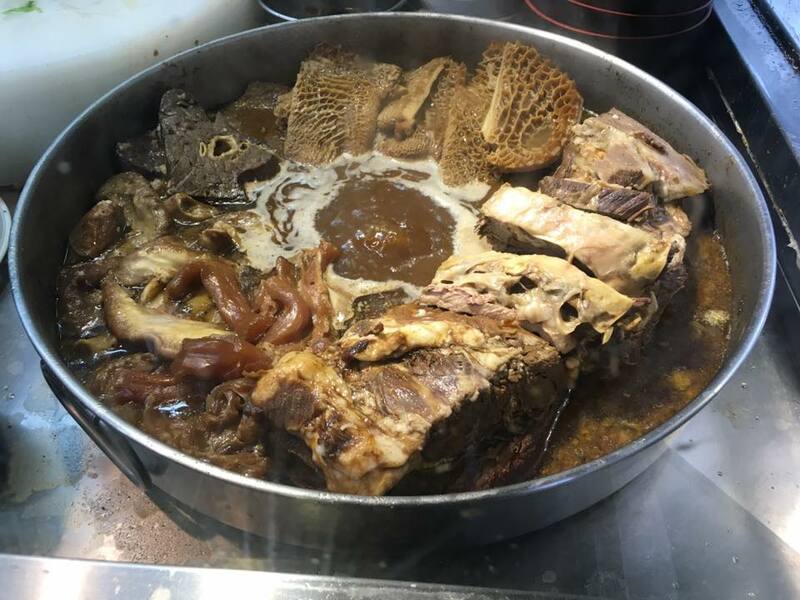 & the beef + liver soup. nice warm homely comfort food. 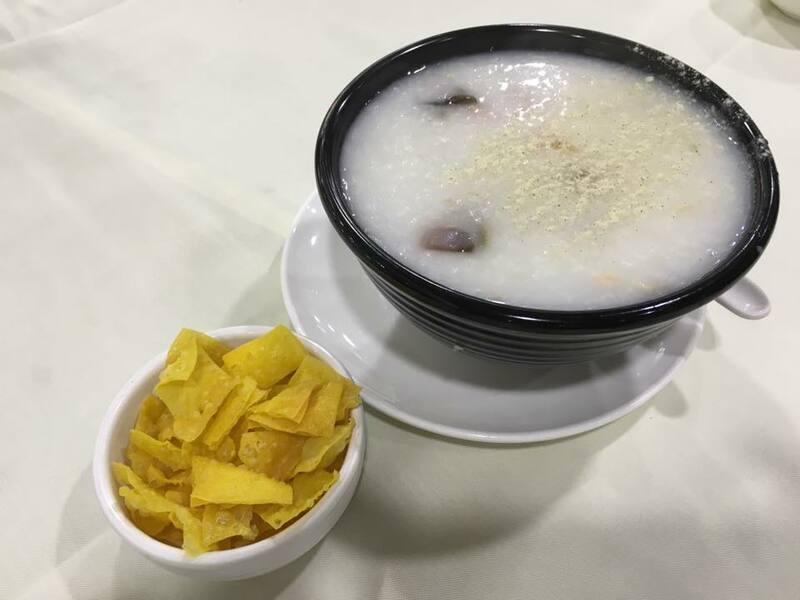 i still think this was my best congee, but then in hong kong, good congee are everywhere. 3-eggs watercress was good. 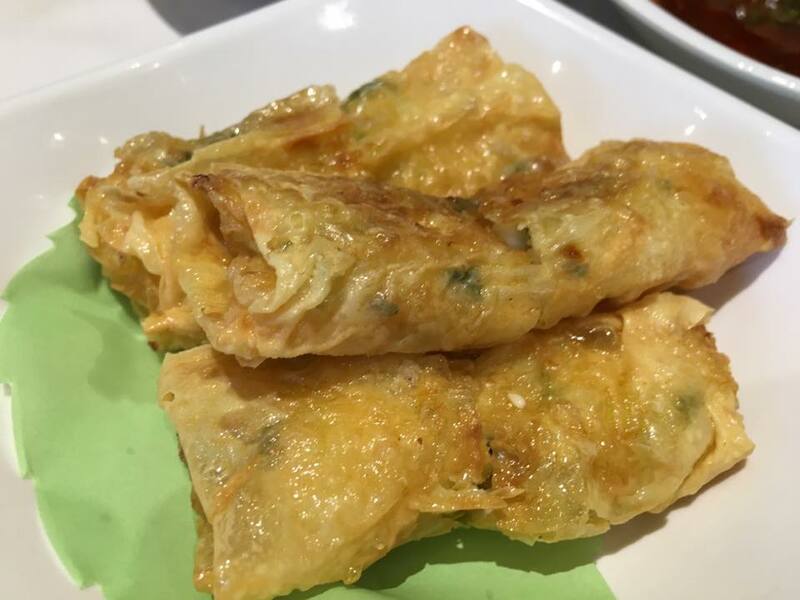 but it’s nothing like the wonderful 3-egg spinach at uncle leong’s. 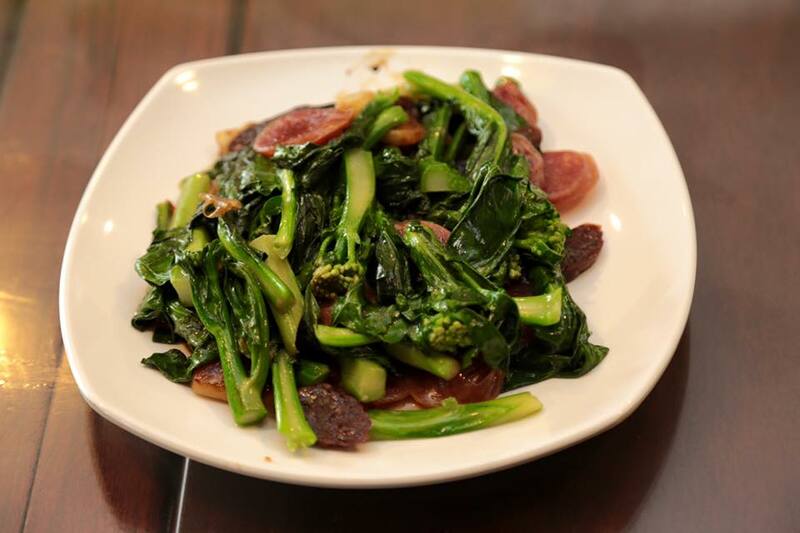 they recommended a waxed meat & sausage with kailan 腊味炒芥兰. it was good very flavourful! we had very good experience at this restaurant. both times we enjoyed our food. this second time we chatted quite a bit with the server & gave her a good tip afterwards. 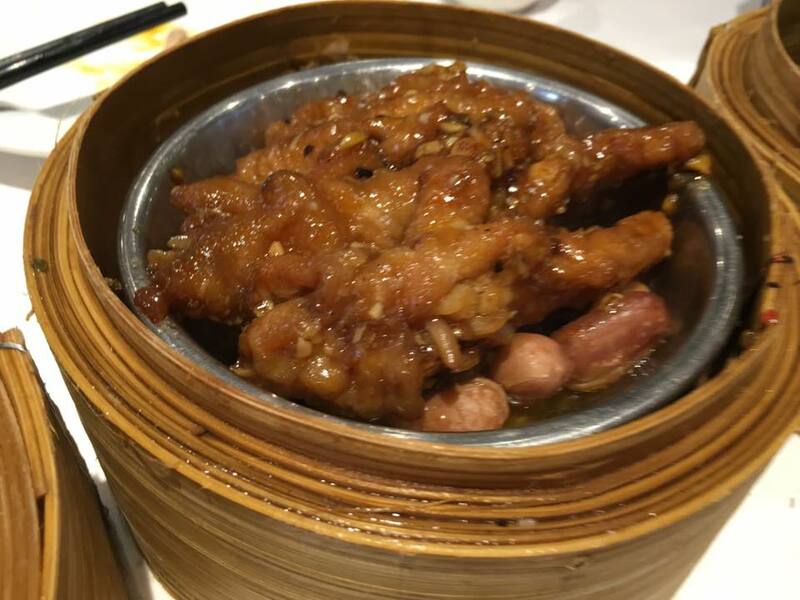 very happy with the food, service & price plus the added convenience of good location & will come back again next visit to hong kong. there was no queue, so everything was perfect. i was here like 4 times already. a more recent one on 3.4.2015.
for my friends, it was their first. everyone liked the food, and ambience was good. the crowd here was younger & maybe more tourists. 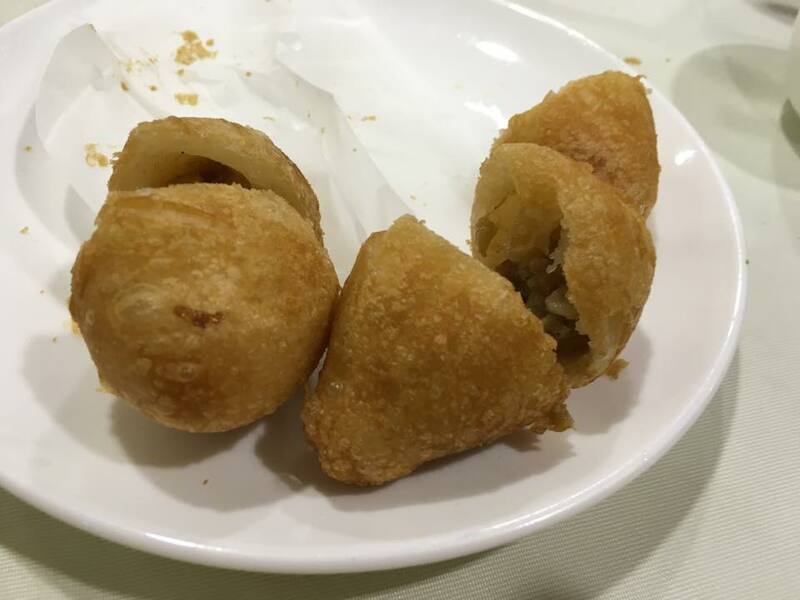 crispy char siew pao here is good as always. 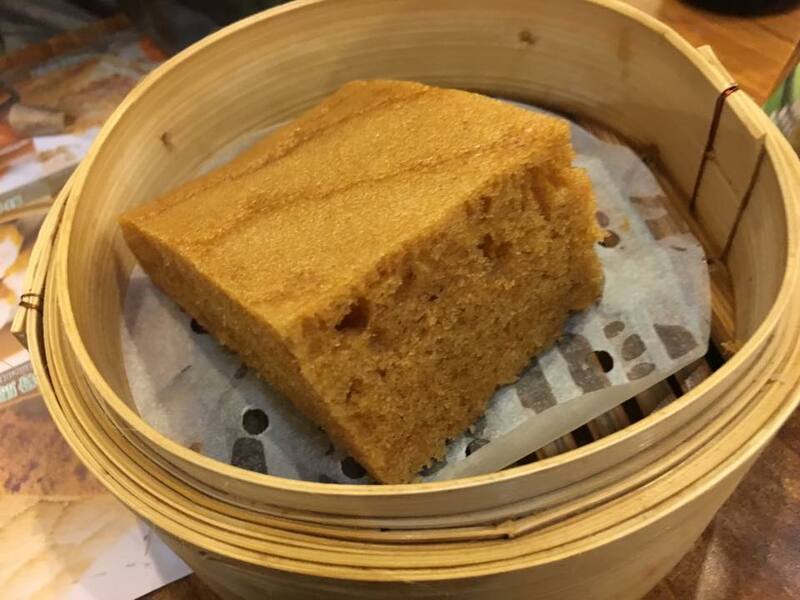 mala cake 马拉糕 good too, not my favoruite. i wouldn’t order myself. 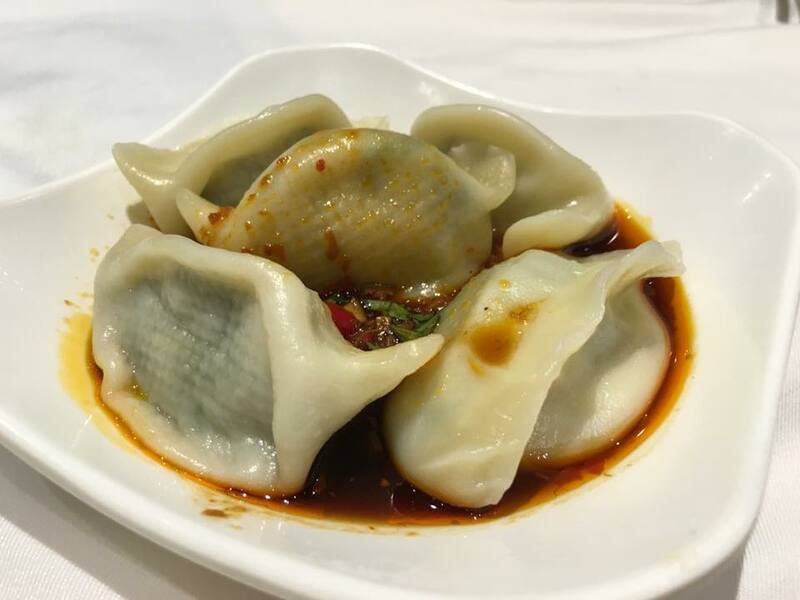 my friends liked the teochew dumplings潮州粉果. steamed pork ribs i think better than most places. 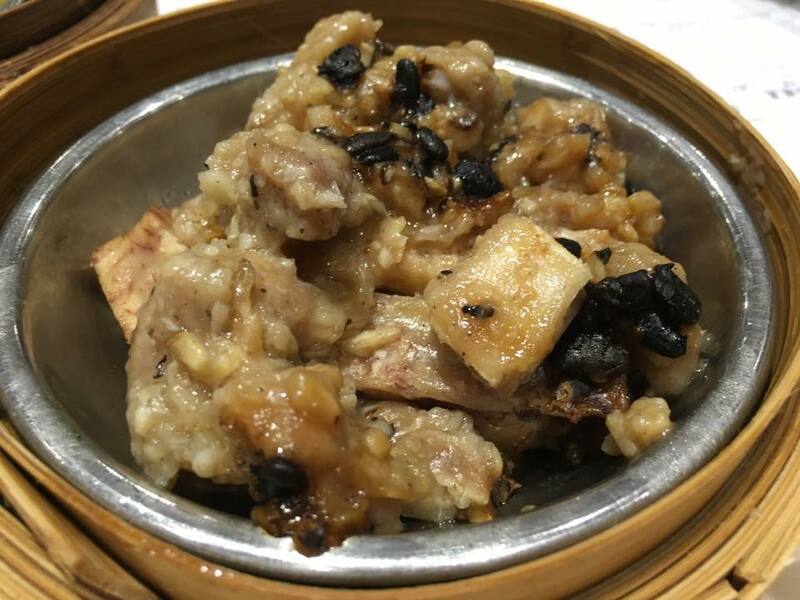 the pork ribs at tao heung mongkok 稻香旺角 had too much fat & also yam. 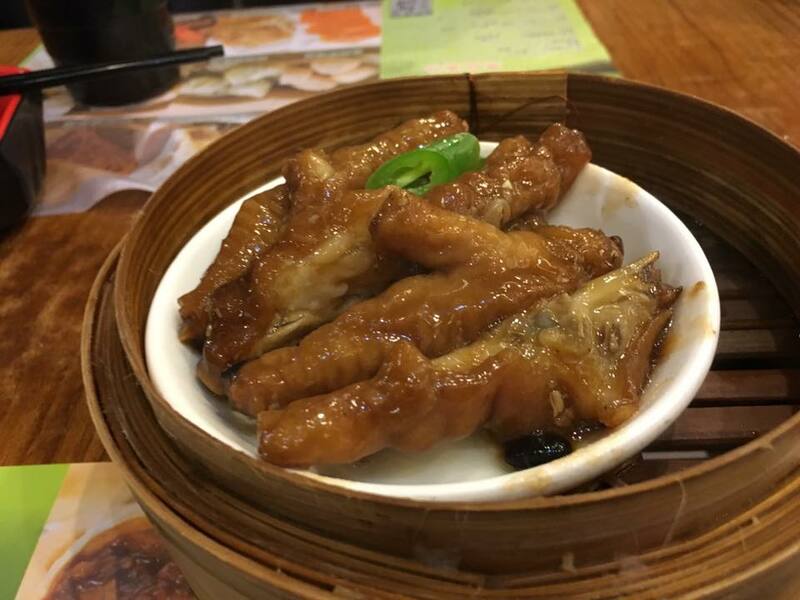 steamed chicken feet good like other places. 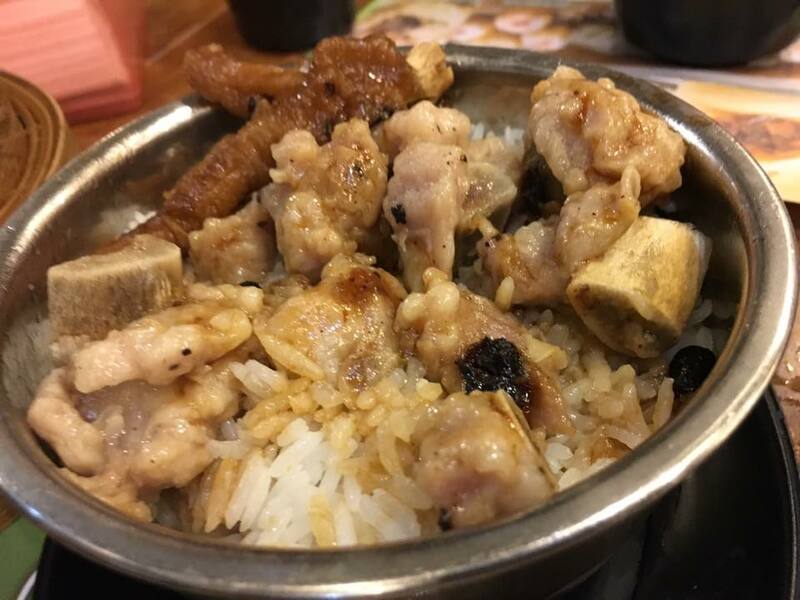 steamed pork ribs chicken feet rice. later we had another order of steamed chicken feet & pork ribs to add to the rice. 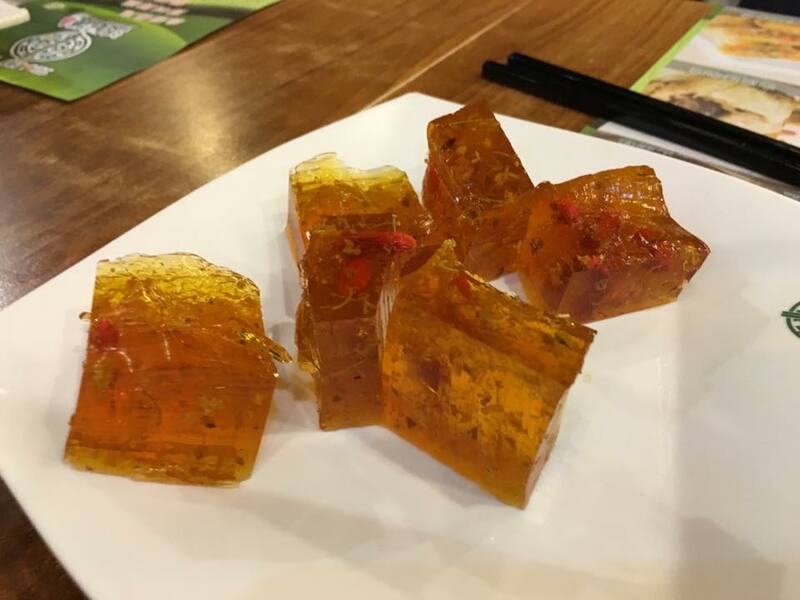 & the usual osmanthus jelly桂花糕. 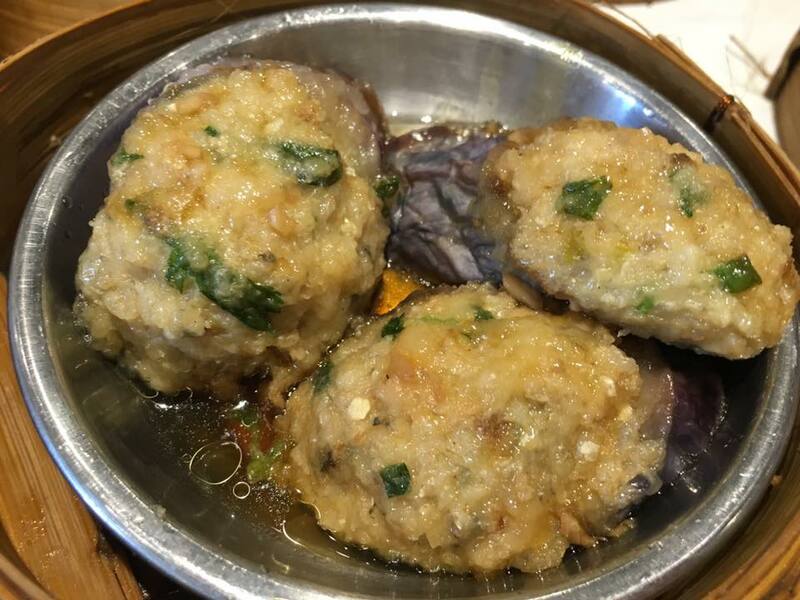 a jolly good late afternoon dimsum. 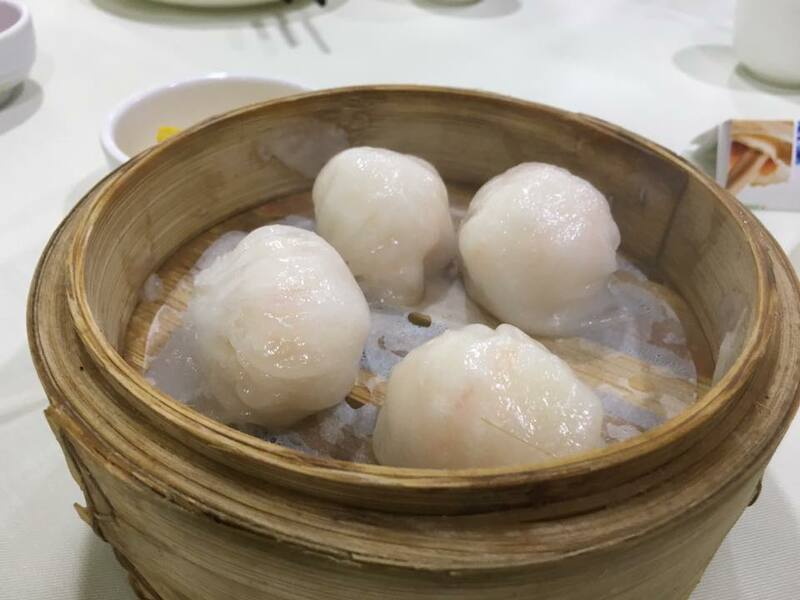 we ate a bit less i guess, no less satisfaction, & bill was just HK$273=S$8.50pax. 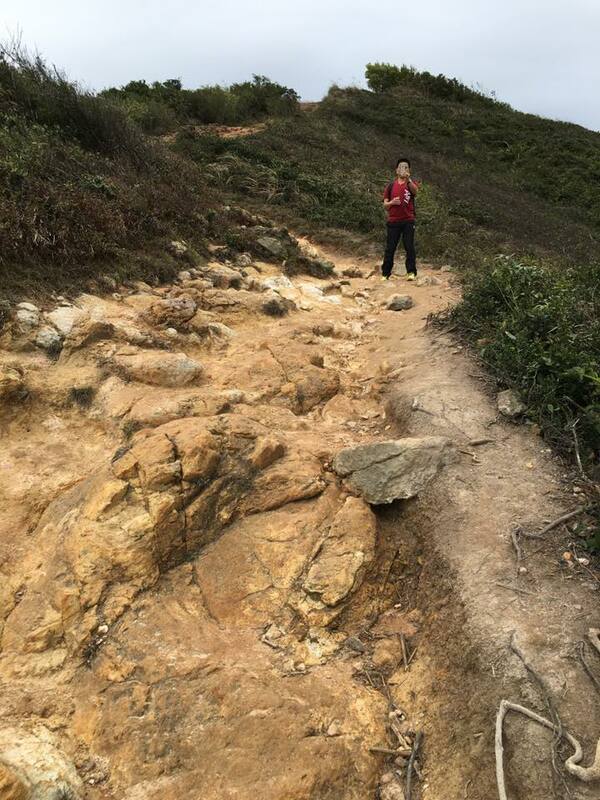 after <2hr walk at dragon’s back, we took the no. 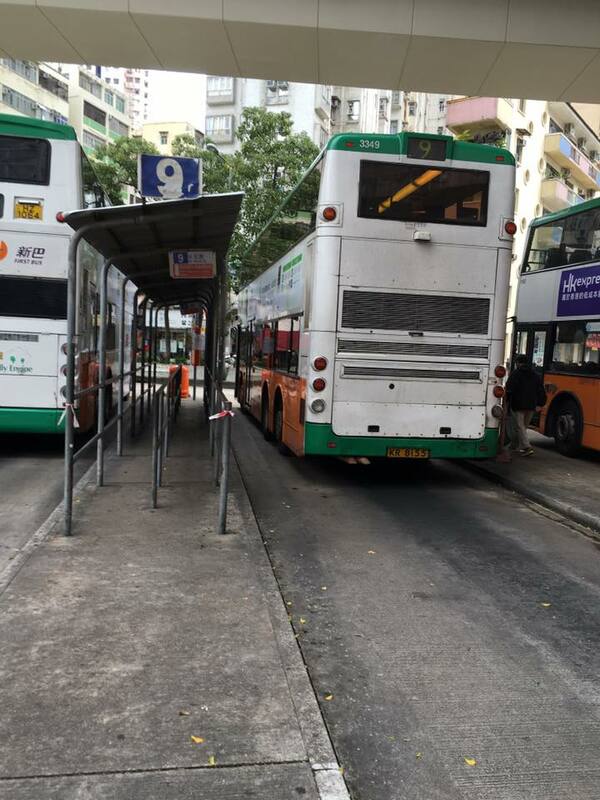 9 back to shau kei wan bus terminus on 12.1.2016.
it was 2pm. we were hungry. but the guys didn’t mind walking one round the street market. there were dry good stalls (top photo)…. 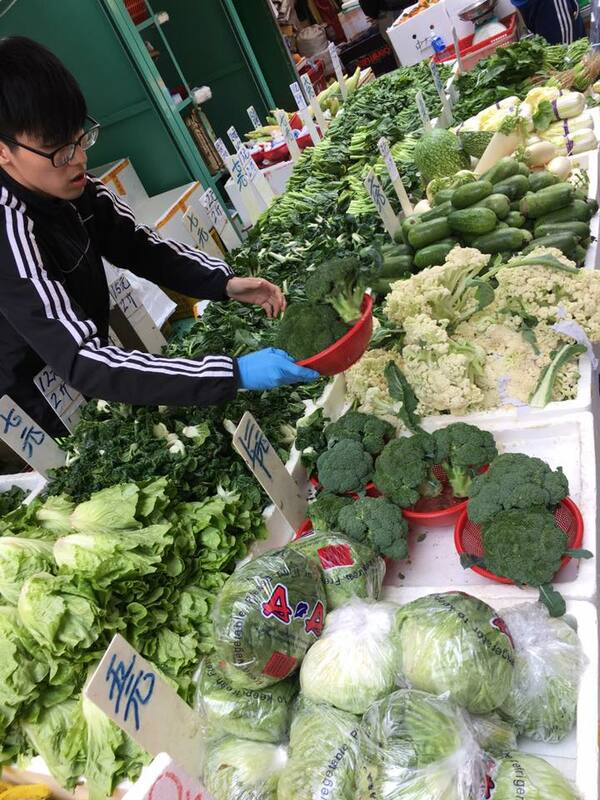 vegetables, hongkong’s the best! freshest! 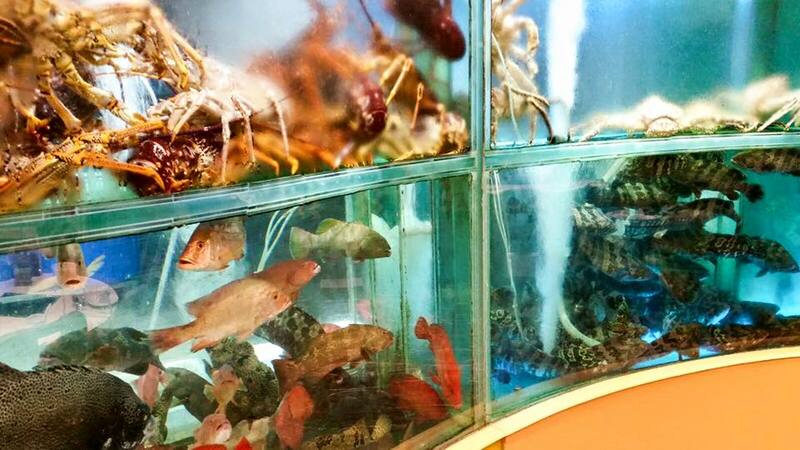 & lobsters, flower crabs, and clams & small geoduck (pronounced “gui” duck). & the big conchs 海螺. 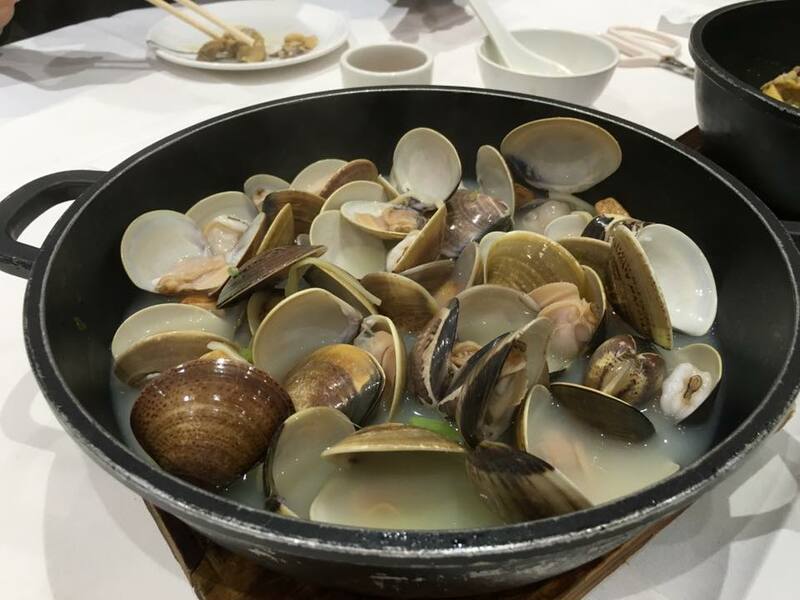 they made great soups, a common dish in hong kong – the conch soup 海螺汤. 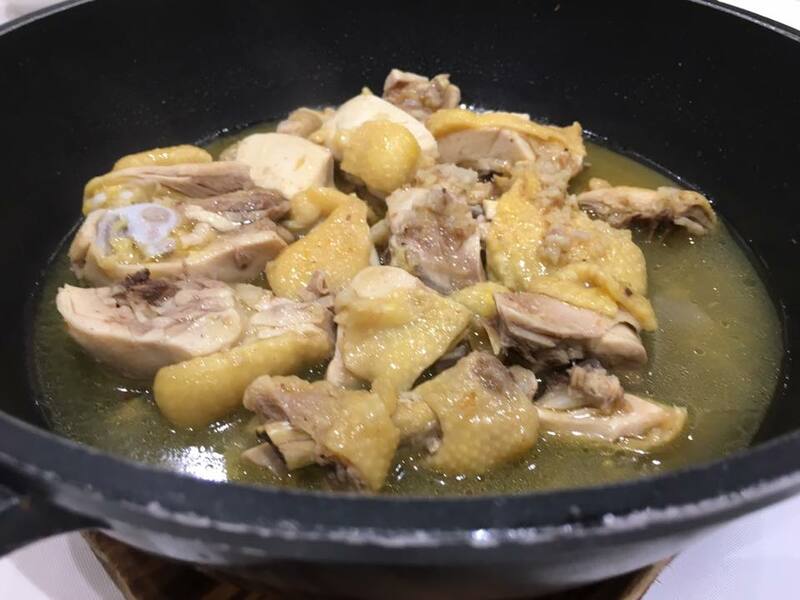 & my favourites, the braised items, 鲁味…. 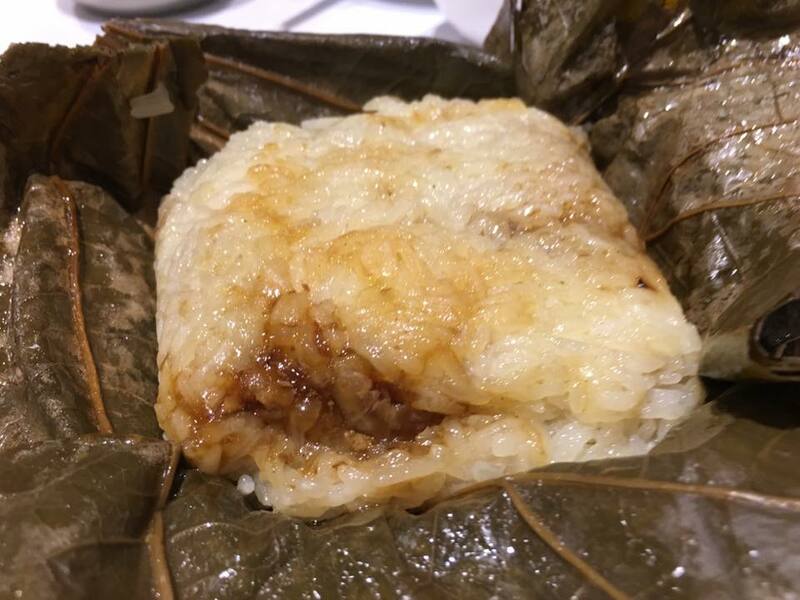 after the market, we took the mtr to tin hau, where we had a good late lunch at 鱼宝食馆! 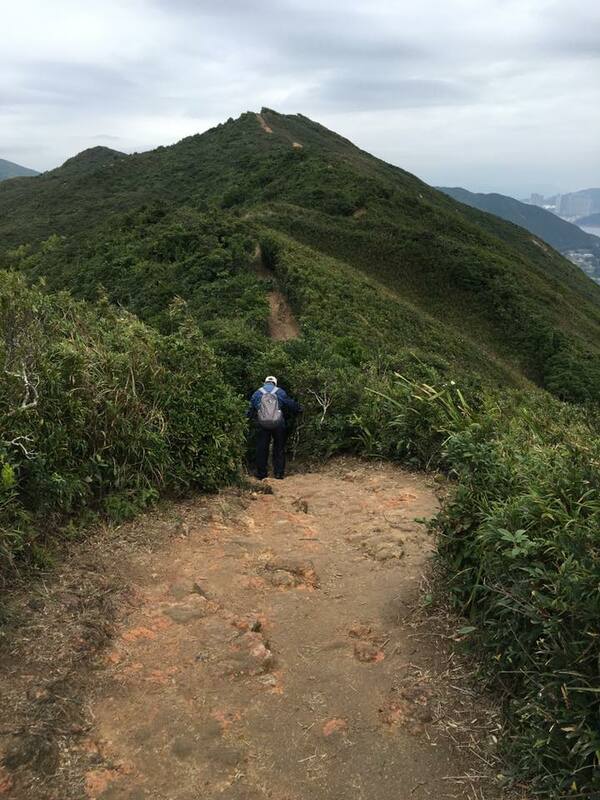 after a 2hr hike at the dragon’s back with magnificient views & fresh air, and a tour of the wet market at shau kei wan bus terminus, we renewed our search for new daipaidongs. 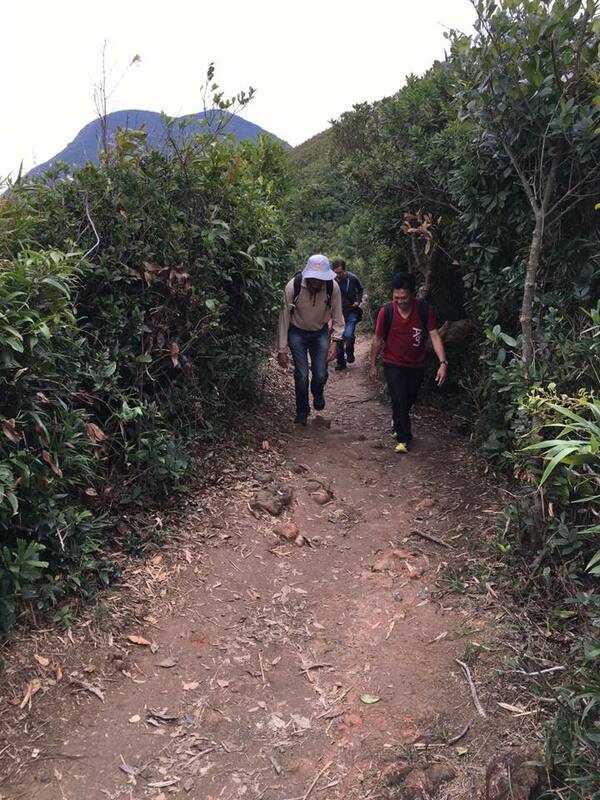 the bad tai yun 泰源 experience still fresh in our minds but there was no chance we would repeat that,,,haha! 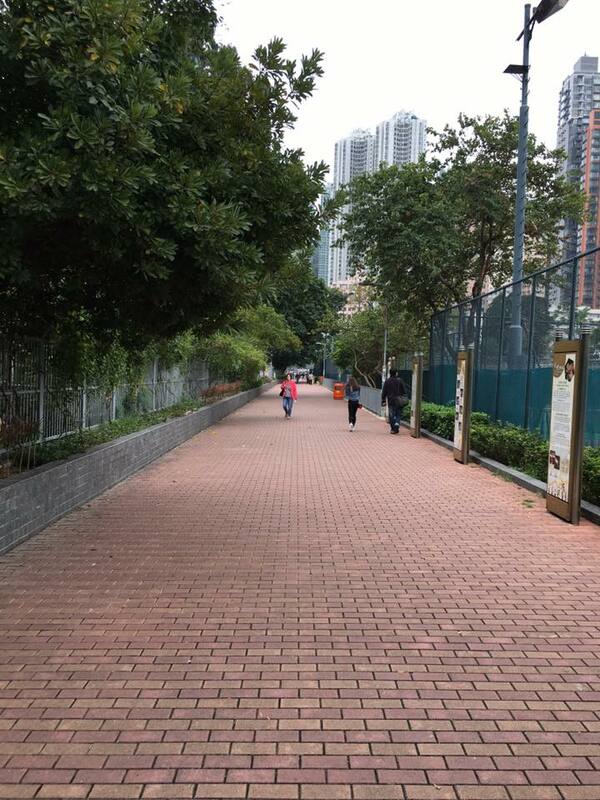 getting out of tin hau station 天后, we took the fire dragon path alongside causeway bay sports ground. 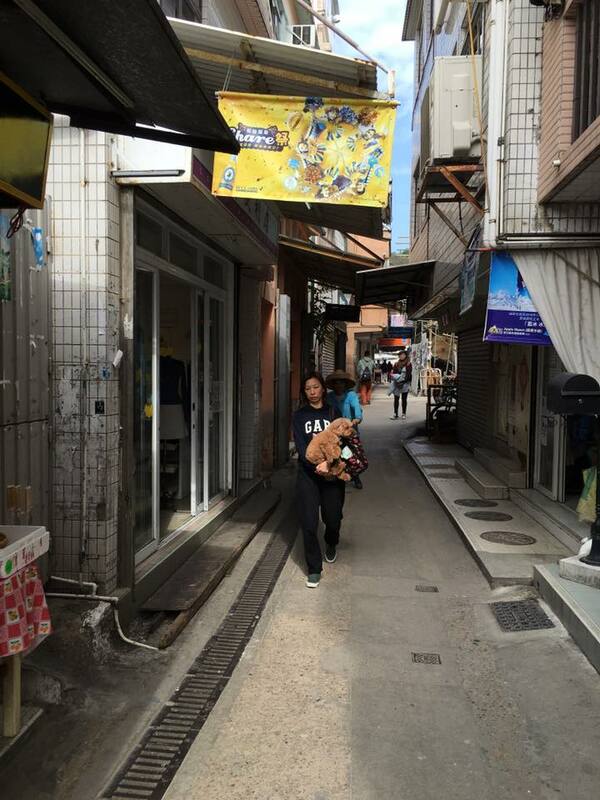 & proceeded to wun sha street 浣纱街. found 民声冰室no problem..but then it was closed. it was 3pm. lunch over liao & they open at 6pm. 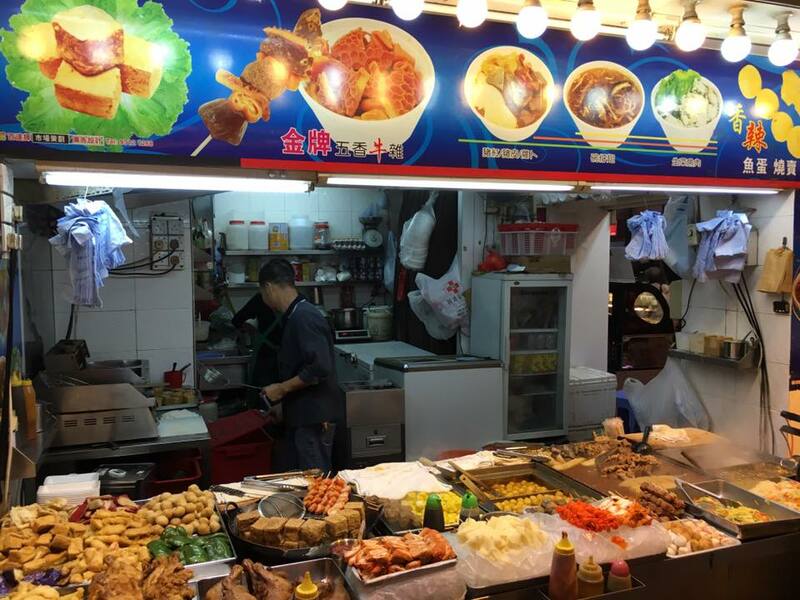 we were uncertain about the neighbour stall 鱼宝食馆 so we walked around the place but there was only a cha chan ten 茶餐厅 some fishball noodles shop 鱼蛋面, so no choice we ended up back to 鱼宝食馆. we were seated 6 on a table on the walkway when a policeman appeared. proprietress was quick to get us to stand up. there was no food on the table yet. she said “keng kai” meaning “o..they were just chatting”. 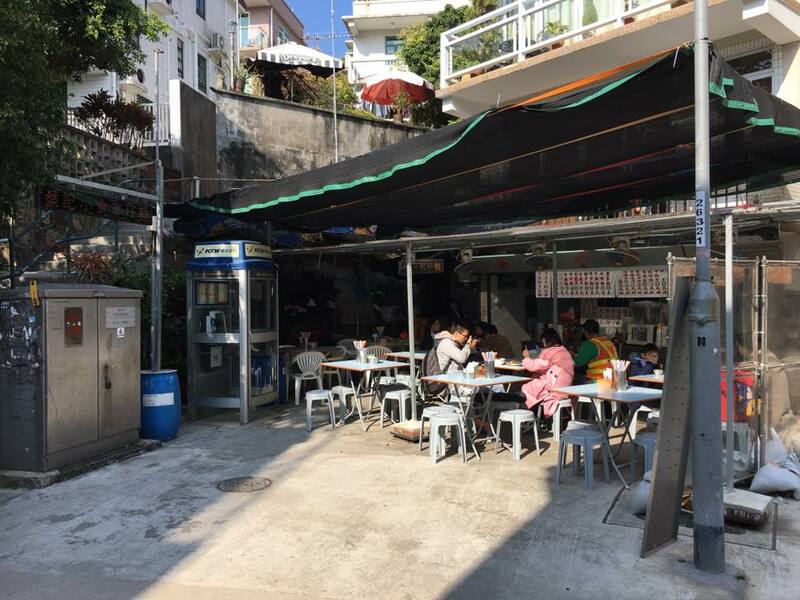 it was illegal to seat on the side street/walkways/alfresco & the proprietress later “吐苦水” to us, that she paid a high rent expecting to do alfresco. 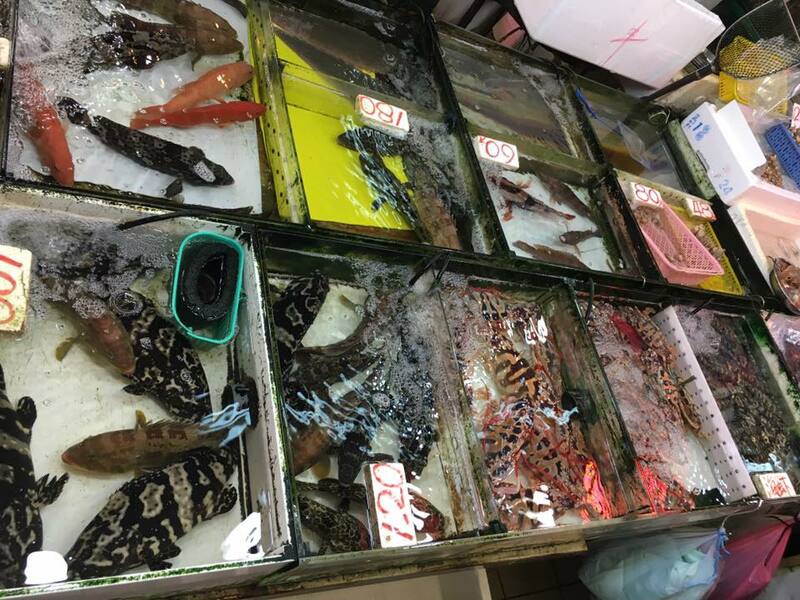 the shop itself hardly have place for 1 table, so how to do business? 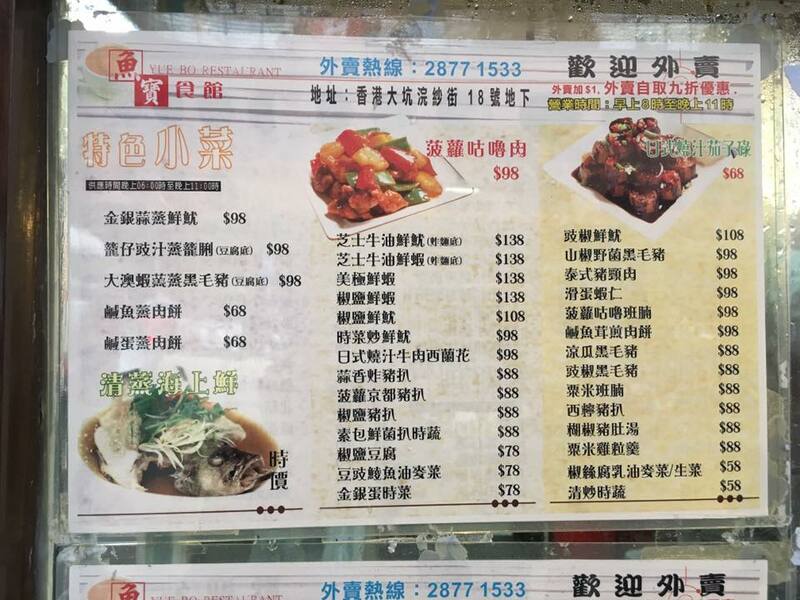 i was mostly attracted by the ngau lam 牛腩 (top photo) but they do have some items on their menu that we didn’t mind trying. since there was no place to sit at all in the shop, the proprietress managed to get us seated at her neighbour dessert shop which was closing (unfortunately we couldn’t have dessert after lunch). 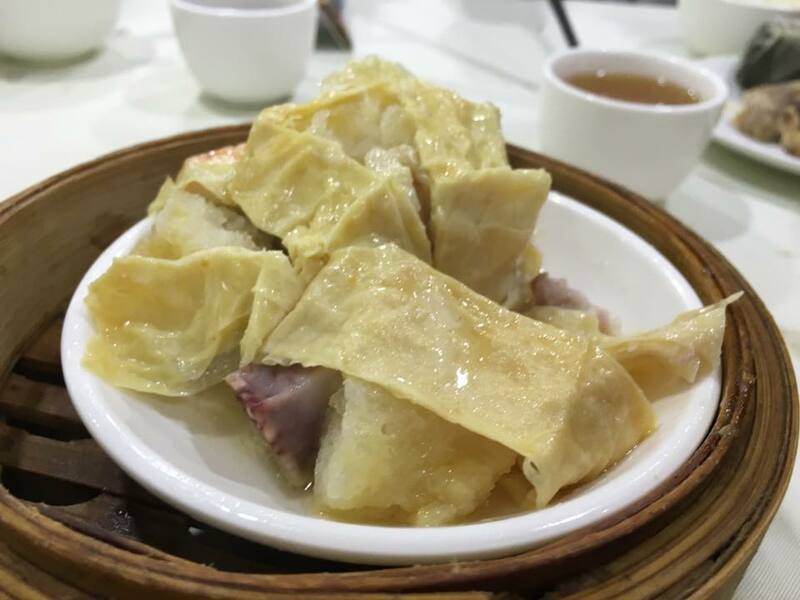 we had the salted fish minced pork咸鱼饼. 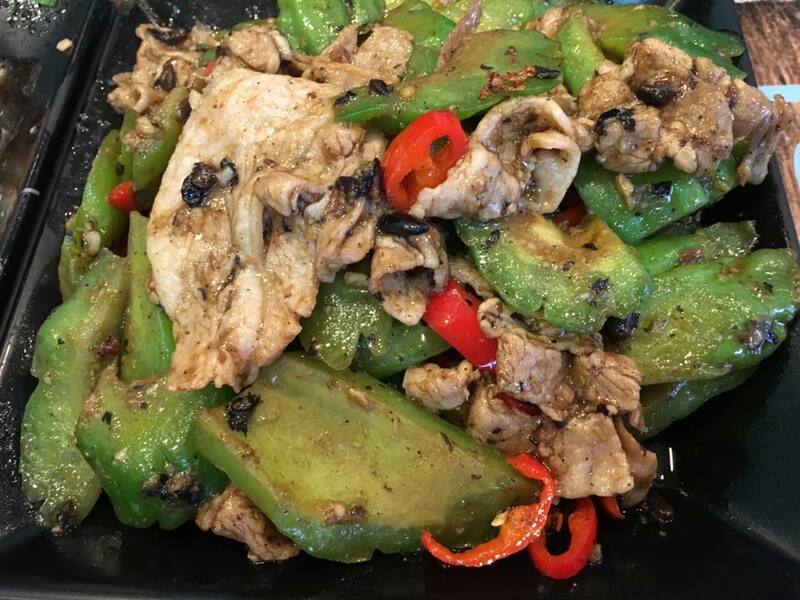 we ordered also the black beans bittergourd with kurobuta 黑猪肉. nice dish, and kurobuta was tender. 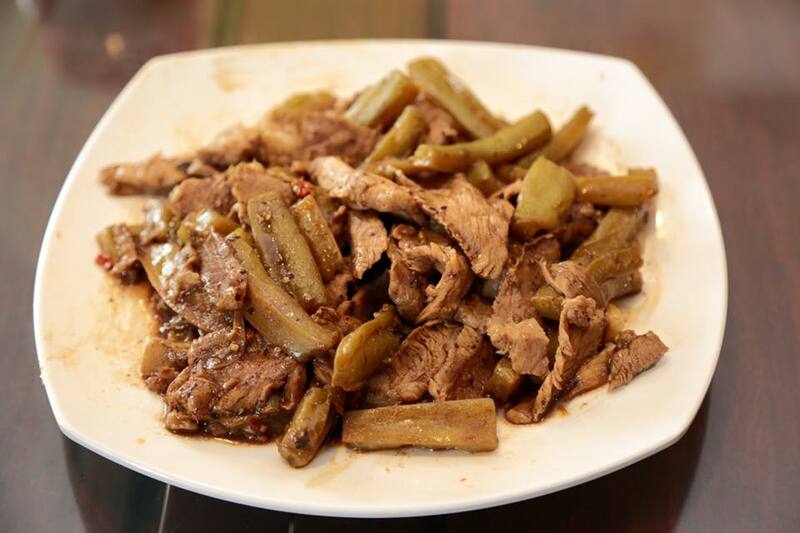 i am also going to do this on 20.1.2016, but w/o the black beans & just using sweet beans to stir-fry with a sous vide pork collar, basically a double-cooked pork 回锅肉. 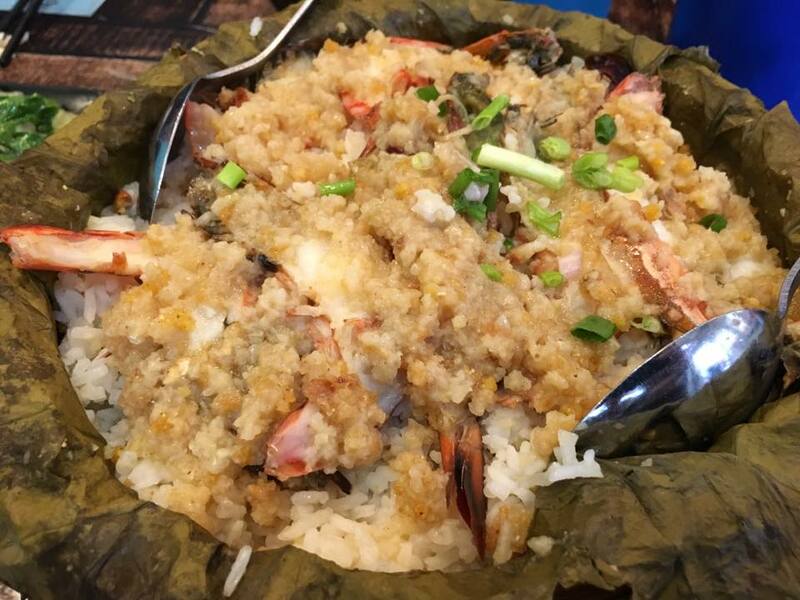 & we had a lotus leaf steamed rice with garlic prawns 荷叶鲜虾蒸饭. i was thinking not much taste right? 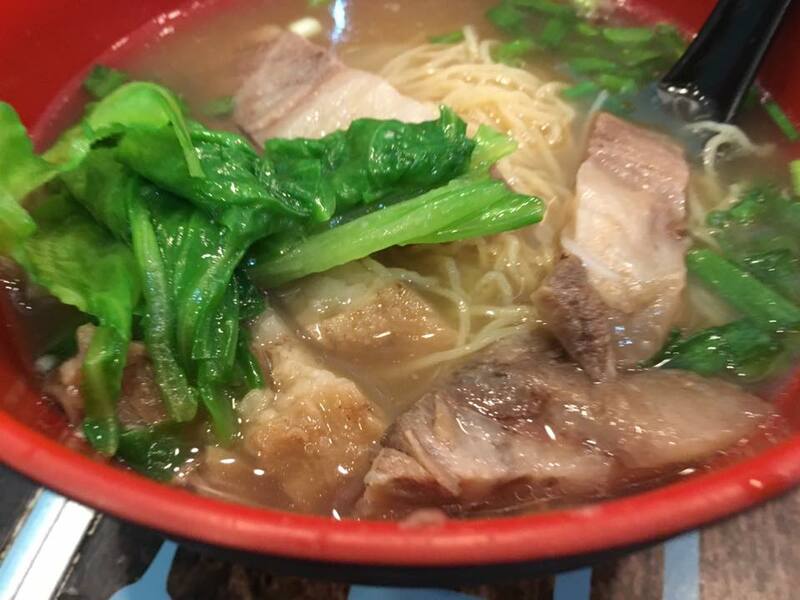 the meat was so very flavourful, and the soup very intense & tasty. we shared one at first just to try then we ordered 2 more bowls. 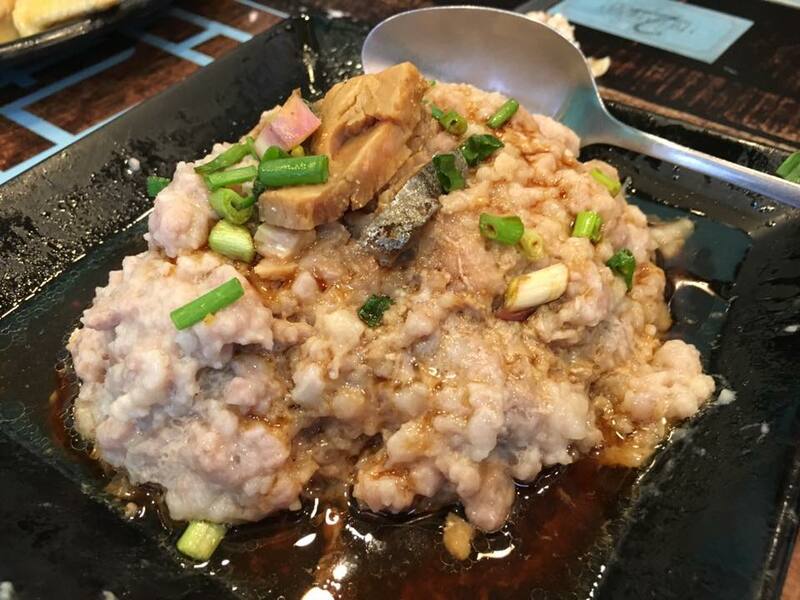 hong kong’s ngau lam 牛腩 is just so good that we all did not order the tendon & stomach, all 3 bowls were ngau lam meen 牛腩! i am quite happy to find this place. 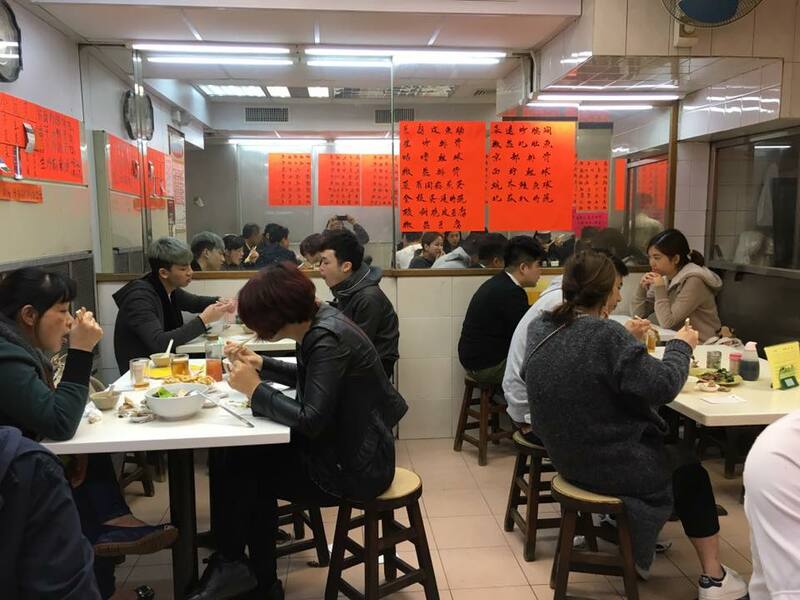 like my friend said, they depended a lot on take-out 外卖as no seating for customers. and the prices were not expensive but also not cheap, but quality was good so customers would return. after the initial hiccups & light showers on first evening & yesterday morning, the weather favoured us for the remaining time of the trip. cafe was quite full at 915am but we did not have to wait as the server got the guy to move to another table. he just finished up & go, cheerful & very nice about it. 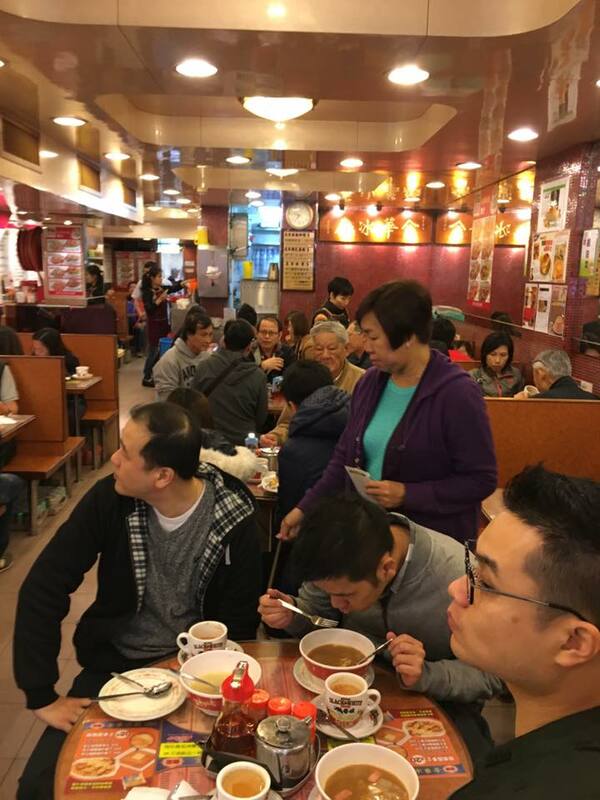 this was a much better example of sensible customer management c/w yat lok which made us (6pax) wait 15mins while seating the rest (2s & 3s) queued behind us…didn’t make sense. don’t know what the fuss about polo bun? 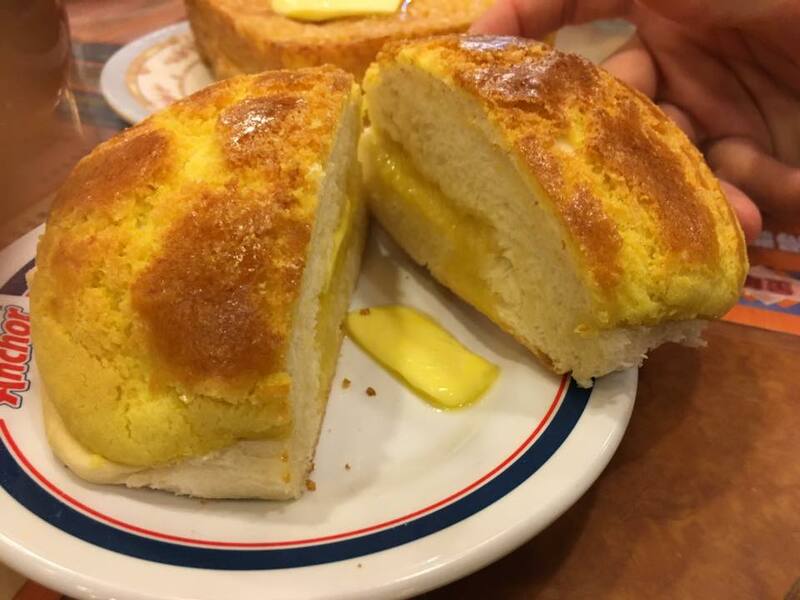 a buttered slightly sweetened bun with an added slice of butter? 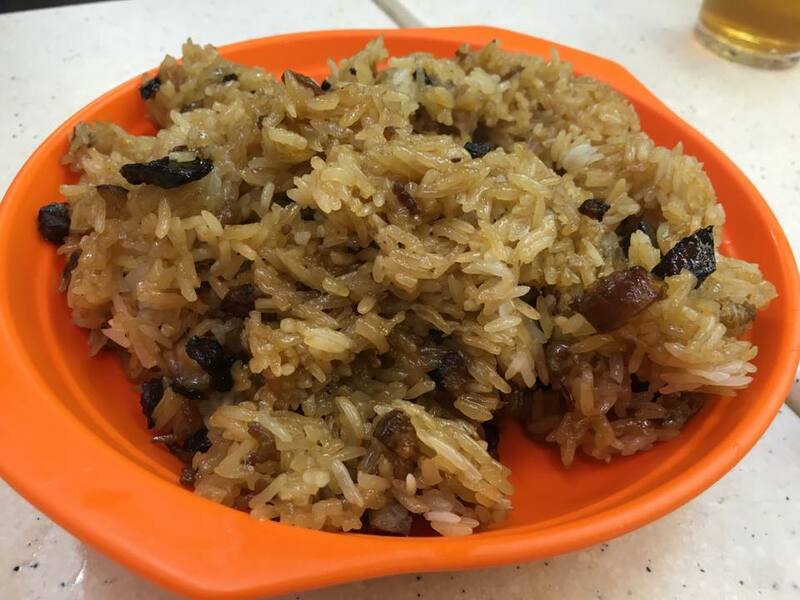 none too expensive at HK$10. 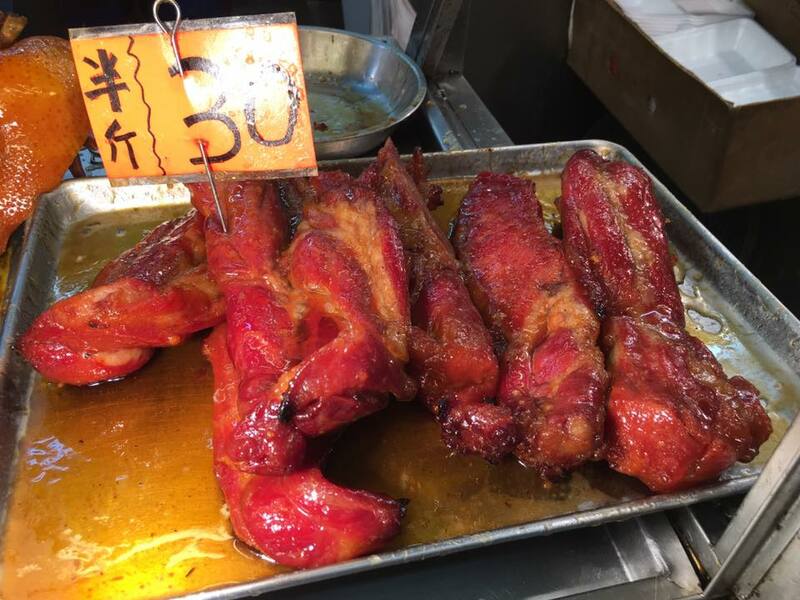 and for the char siew version (to me a waste of time…especially when hong kong makes such poor char siew!) 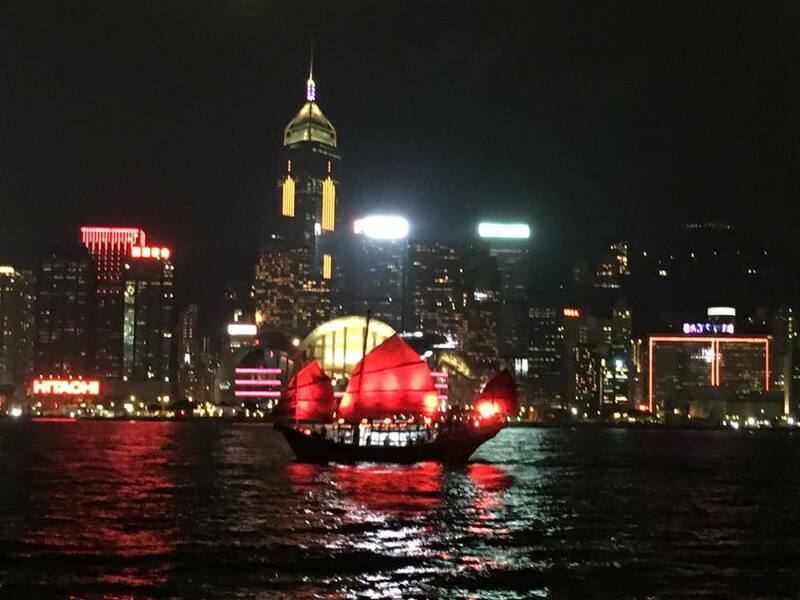 it;s HK$21. 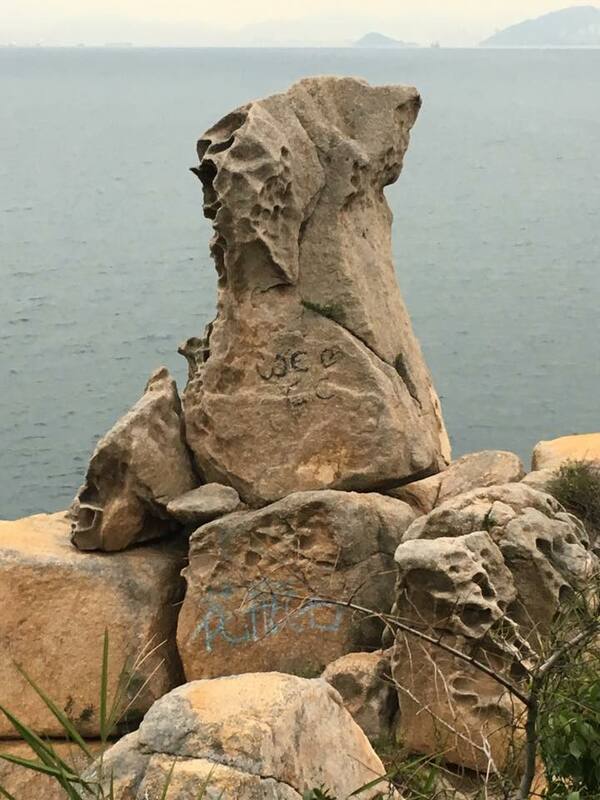 鸳鸯 ? could taste both coffee & tea yes! why is that special? i rather have coffee or tea (mostly coffee). 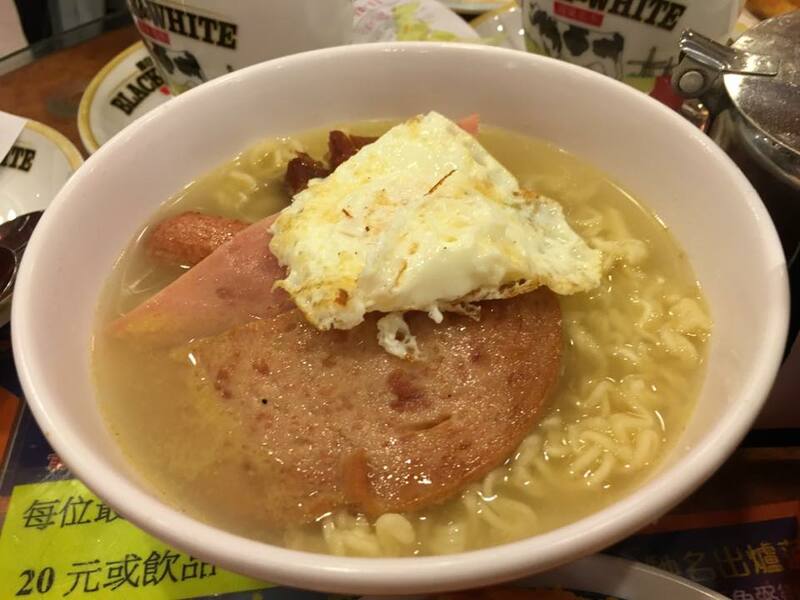 instant noodles with cheap ham & sausage…this one for sure i made lots better at home. 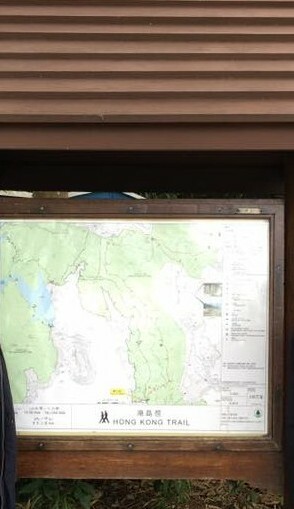 it was good though we had something to eat before some exercise climbing the 282m (only!) dragon’s back. 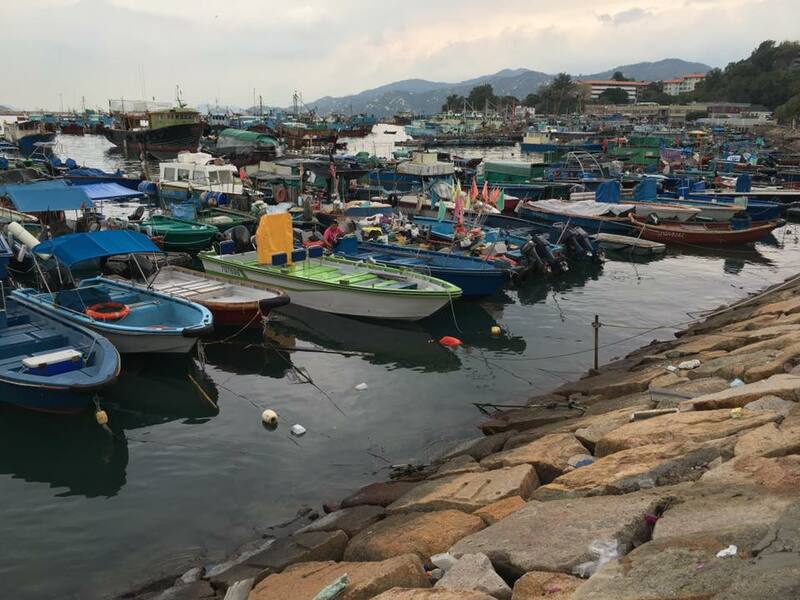 after a fun late afternoon hike at cheung chau, we returned to central pier about 750pm. 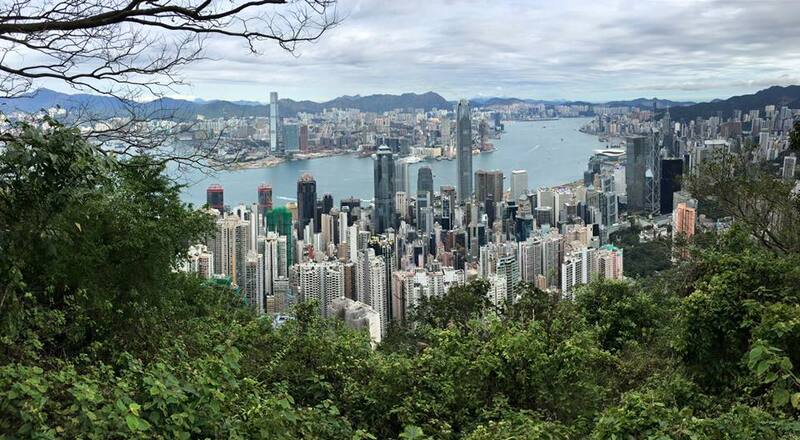 we could walk to central station & take the mtr to mongkok, or take star ferry cross harbour to tsimshatsui. we decided on the later. night scenery was beautiful. 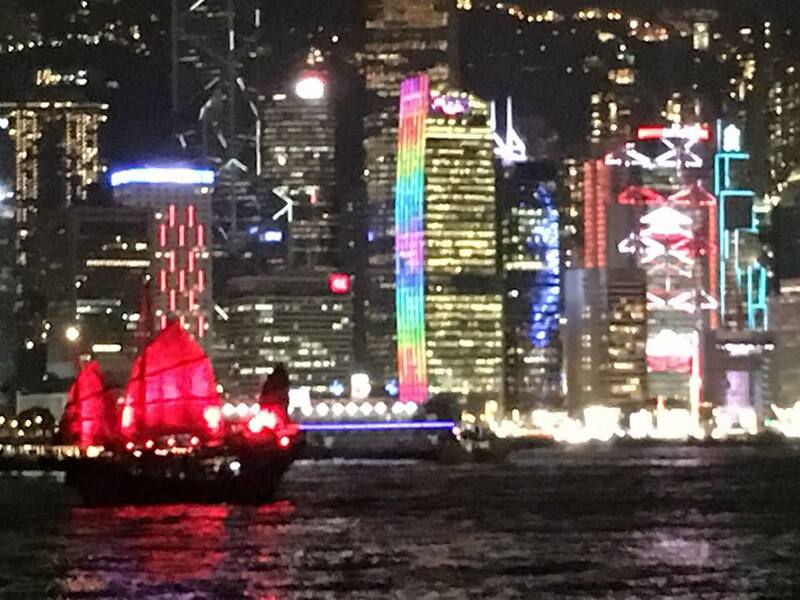 we could see the central skyline & lit buildings with the IFC (international financial centre) standing tall. on the other side there was a beautiful running advertisements of lights on ICC building at kowloon station in west kowloon. 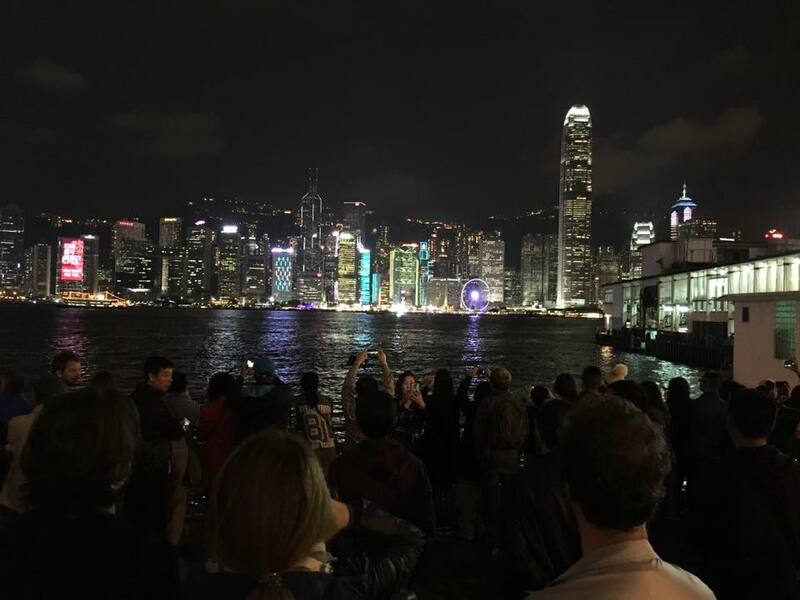 people were crowding the promenade along the public pier on tsimshatsui waiting for the light display. we watched about 10mins? when the music came on, but there was nothing to see, nothing much, a bit of laser but no display. 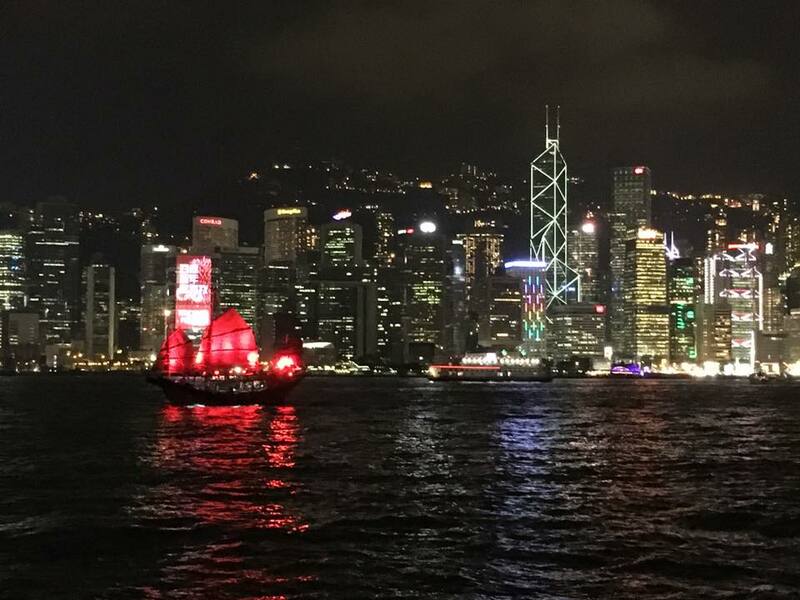 the red lit chinese junk, a regular item in hong kong’s tourist promotion. we walked over to avenue of the stars, but it was closed. time for dinner. 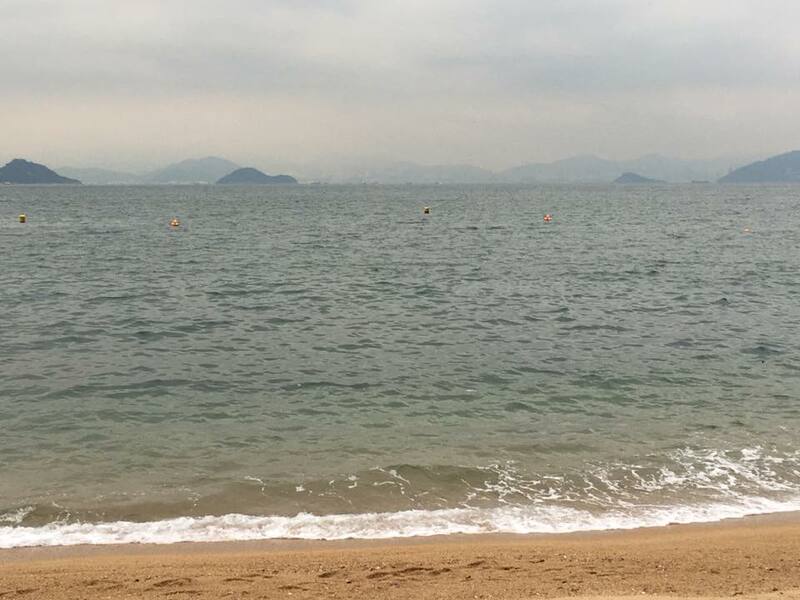 we decided to go to tao heung tsimshatsui. all our i-sim free 160Mb data were used up so i had to find a wifi place & managed to get in to isquare’s free wifi. but dinner was more hussle. 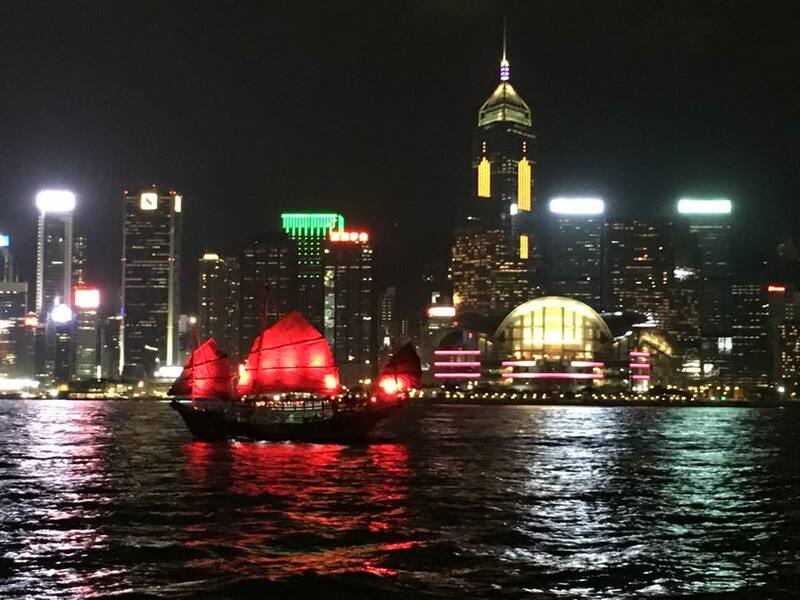 it was past 9pm before we settle down at tao heung tsimshatsui, recently moved from carnavon plaza to 3 Minden Row. it was not to be such a simple task though. 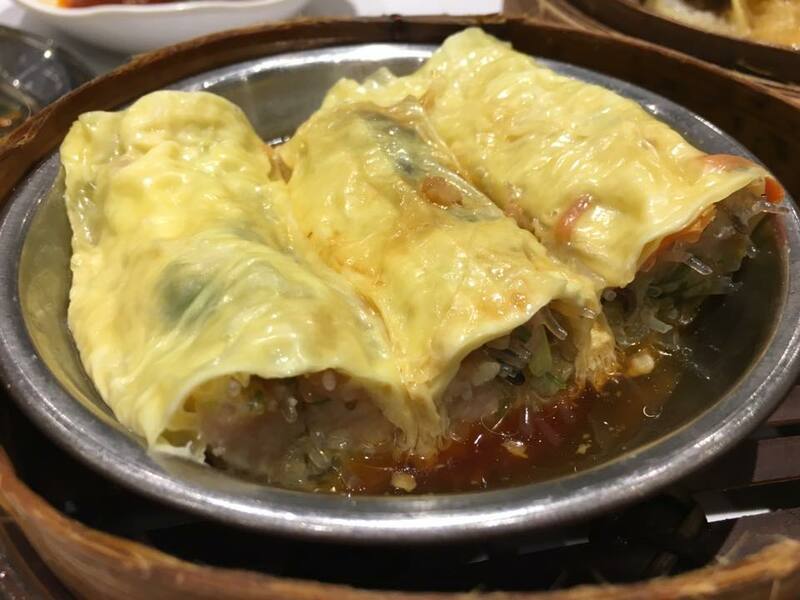 since we were already at tsimshatsui, we decided to go to tao heung at tsimshatsui rather than take mtr to mongkok. 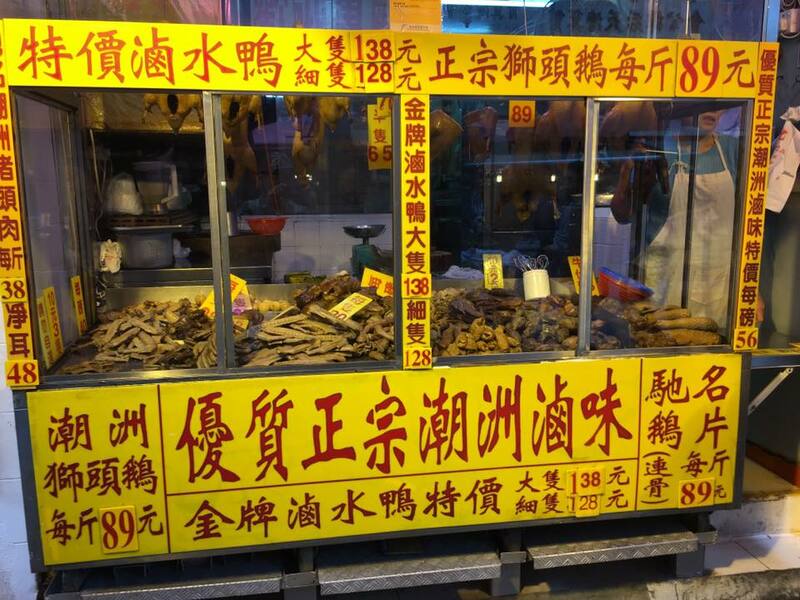 anyhow, the 1/2 roast goose & 1/2 roast BB suckling pig were priced very reasonably here so i ordered both. BB suckling was small & it was very good. 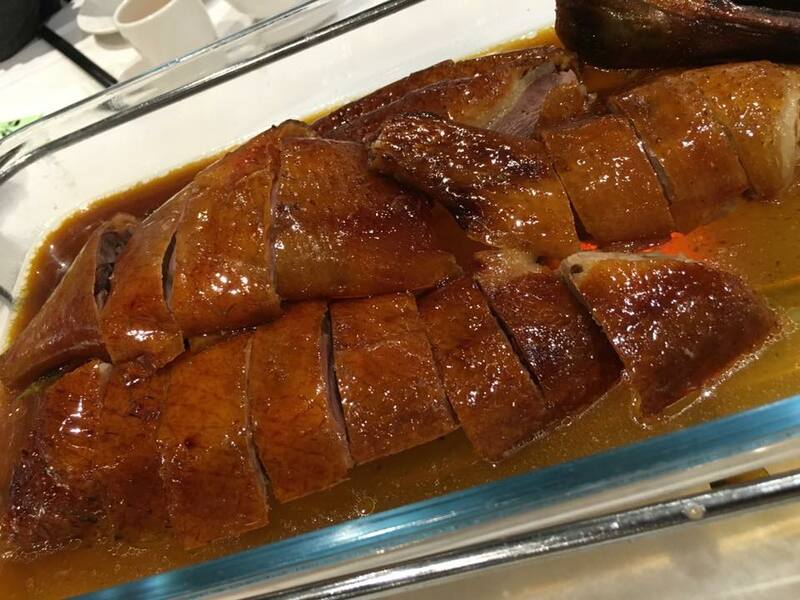 at HK$148, it was even cheaper than the already cheap roast goose. & really nice too. i loved it, as good as ah yat grandstand & hung kang restaurants in singapore. there were like 6 different 2-in-1 combo special. 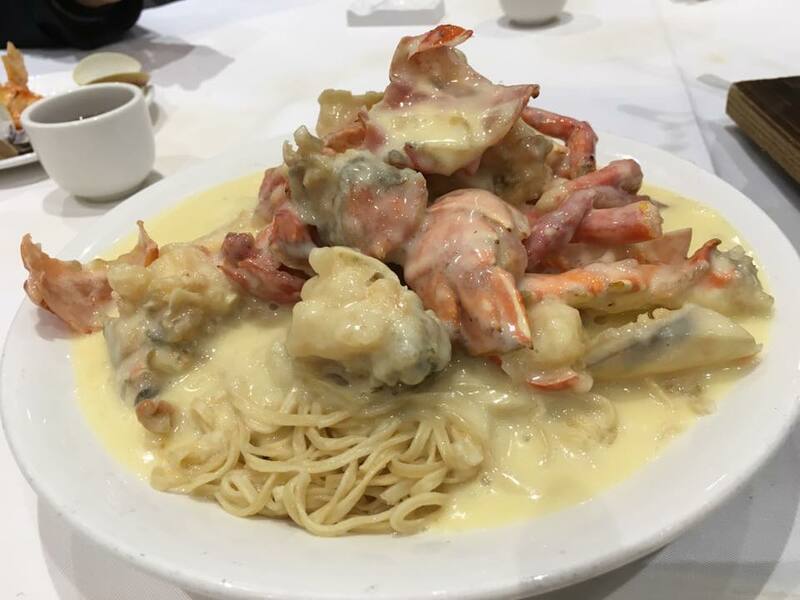 one was a dungenese crab combo. 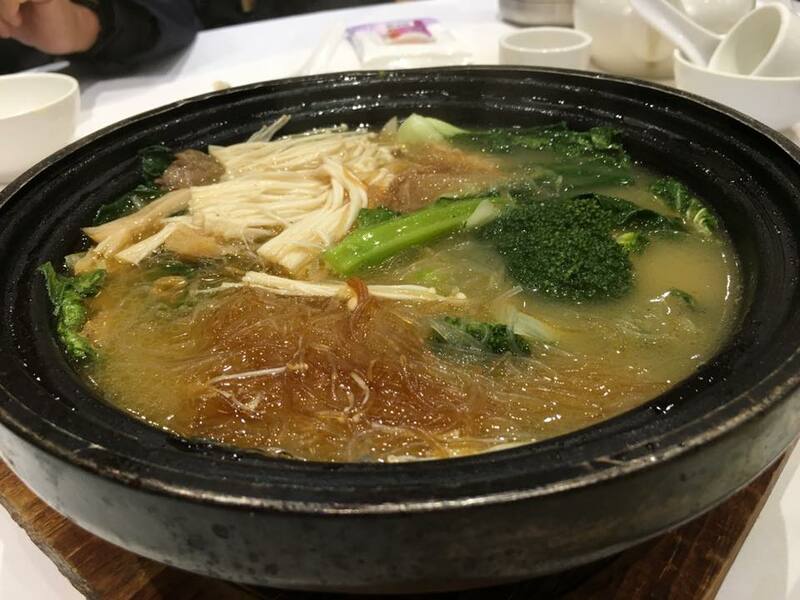 very intense & tasty, & the chicken & glutinous rice were very good too & i the soup was so intense & flavourful. fantastic! it’s a bit like the korean samgyaetang 参鸡汤 but no ginseng i think. tasted a whole lot better also. 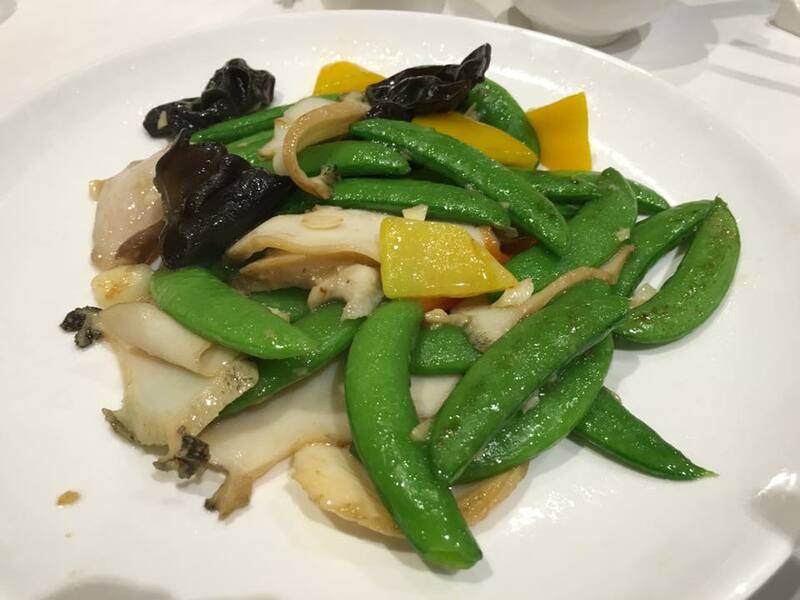 the HK$188 2-in-1 combo included a sliced abalone with sweet beans which was good too. a pretty good deal! 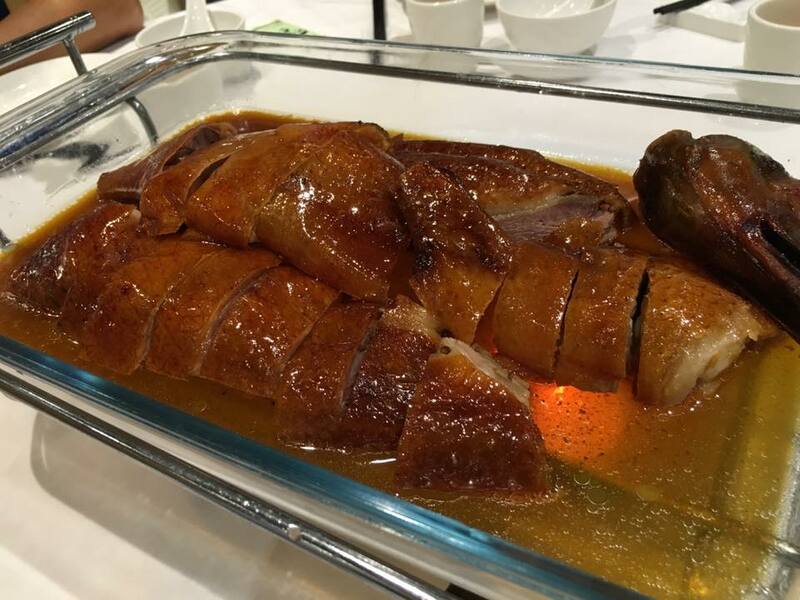 the 1/2 roast goose 烧鹅 HK$180 in this restaurant was just HK$180, cheaper than yat lok (HK$250) & cheaper than fu kee (HK$220)! the roast goose looked great & tasted pretty good too! 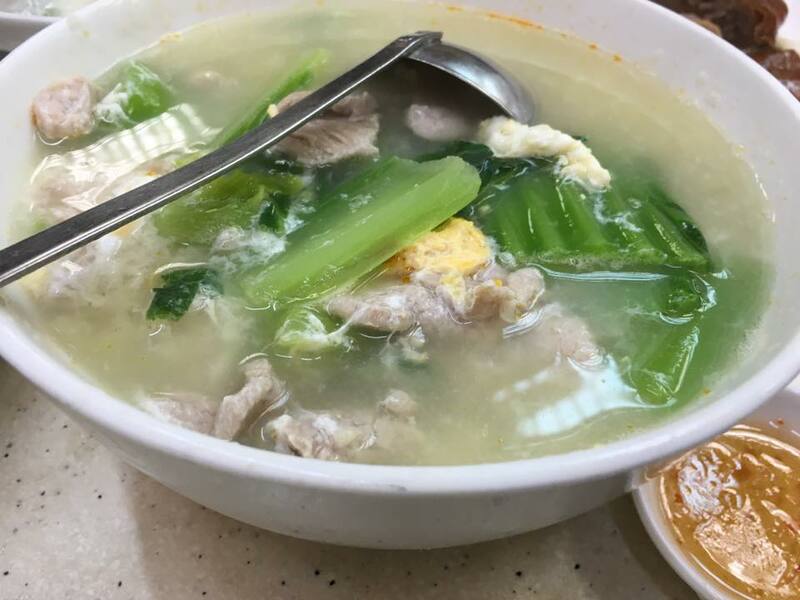 but it was really NOT as good as flavourful than both yat lok & fu kee. it was pretty good, a dish i would take in this restuarant. 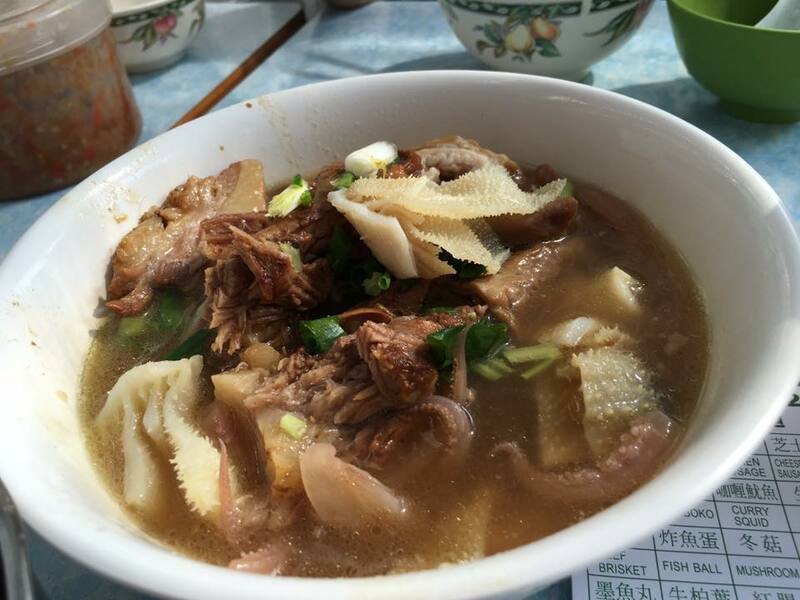 my friends loved the pork ribs mustard leaves soup 芥菜锅. 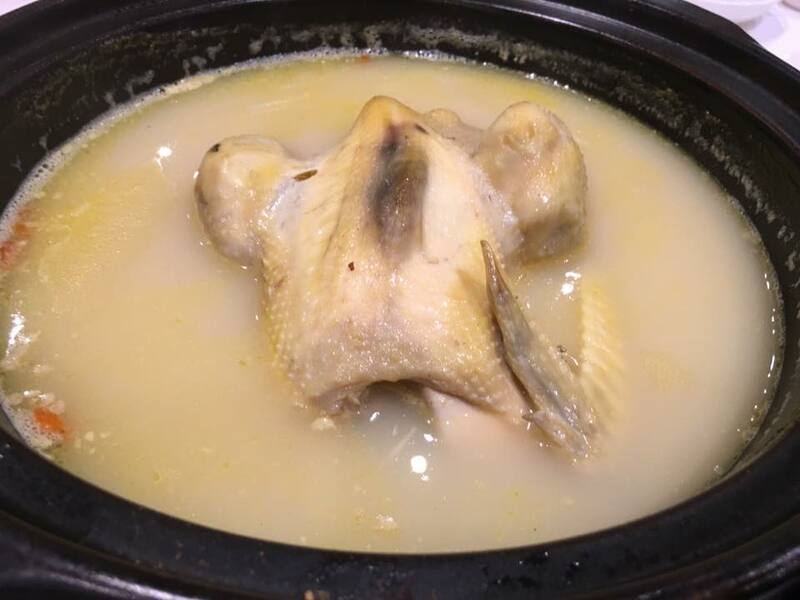 very tasty clear 清 soup. 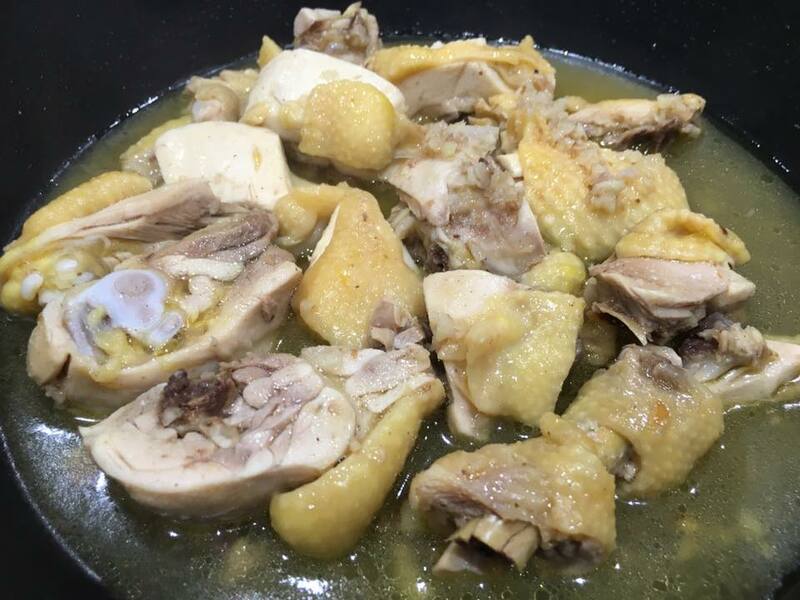 this a dish i intend to make, together with the samgyaetang 参鸡汤! 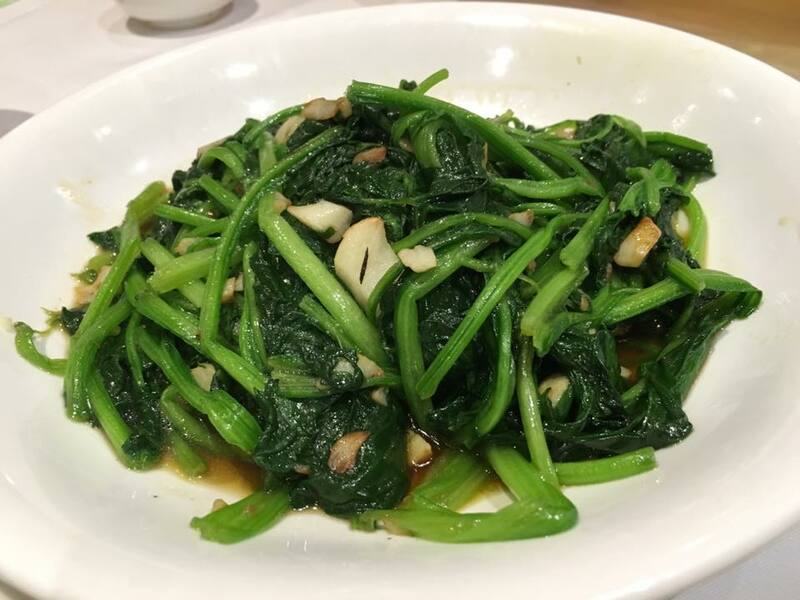 the greens was done well here, very nicely garlic fried with wok hae, unlike the “damp squid” tasteless vegetable at tai yun 泰源 last evening! 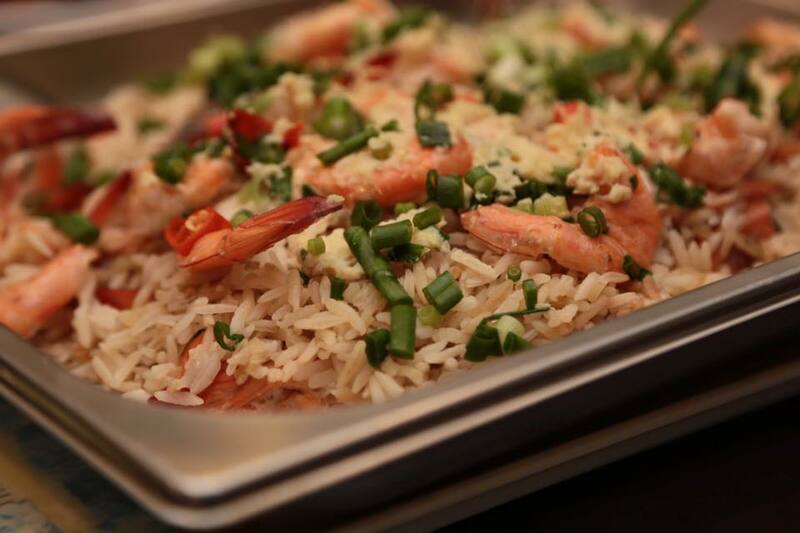 they placed the wrong dish on our table, a fried rice, maybe yangzhou fried rice. it looked good & we decided to order it as well. nice! & the lads decided we should round off dinner with 2bottles of blue girl “lam mui” beer. i took a small sip. it was pretty flavourful, not bad la..
dinner was HK$931 all in for 6pax = S$29pax, not toforget we had roast goose & roast suckling pig, a very good dinner at a super good price! & the service in this new restaurant with great ambience was good too! the last few times i came in the morning or noon time. there’s some attractions coming in the late afternoon, the stalls along the pier side street just open up for business. weather was perfect. last evening medium drizzle & this morning’s wet start were past. it was cool 16degC maybe. many small crafts anchored here. some for fishing i guess. 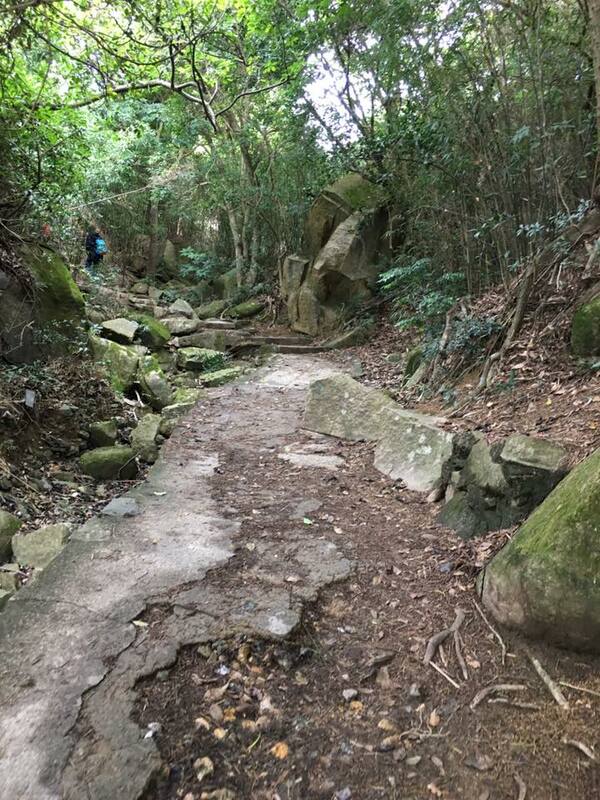 we walked to the pak tai temple 北帝庙. didn’t go in just took some group pictures. 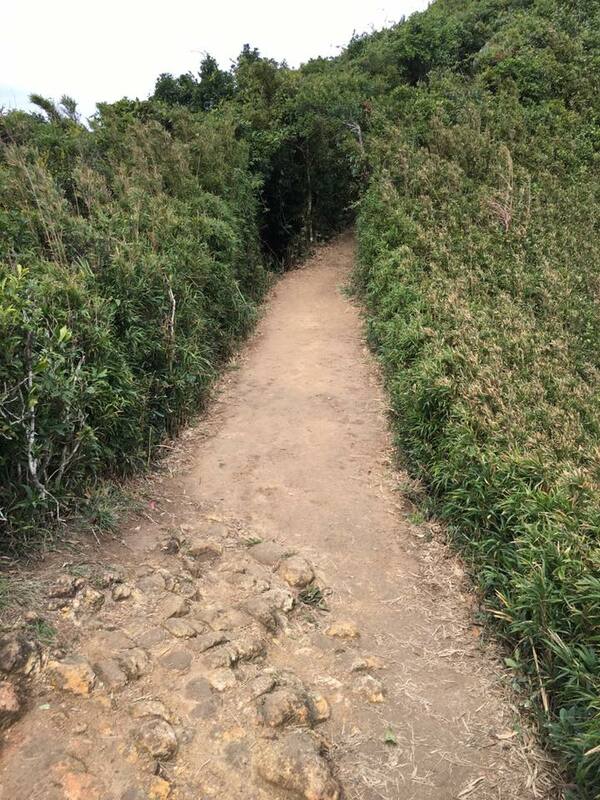 this was near the narrowest part of the island. 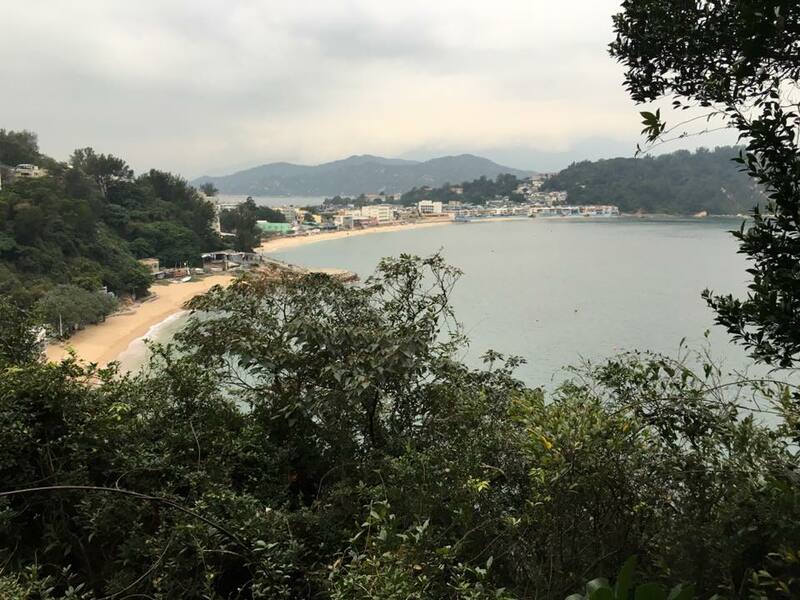 we walked across to the other side, nice tung wan (东湾) beach. great for water sports. 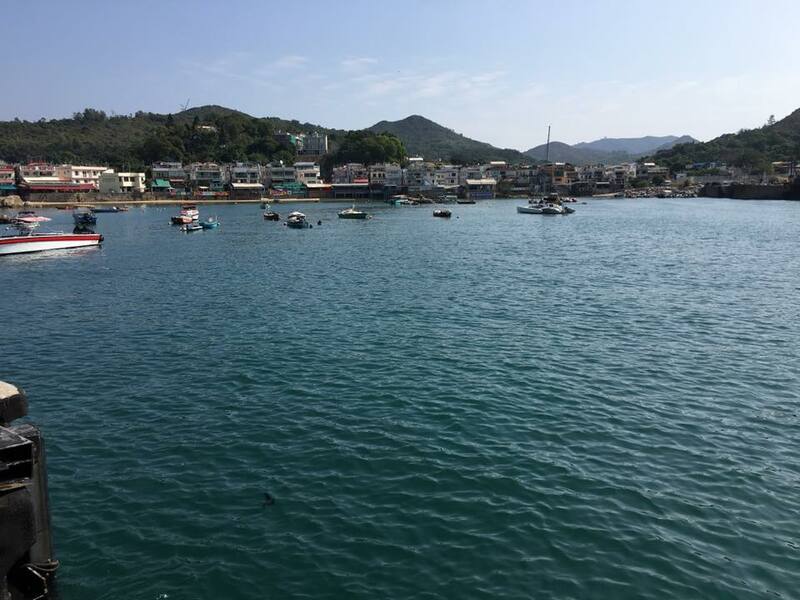 there is a surfing centre & canoe/kayaking further at kwun yam wan(观音湾) beach. just past wawrick hotel, there’s the historic relics stone carvings from bronze age. 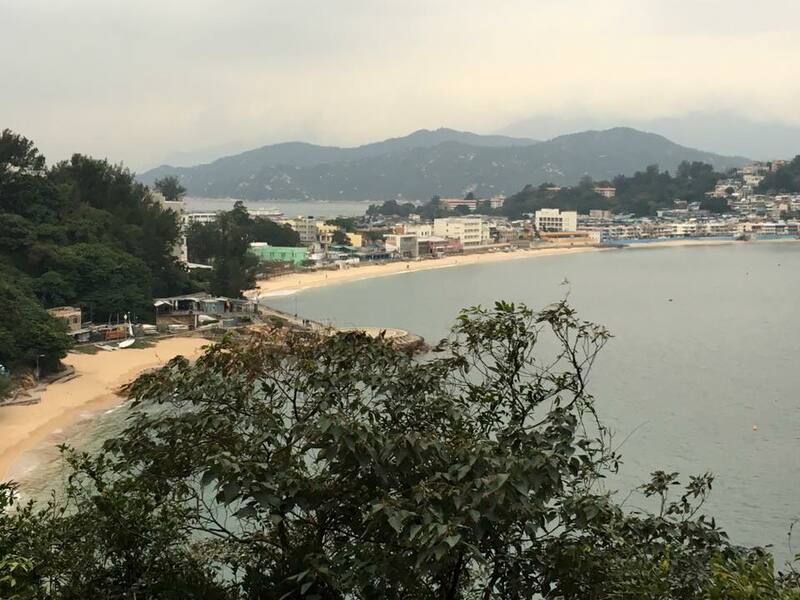 i took a photo of the horizon from kwun yam wan(观音湾) beach. & cropped it to get the horizon photo at the top of the page. 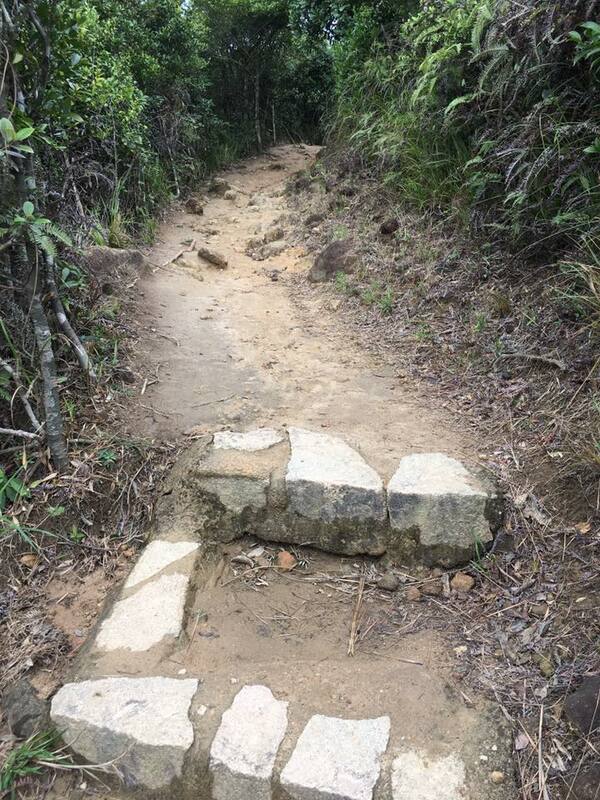 we turned up the path after kwun yam wan(观音湾) beach. 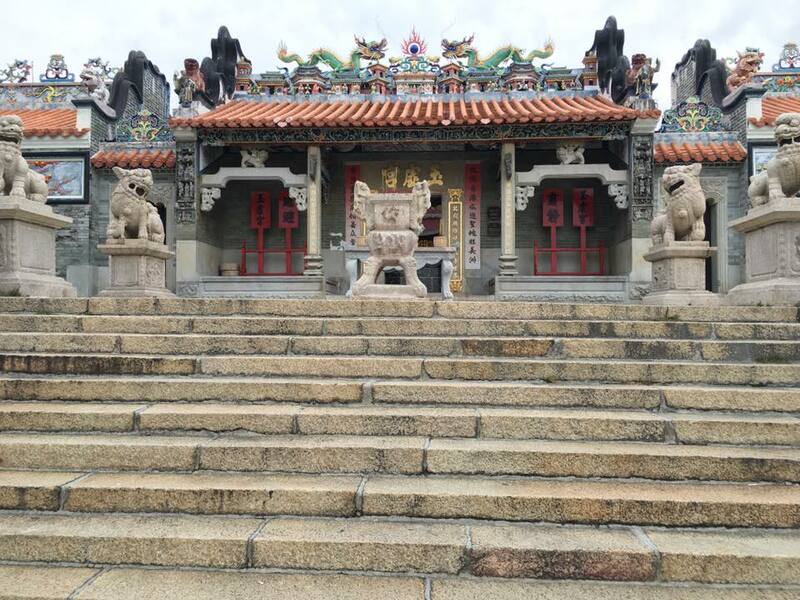 the kwun yam temple (观音古庙) was closed. 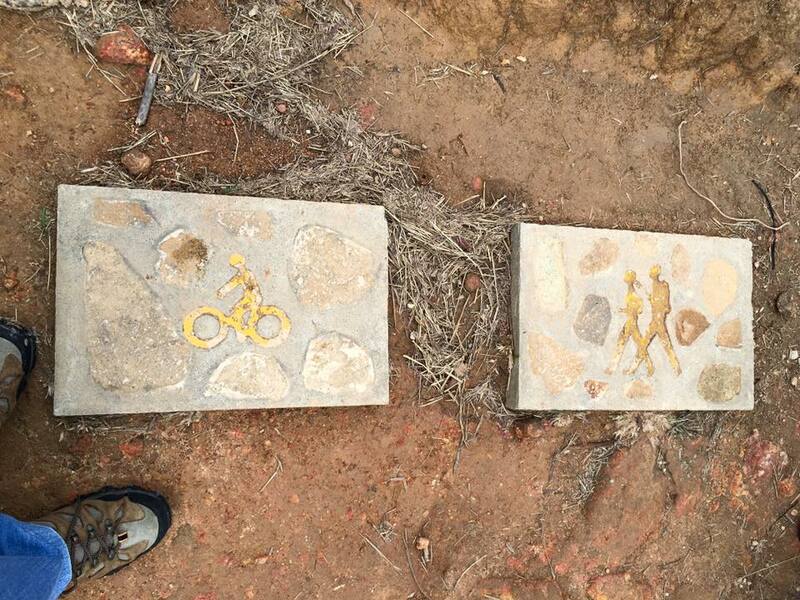 we walked on to the mini greatwall. 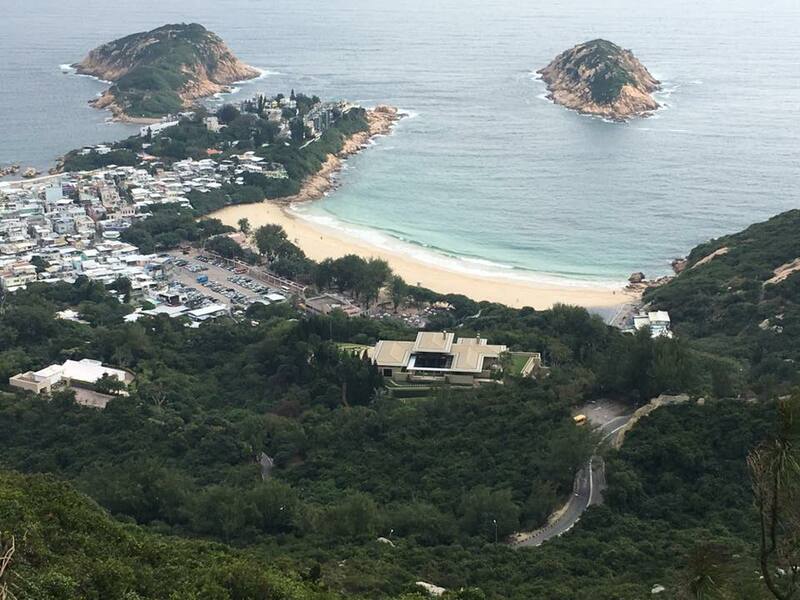 looking back was a nice aerial view of kwun yam wan(观音湾) beach & tung wan (东湾) beach. 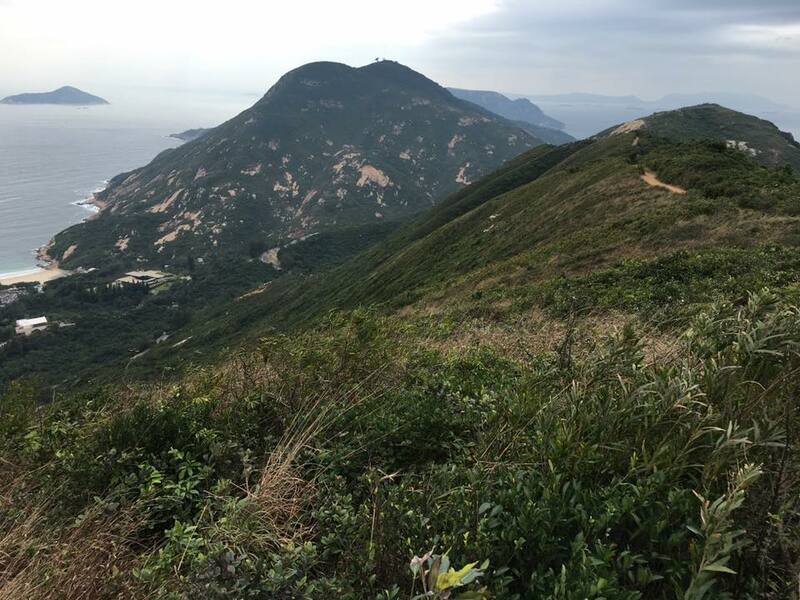 after we past the vista lookout, moving on we came to the 花瓶石 & 叮当石. 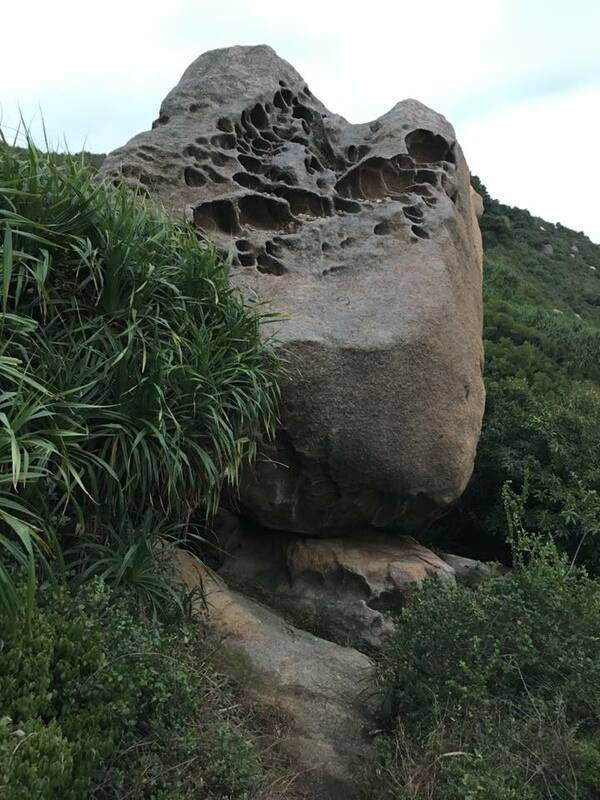 花瓶石 is the bigger rock. we took some photos including group shots. 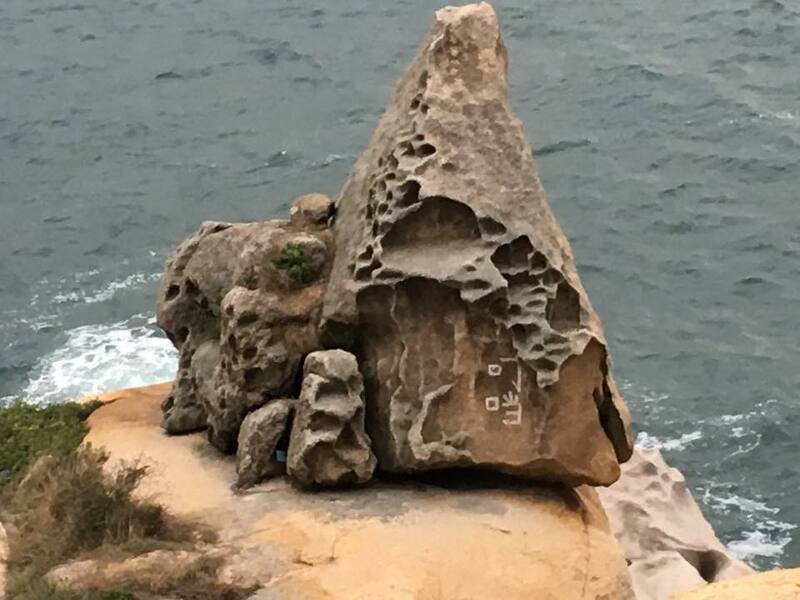 叮当石 is the smaller rock at the end. 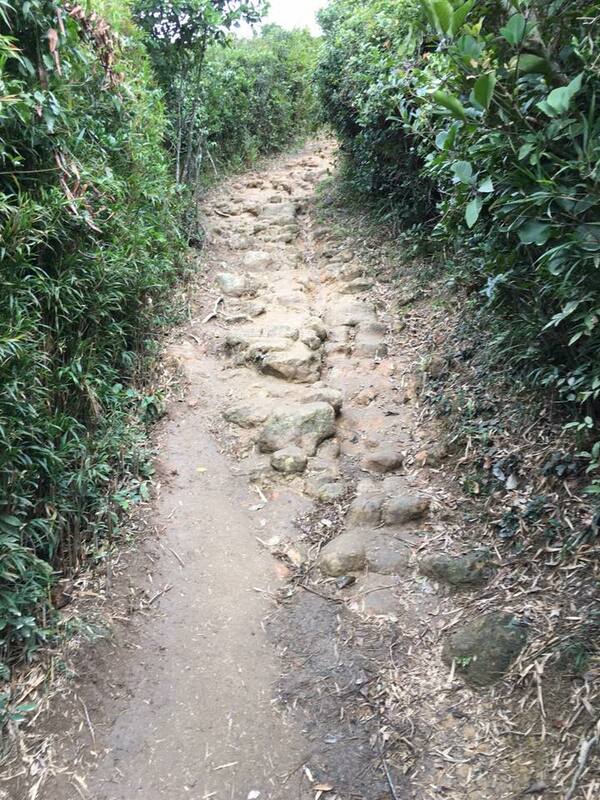 further we came to the 玉玺石. 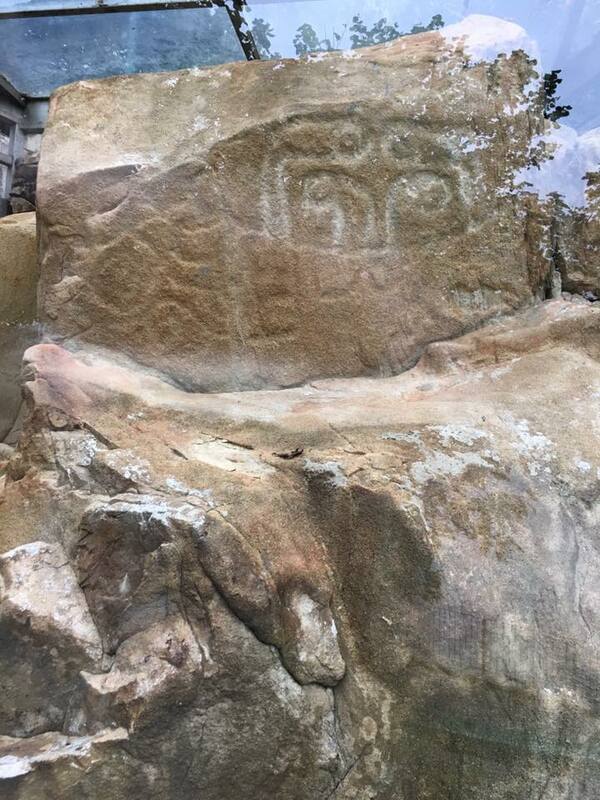 the chequered cut patterned rock is the tortoise rock. we walked back. it stared getting dark by 530pm. this photo about 615pm. 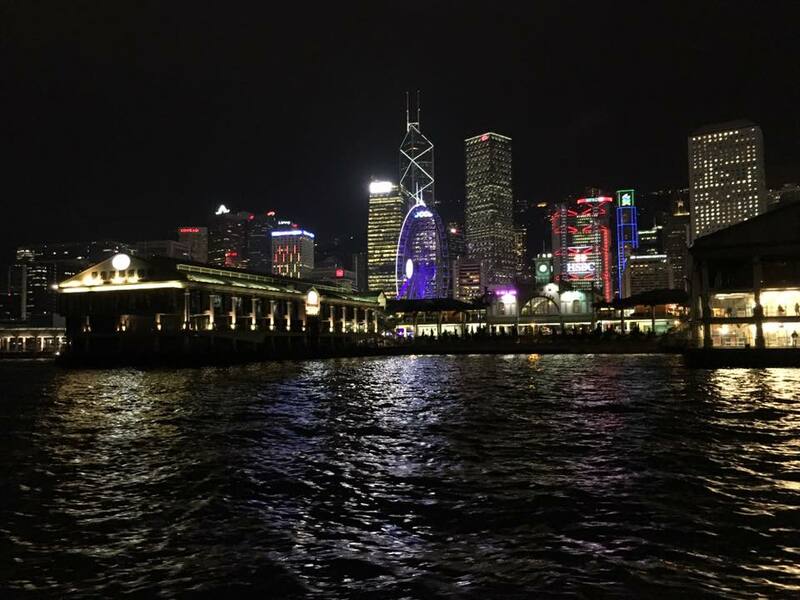 we returned to the jetty & took the 7.15pm ferry back to central pier, then took the cross harbour star ferry across to tsimshatsui star ferry pier 天星码头. 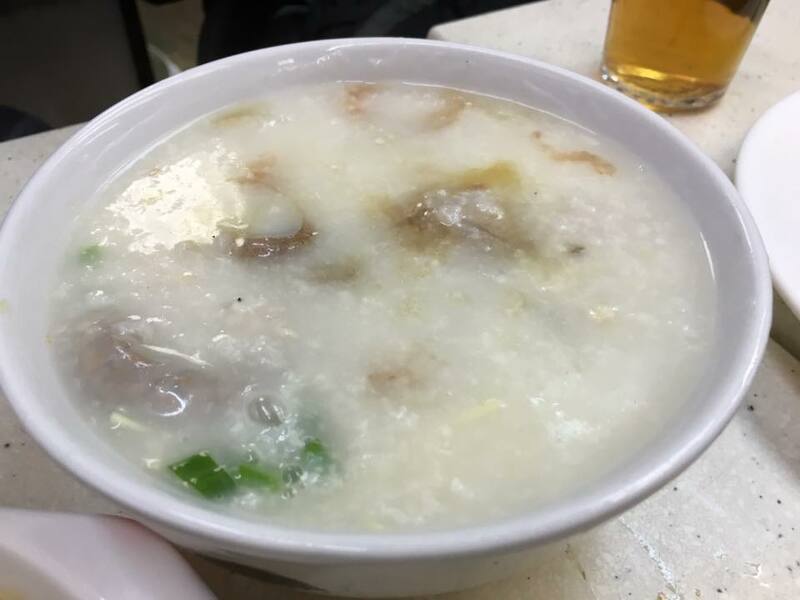 after a most satisfying breakfast at tao heung mongkok 稻香旺角, fair weather returned so we made our way to central station & took 2 taxis (we had 6pax) to the peak 山顶. of course it’s cheaper by bus, but taxi up is still the most convenient, & we had the option of tram down which we did. 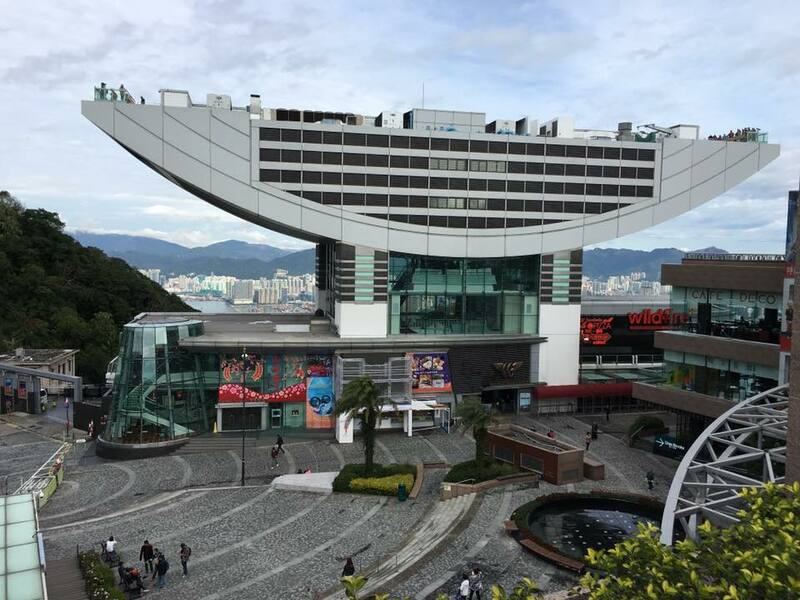 taxi took us to peak galleria 山顶广场. we got to the rooftop. sky little overcast. weather was perfect like 17degC. 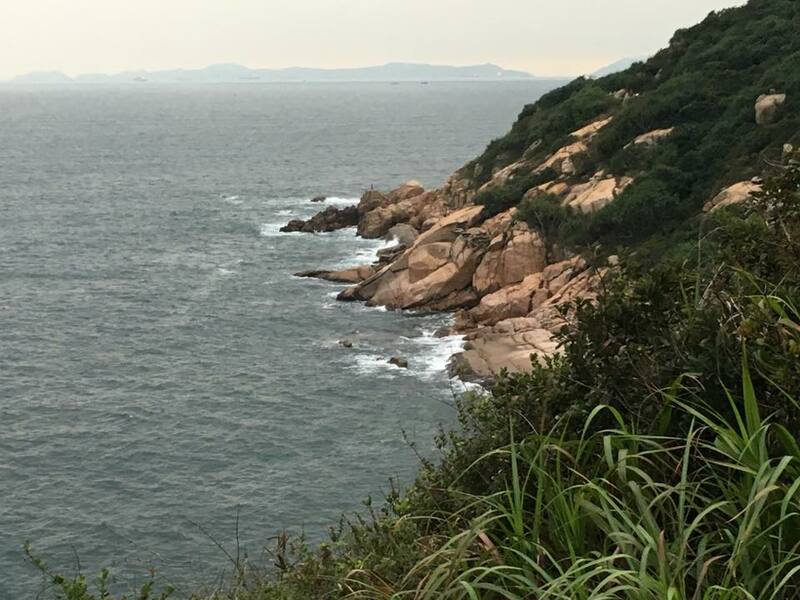 this direction seems to be looking out to aberdeen & deep water bay. 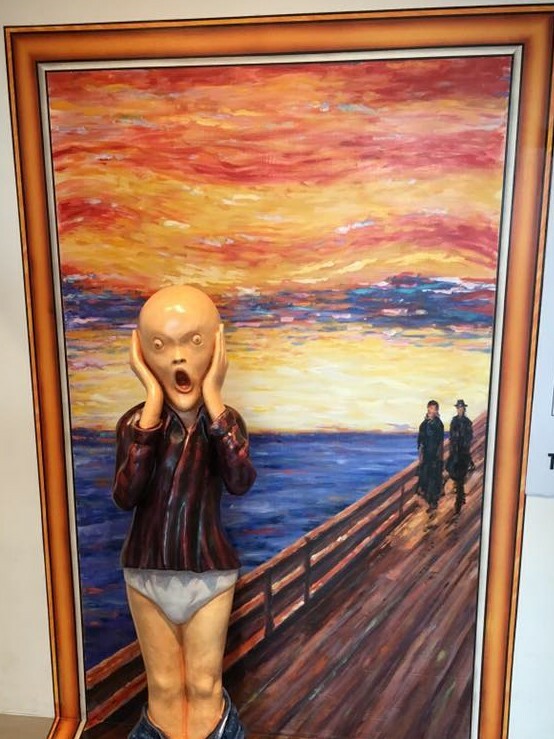 & a replica of edvard munch the scream at the entrance to the museum. 1 level down there was tai cheong 泰昌饼家, a brand of tao heung group. 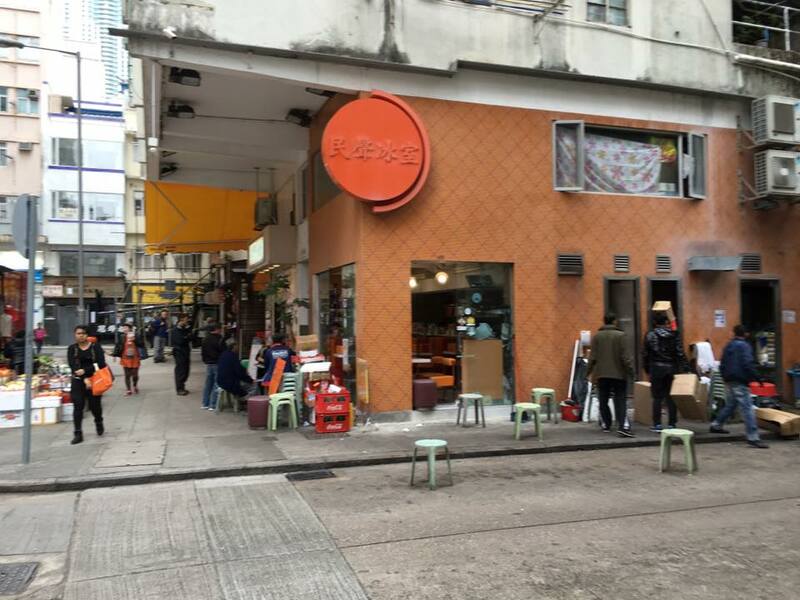 this the one where the stall at lyndhurst terrace the last british governor chris patten claimed had the best egg tarts in hong kong. trust the guy to know what is a good egg tart? we tried the egg tart. 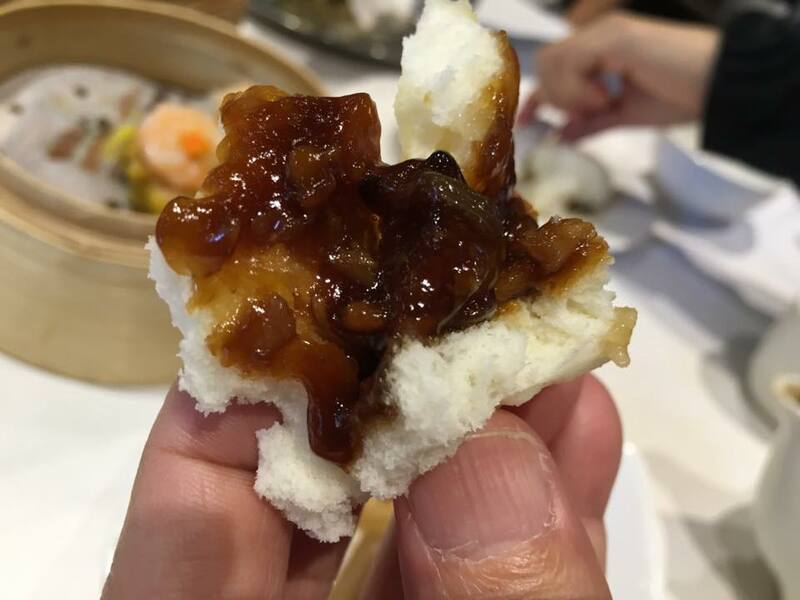 i have done this more than once at tai cheong 泰昌饼家 including the one at lyndhurst terrace but it was still so-so for me, a little too sweet & nothing c/w the burnt portugese egg tart. i did not take so many scenery shots like my last walk here on 4.4.2015. & though we had quite many people shots, i do not post these on my public post. the anchorage & the bridge linking to tsing yi island. 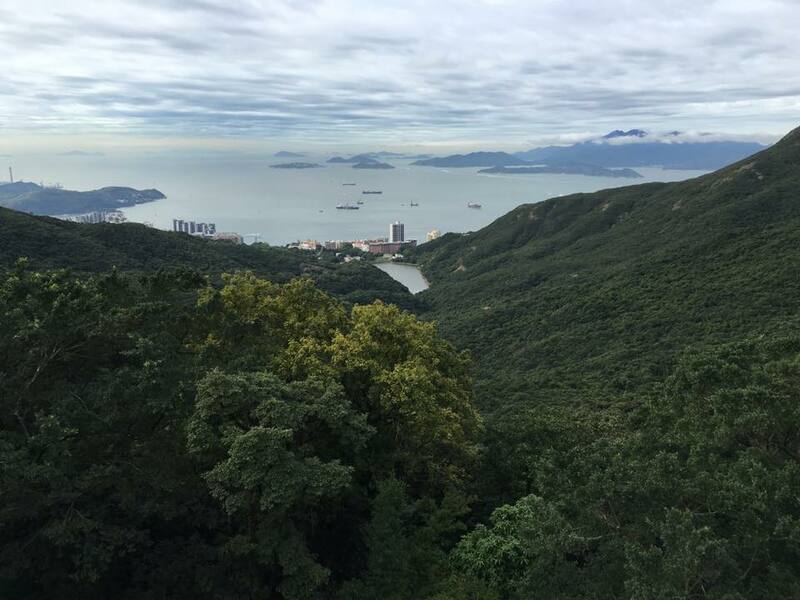 & further the bridges from tsing yi to mawan island & from mawan island to lantau island. we finished 2-ish. there was no queue for the tram down. 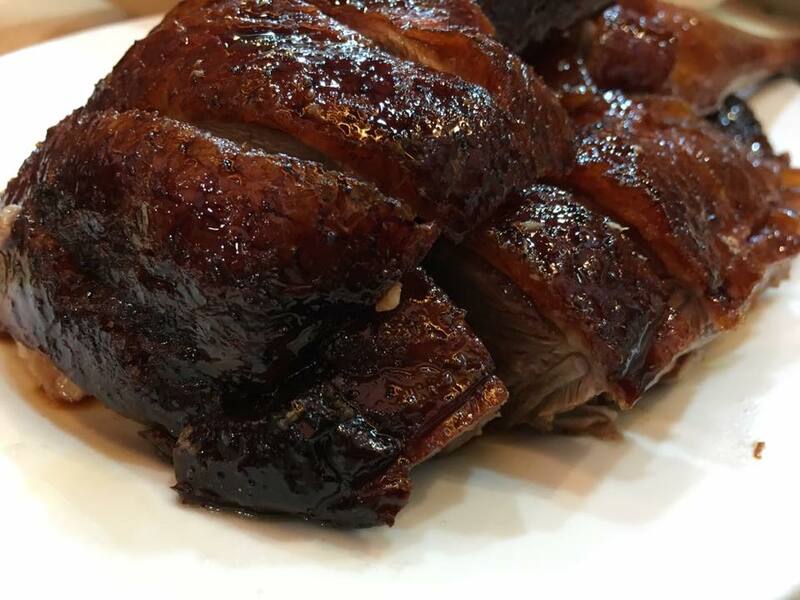 so we took the tram & walked to yat lok 一乐stanley street to have our roast goose 烧鹅 fix! 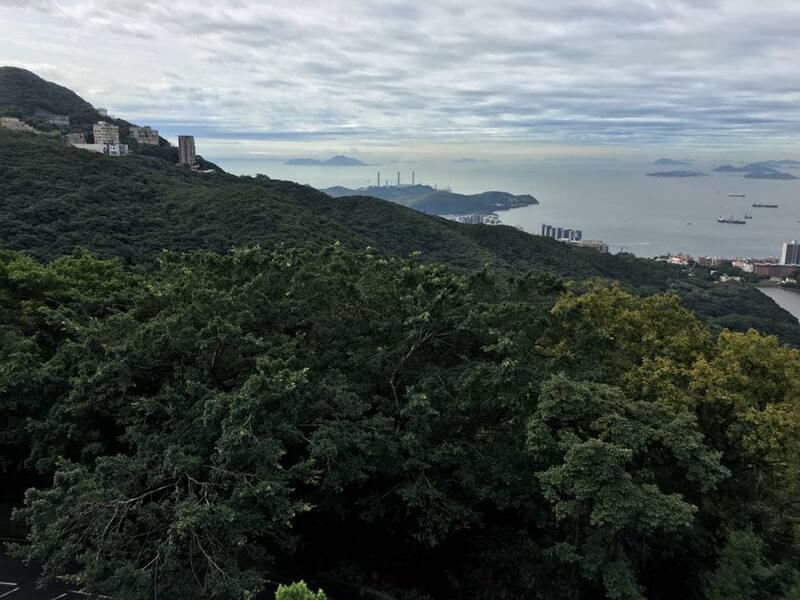 after peak circle walk, we took the peak tram funicular to gardens road & walk to yat lok 一乐stanley street on 11.1.2016.
the place was crowded, packed at 3pm. we had to wait like 15mins. partly because of the very bad queueing system. we were a party of 6. the servers kept giving tables to parties of 2 & 3 behind us, and we had to wait till a table with 6 vacated. 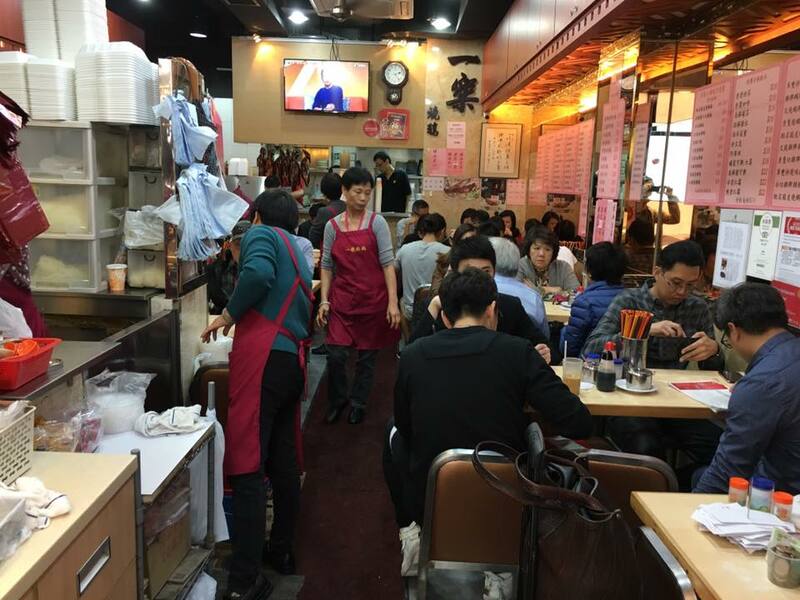 this was unlike at kam wah cafe the next morning where the server ushered us in & got others on a table that could seat 6 to move to other tables to free up 6 seats for us! 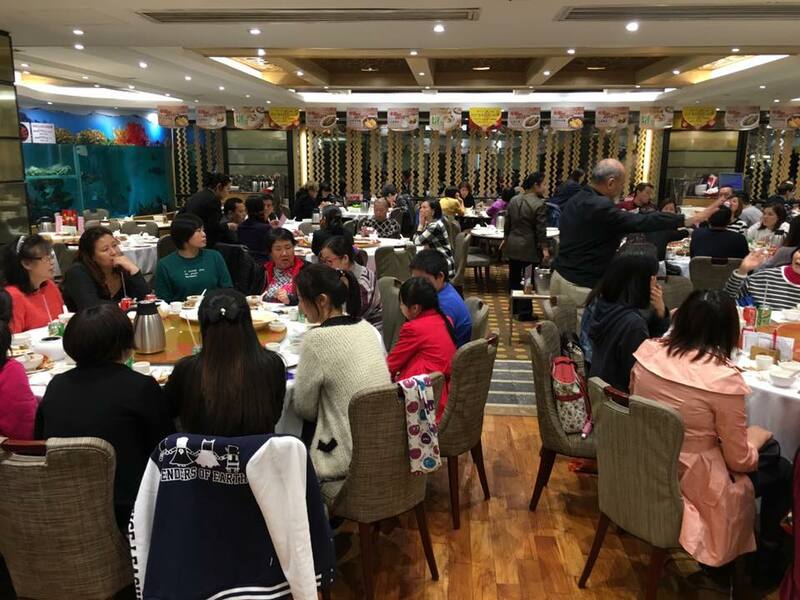 we were seated at a tiny table very crammed for 6, and the floor was wet at the ends so a few of us myself included had to seat with my feet tiptoed, extremely uncomfortable. 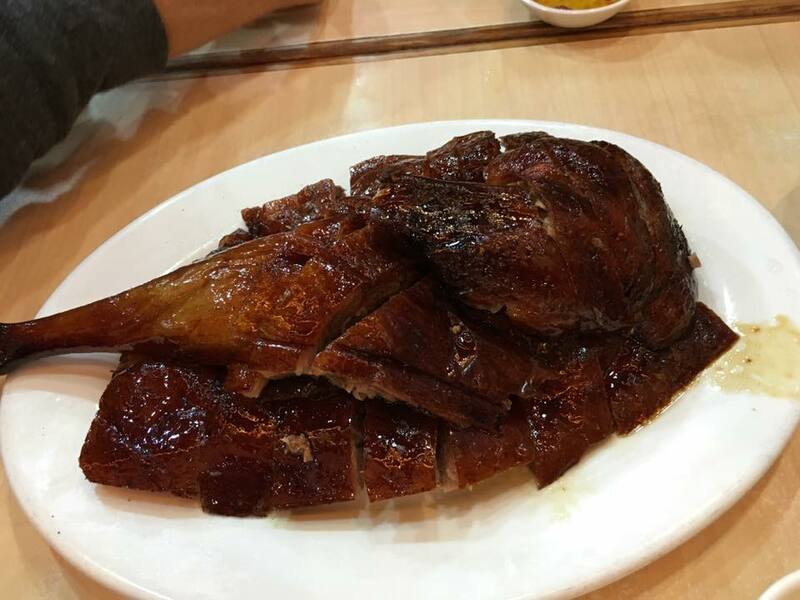 yat lok 一乐 has been my favourite roast goose 烧鹅 the last few times i was here. 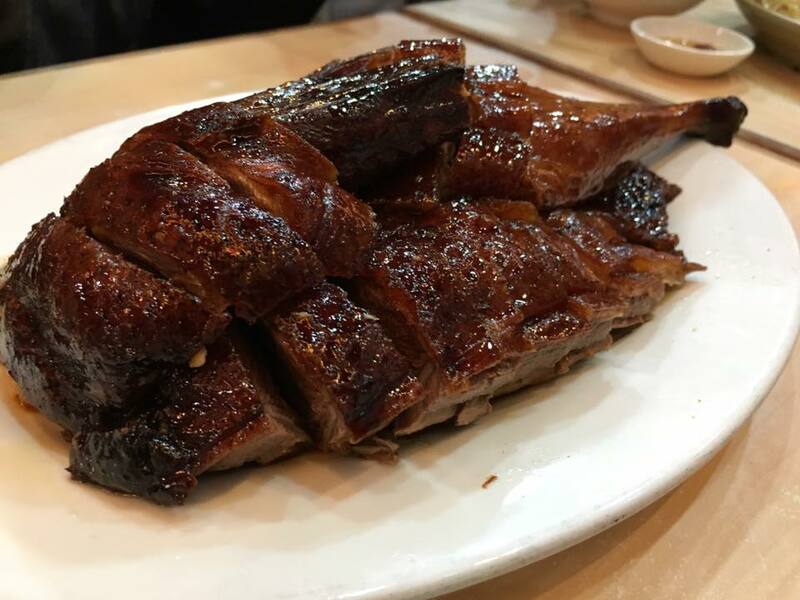 the roast goose is consistently crispy skin & flavourful. the waiting, crammed table, wet floor & the overall poor experience aside, the roast goose was still very good. 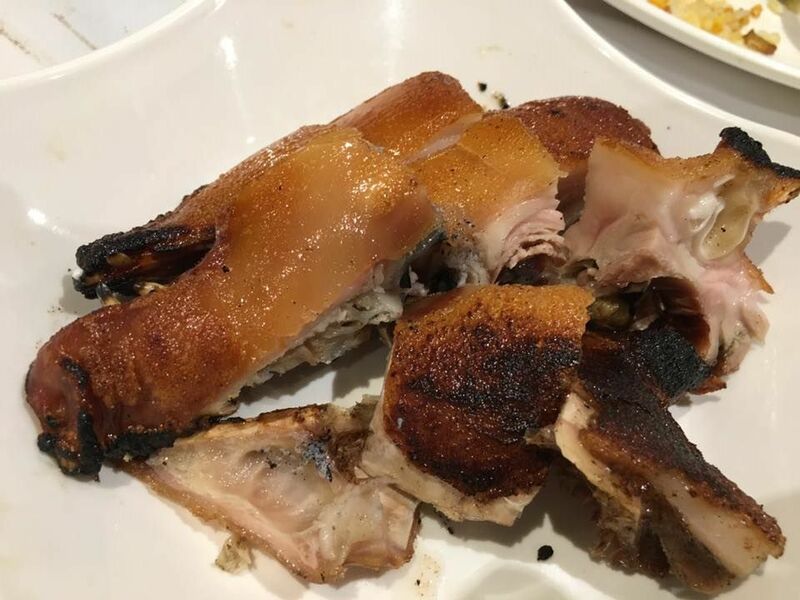 in fact most of my friends still voted yat lok 一乐 the best roast goose (we had roast goose twice at fu kee congee 富记粥品, once at tao heung tsimshatsui, and once at yat lok). 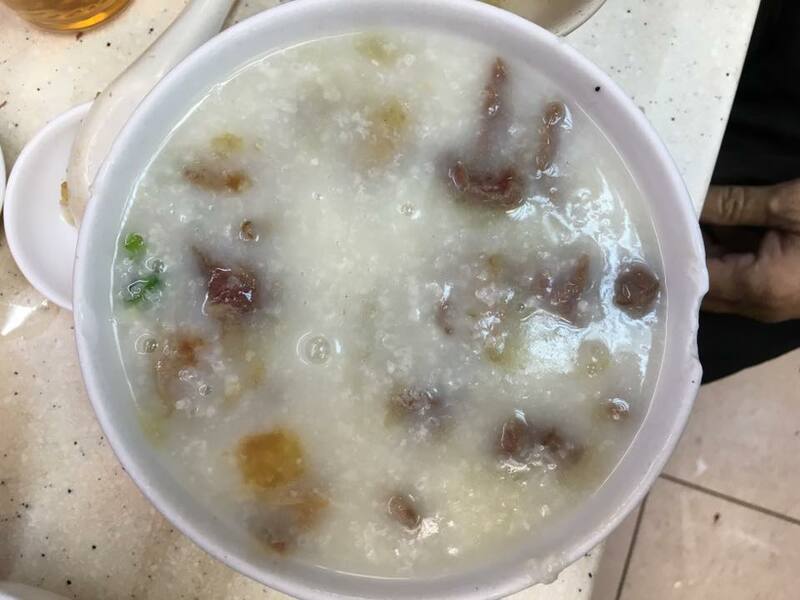 for me, my first try at i felt it was as good as yat lok, after the second try, i decided for myself that i now prefer the more flavourful roast goose at fu kee congee 富记粥品 to yat lok. 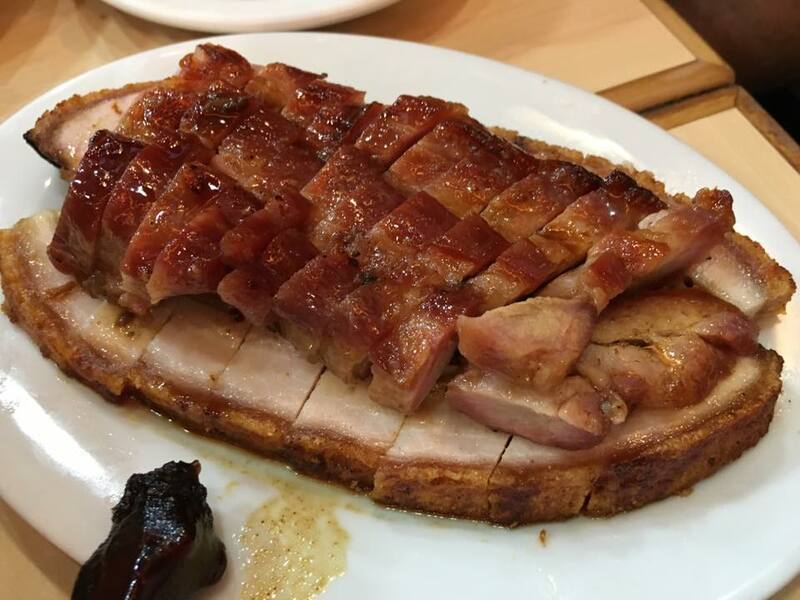 the HK$145 char siew + siew yoke was a complete waste of time. 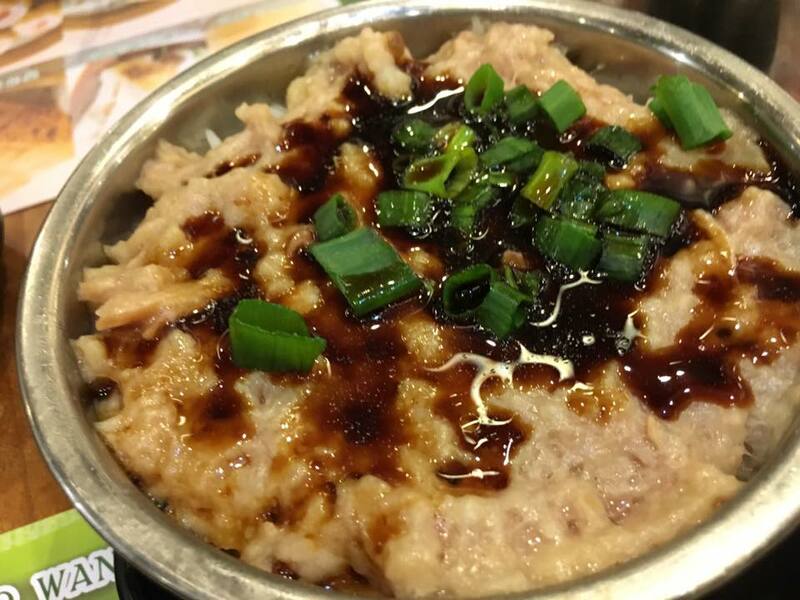 char siew was more moist than the even worse one at fu kee congee 富记粥品, but equally tasteless. & the roast meat had rubbery skin. 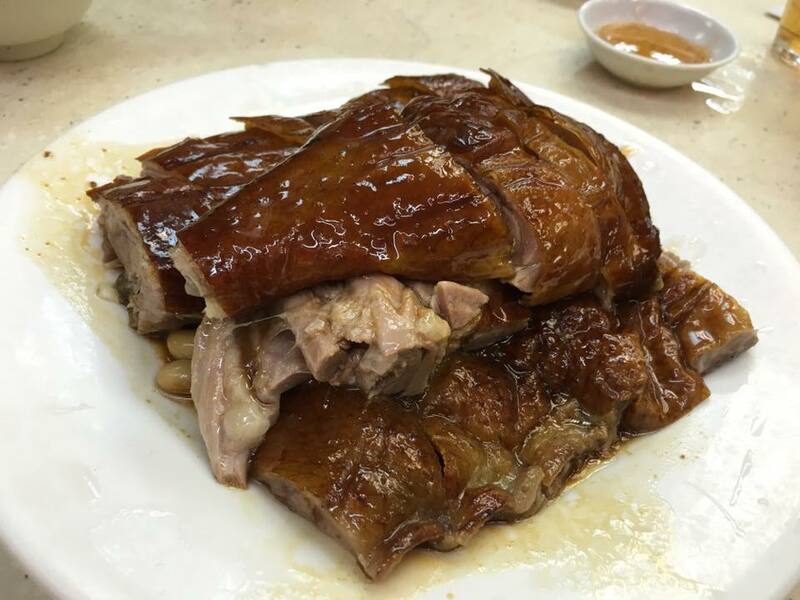 any, i meant any, coffeeshop, hawkerstall char siew & siew yoke in Singapore are better than these. 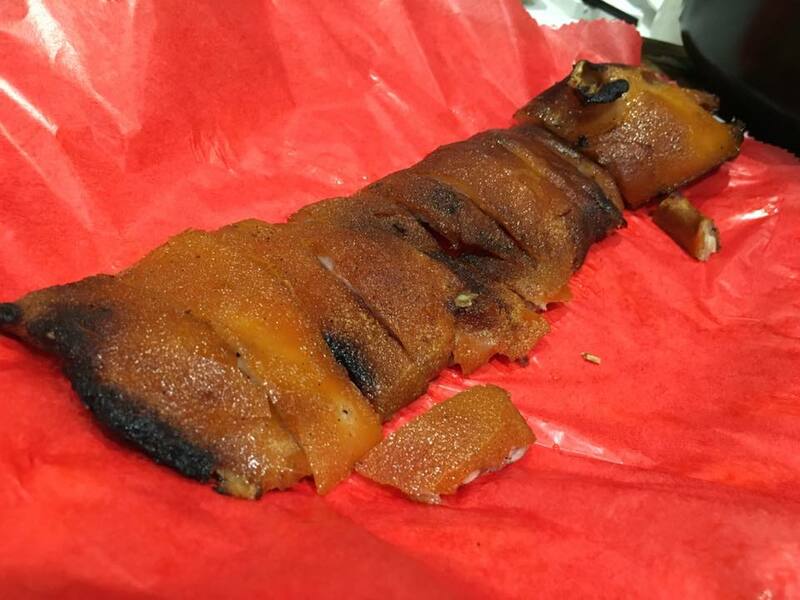 totally convinced me never to order char siew in hong kong. 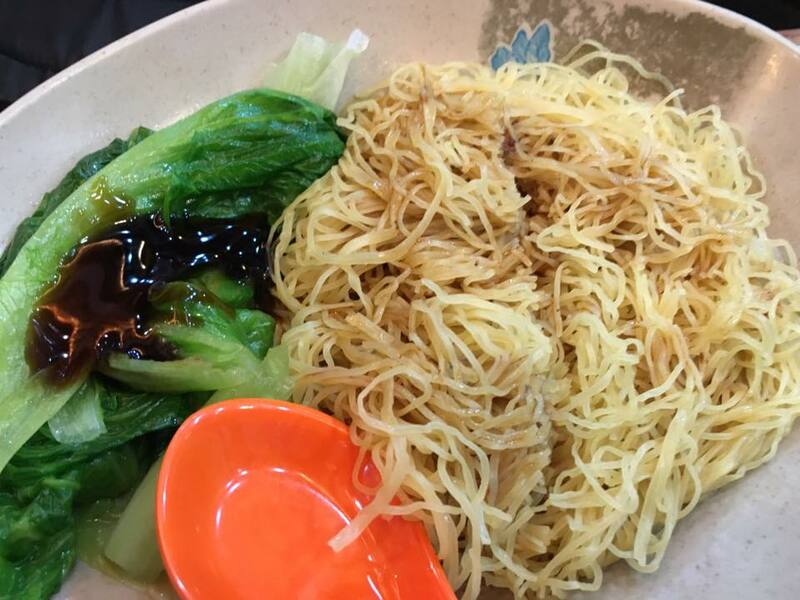 dry egg noodles was HK$25 – steep! we ordered 2 soup flat noodles also. 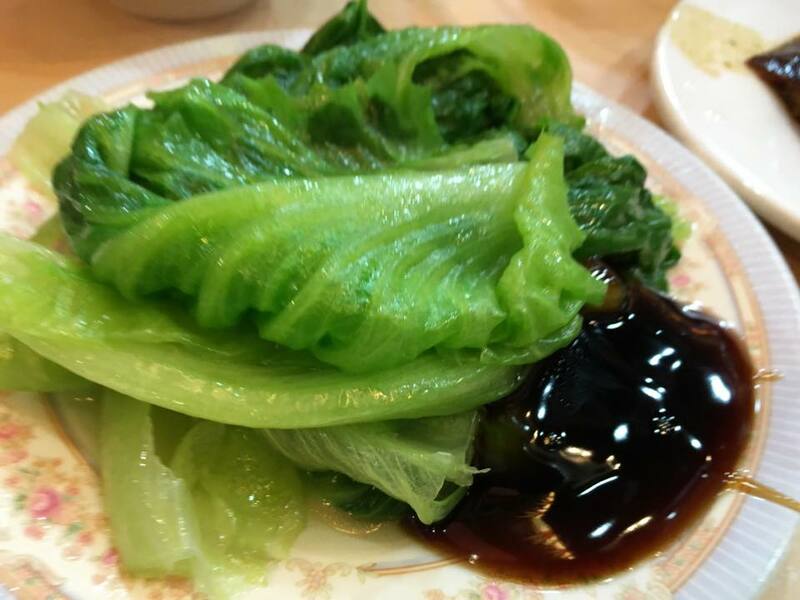 lettuce was such a tiny portion enough for 1pax. 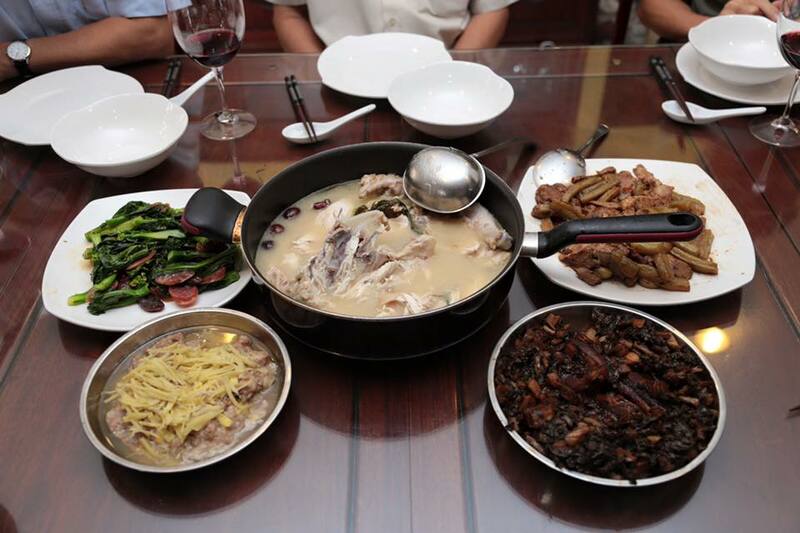 the whole lunch came to about HK$650, expensive for the food we had & also a very poor overall dining experience. 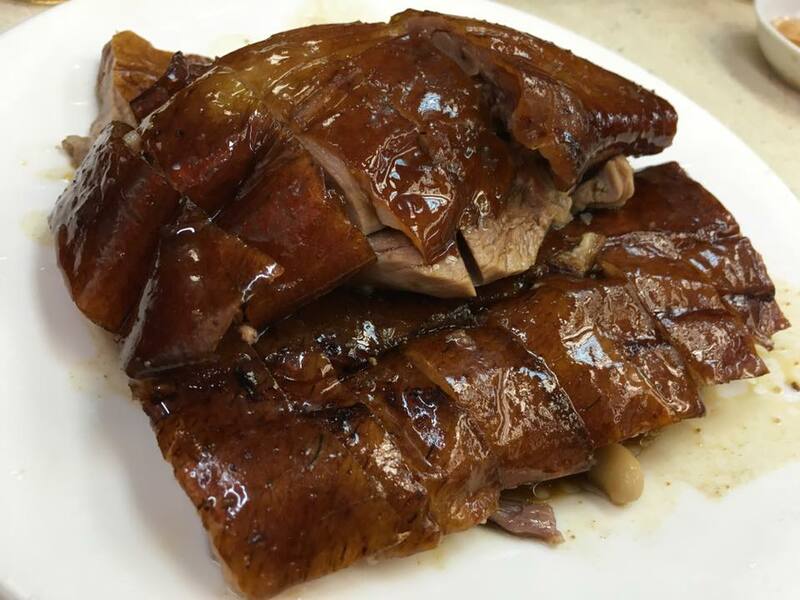 i think yat lok 一乐 roast goose is still one to try if you are 2-3pax party & order only roast goose & some dumplings like we did last time. 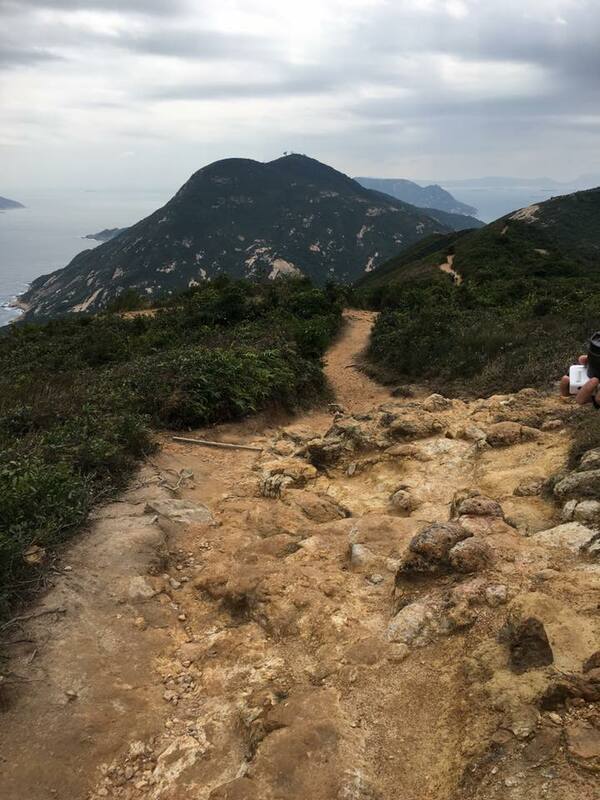 after lunch, we walked to the mid-level escalators to go to central ferry to go cheung chau for a very next late afternoon island hike. on 10.1.2016 the day we arrived, it started to rain in the late evening just when we kena abducted & fed a forgettable dinner at tai yun 泰源. how can we be so unlucky? the lowest rainfall in the whole year in january & we ran smacked with a north east monsoon blowing over. 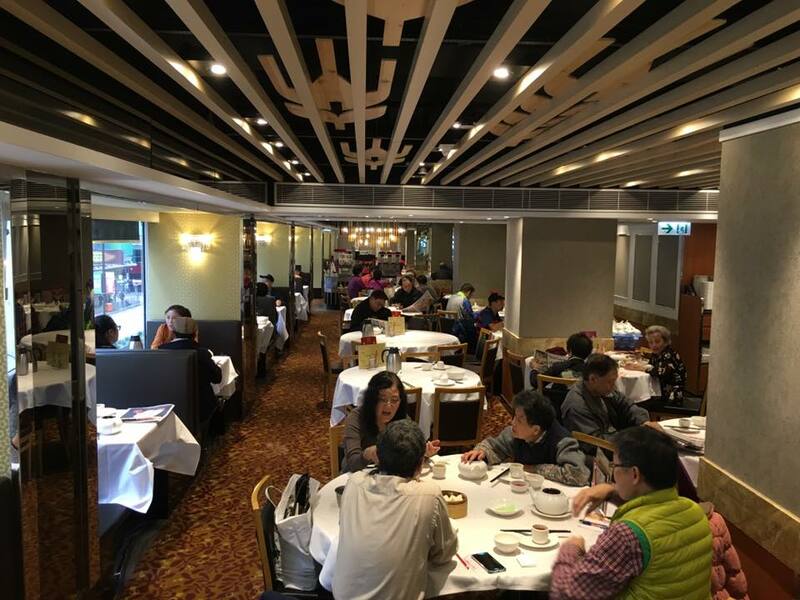 the next day we had planned to meet 830am at central to go up to victoria peak太平山, but it was again raining so we had to switch to wet weather program & met at our hotel royal plaza instead. there was no queue but still a good crowd at 9.30am. 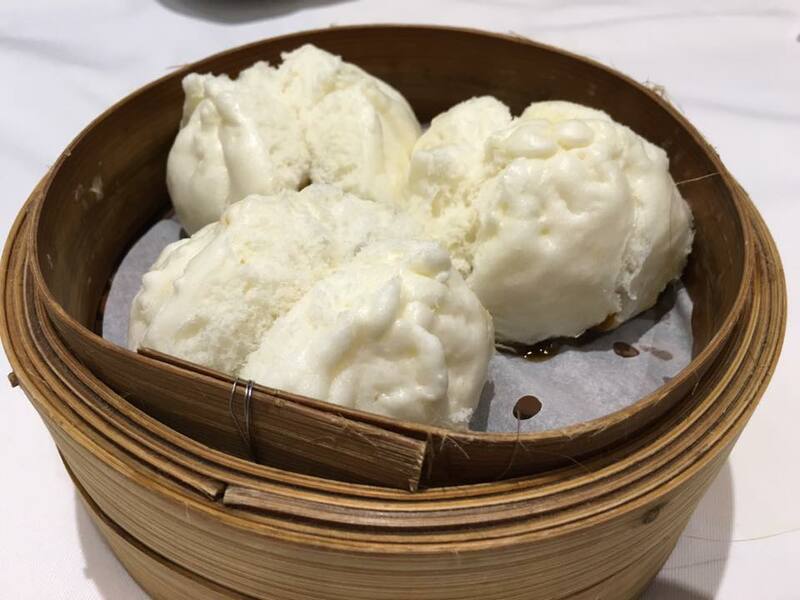 we liked have a dimsum feast! maybe 25 items or more? forgot count but many items we ordered double. 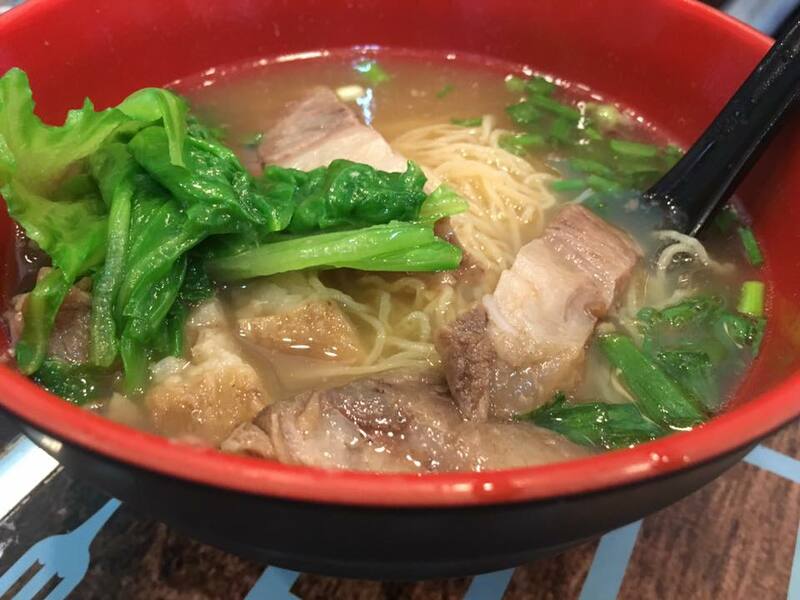 anyway we ordered mostly from the before 11am specials priced at HK$8 & HK$9. 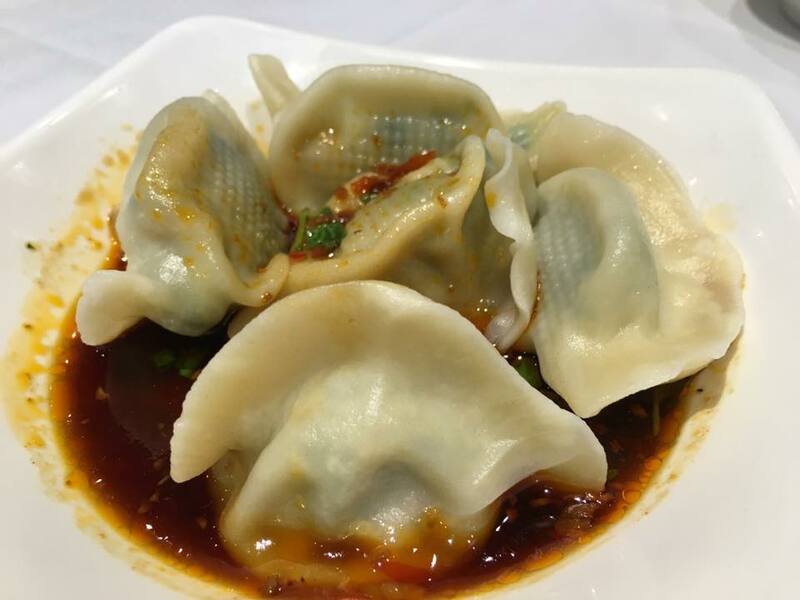 spicy chives dumplings were good. not were name of the rolls..not my favourite. 炸两 was perfect. 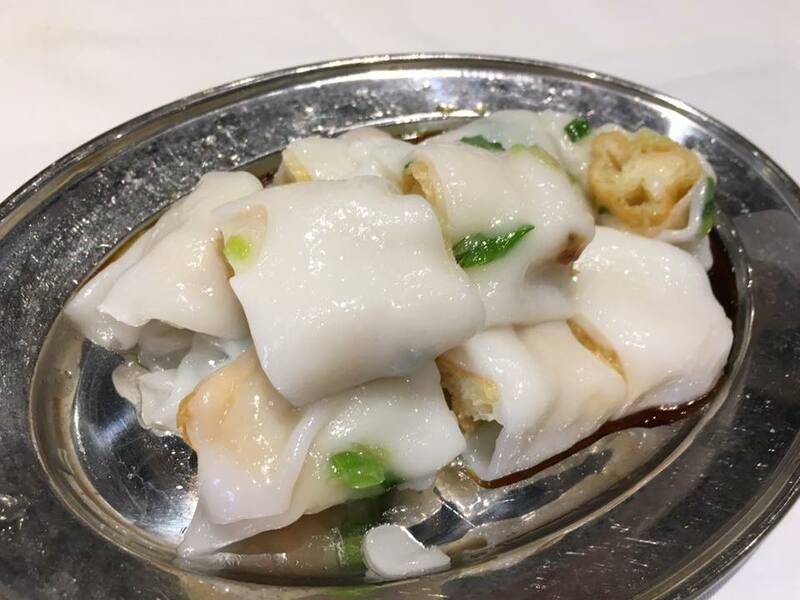 not my favourite fun cheung 粉肠but the 油条were great not like the hard like stone ones in singapore for this dish. steamed pork ribs were good. 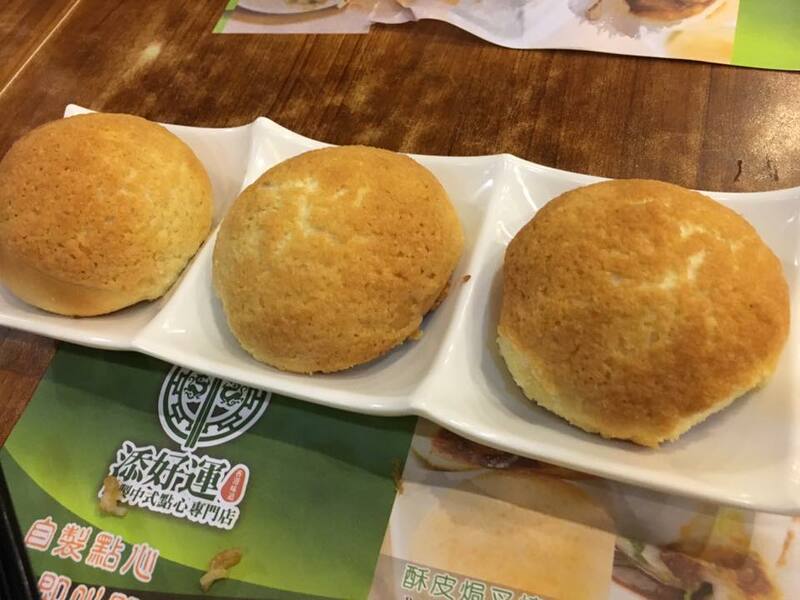 lots of yam, less pork.. tim ho wan’s much better! 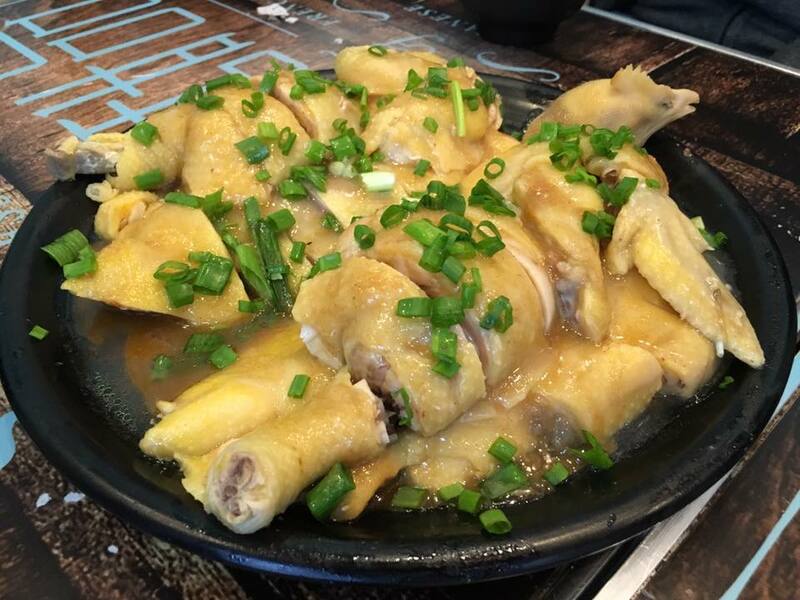 steamed chicken feet also competent. 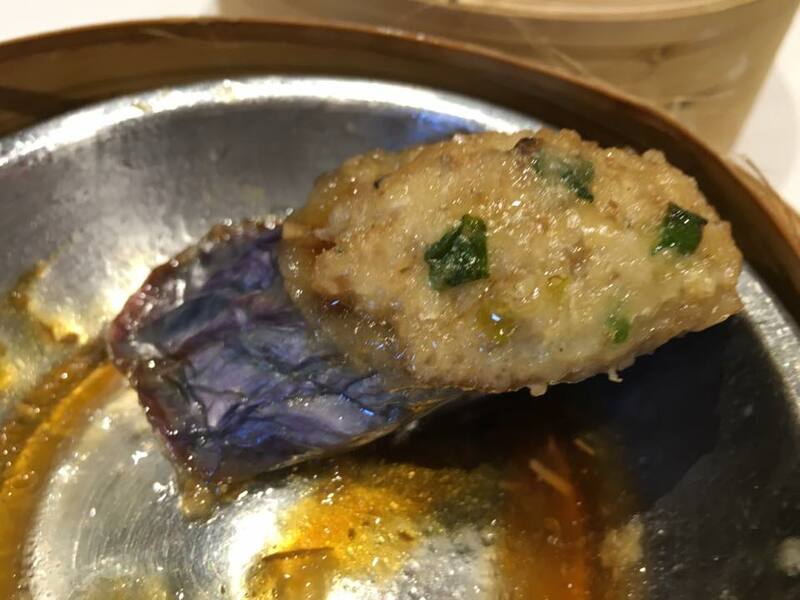 i don’t fancy fried fupeikuin腐皮卷, prefer the steamed version. this was good though. 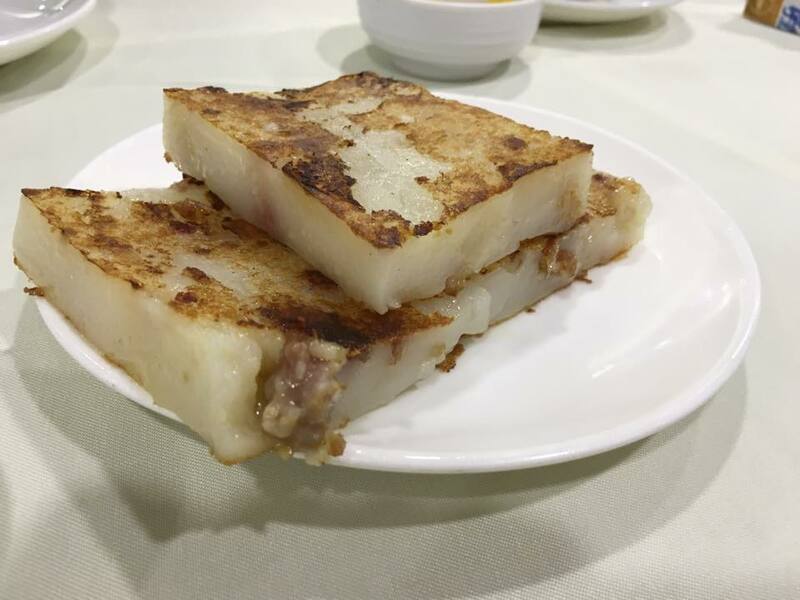 char siew fun cheung叉烧粉肠 was good, very smooth, but maybe not standout. got good ones in singapore these days. 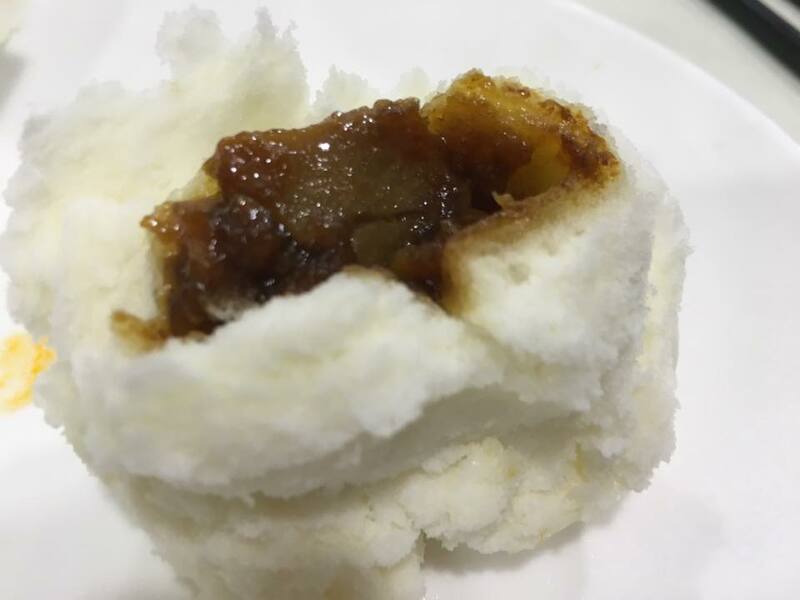 char siew pao was very good. so nice! so tasty! meat not too sweet, overal excellent. 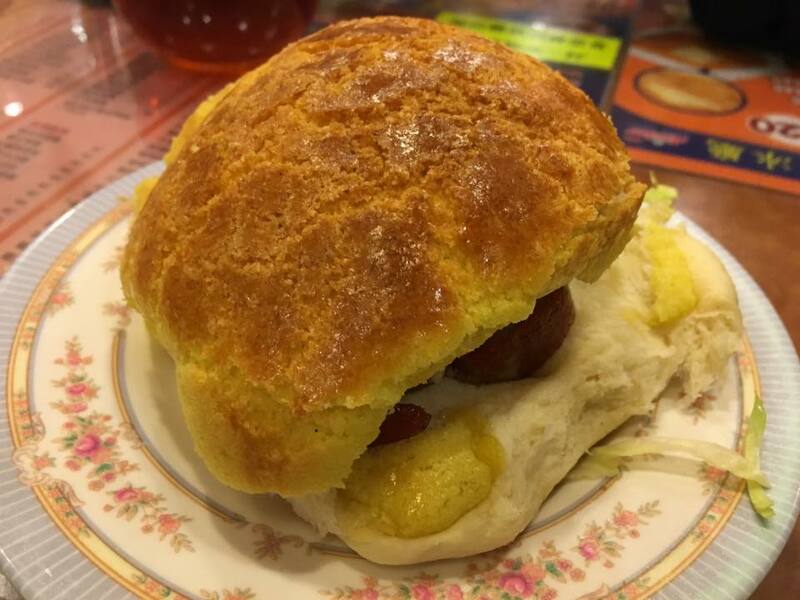 i hardly ever take char siew pao in singapore..lol..this one i took! 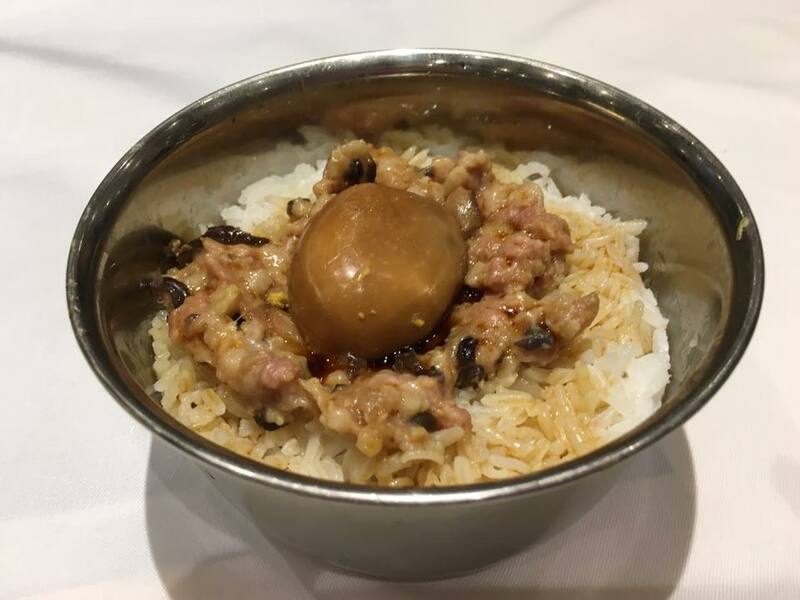 the pork over rice with braised egg, again one of the HK$9 items…抵食到极 tie sek dor kek…. 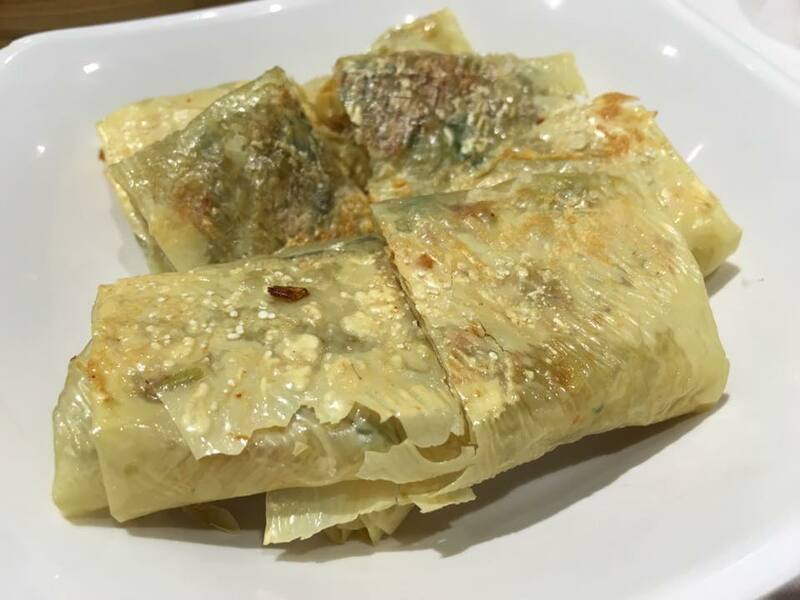 糯米鸡 lomeigai i think normal pricing so should be like HKS24 or more….it’s good! so hoot ah! 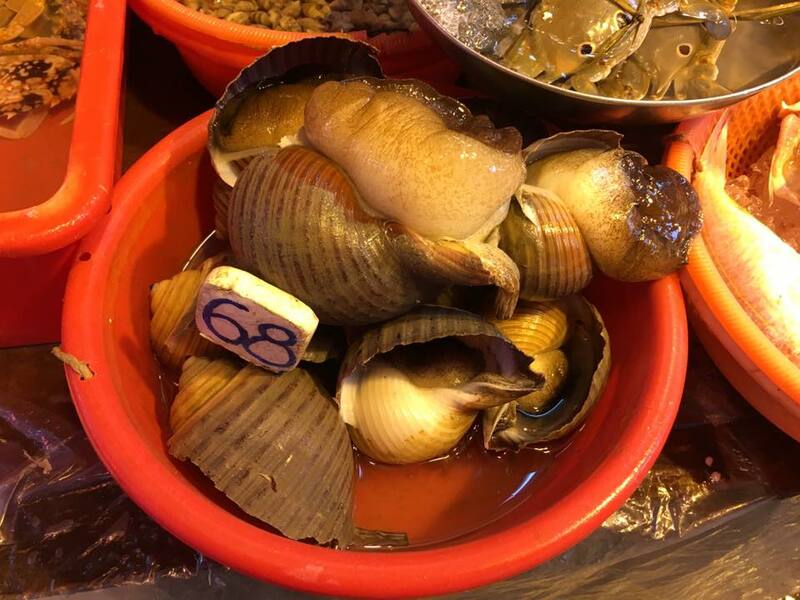 & we had mala cake马拉糕 . this like lots of hong kong people like. i guess it’s quite tasty ka..but not a “dessert” i need. ginger cake was good too. seldom see this so had some uniqueness value. overall the humongous breakfast cost us HK$380 for 6pax=S$12 each. great thing was as we left the restaurant, rain had stopped & weather was fine throughout the days.